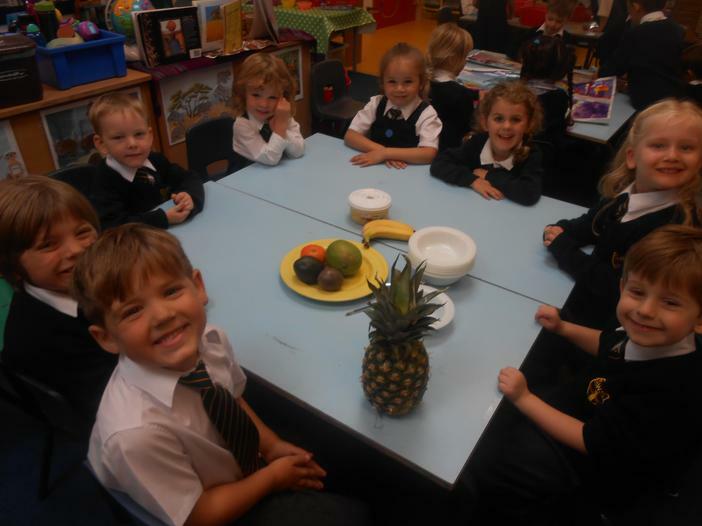 Welcome to our class page! 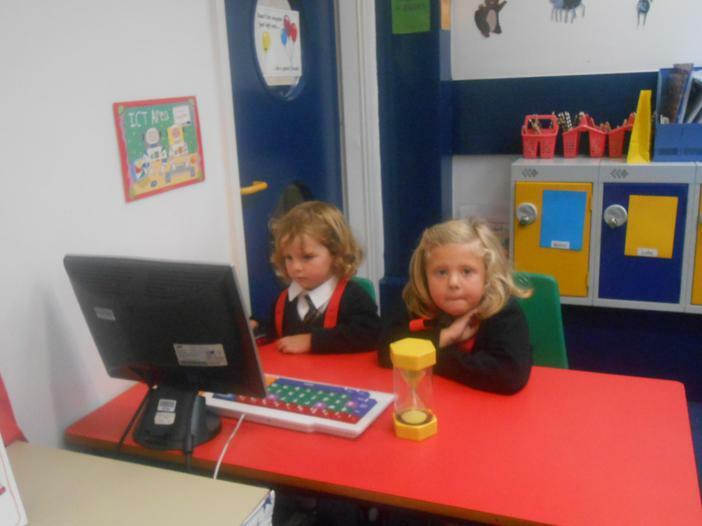 Please check back here from time to time for updates about our learning. 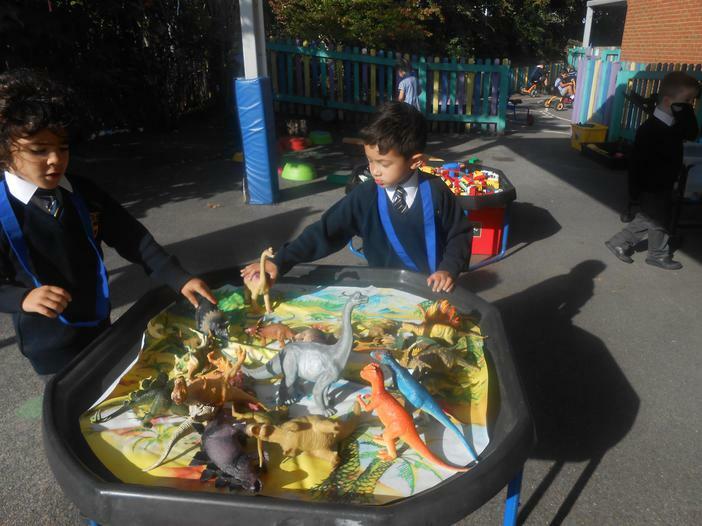 Mrs Kassiri is the class teacher and Mrs Charles is the teaching assistant. 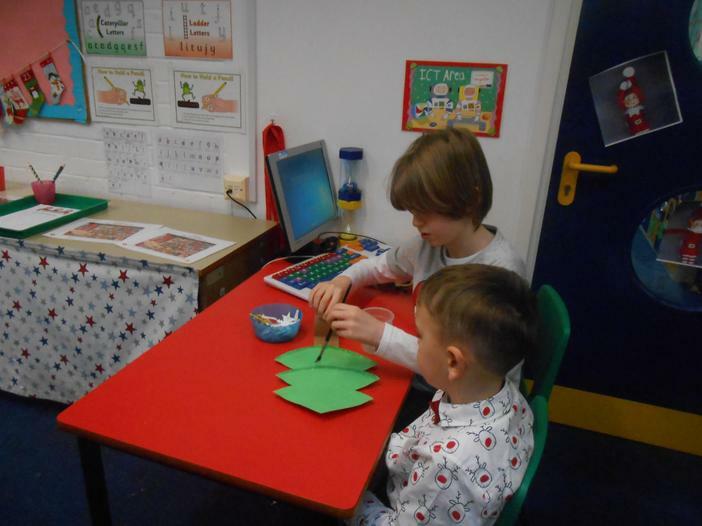 Mrs Molyneux also works in our class from Wednesday to Friday. 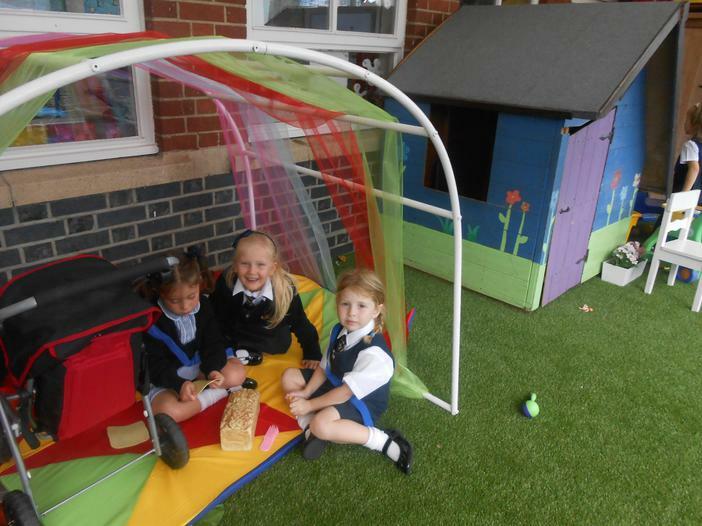 We are looking forward to a fun year full of learning, friendships, happy times and new experiences! 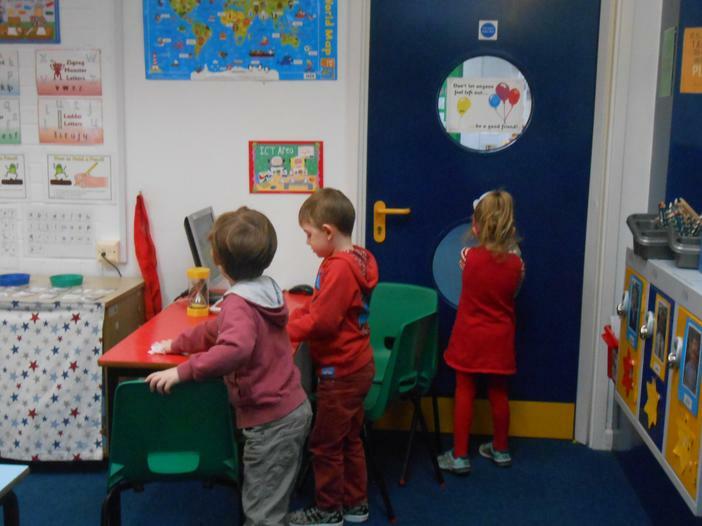 If you ever have any questions or concerns, our door is always open. 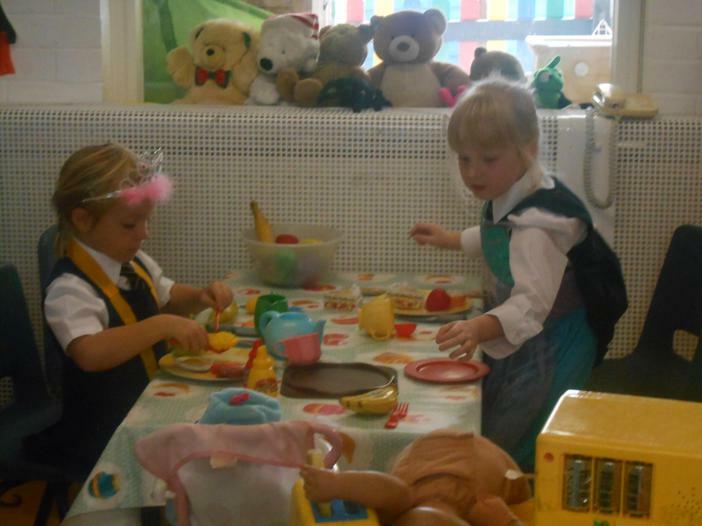 We look forward to working alongside you as parents to give your child a fulfilling and happy first year at school. 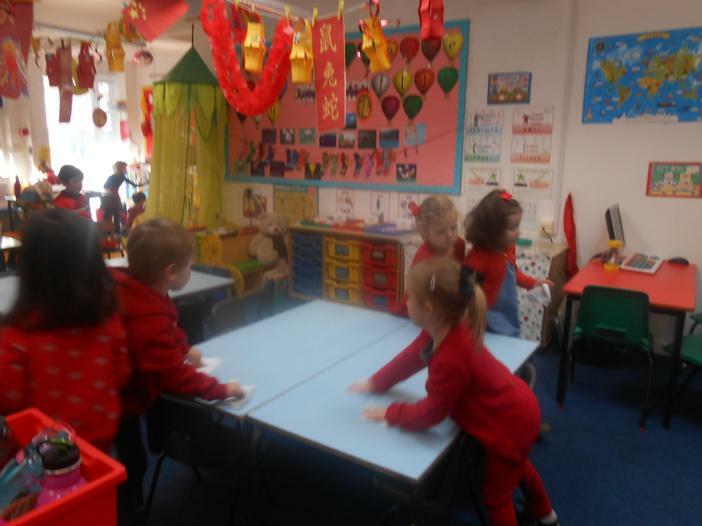 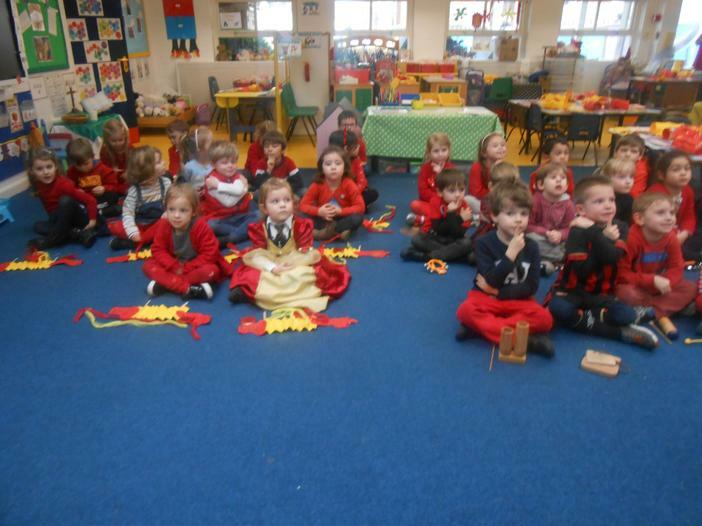 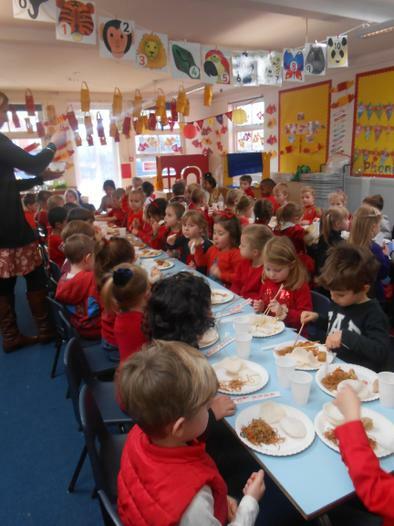 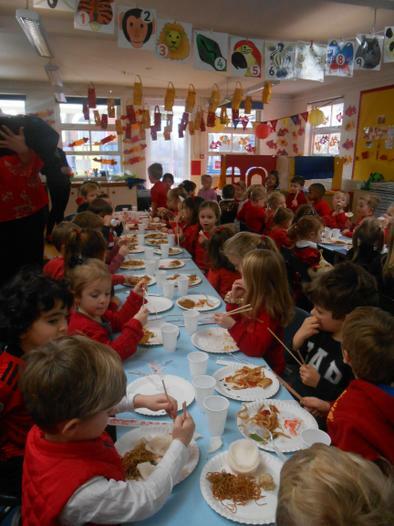 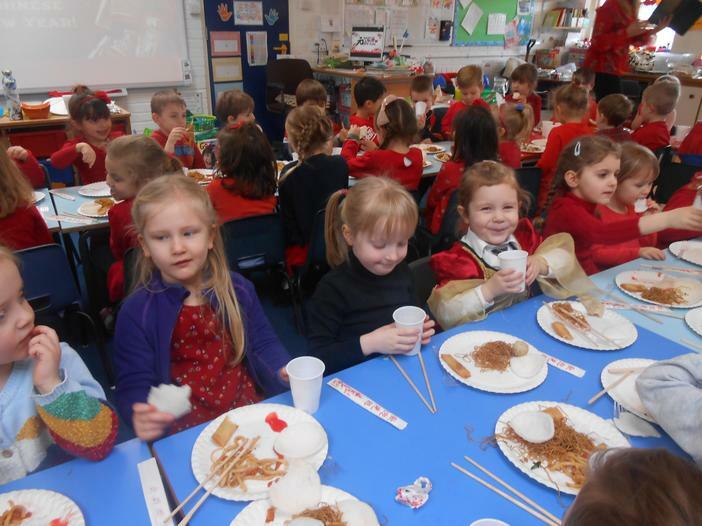 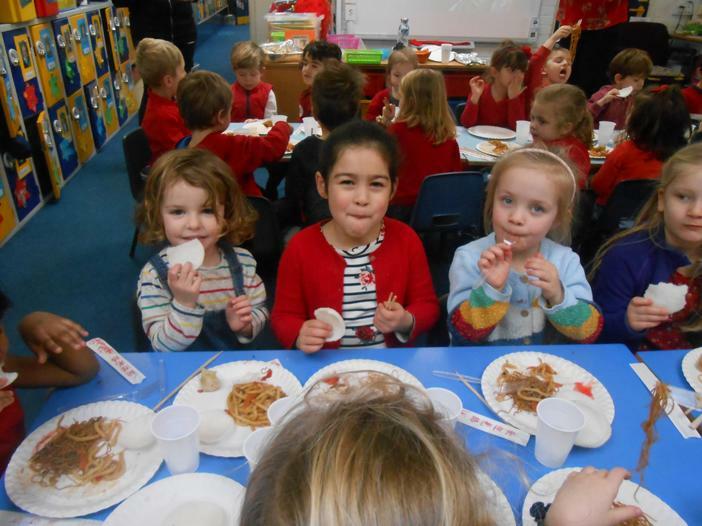 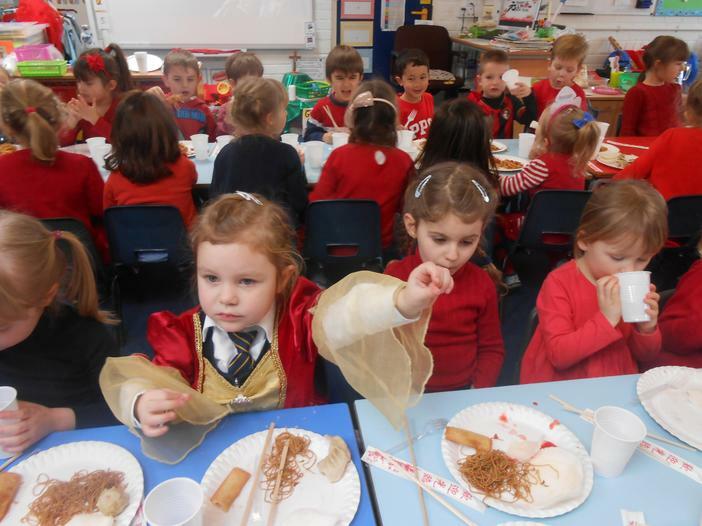 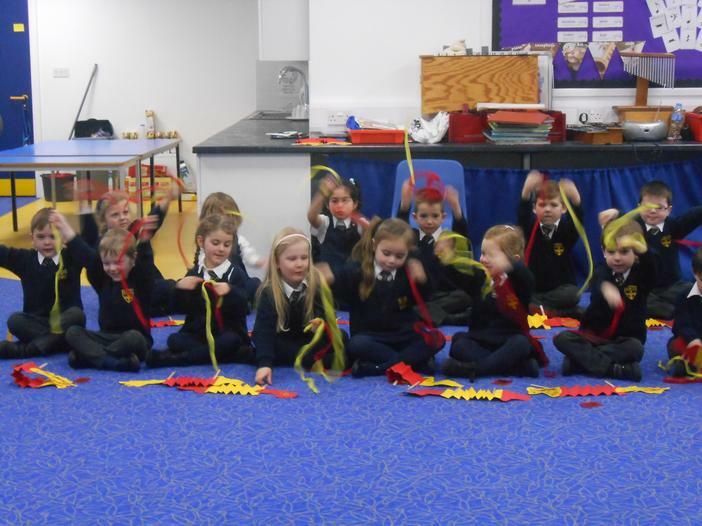 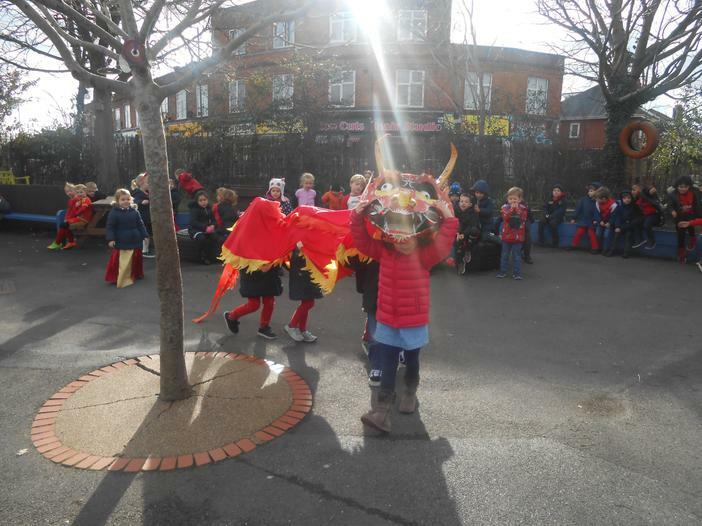 We have really enjoyed our topic learning about the Chinese New Year celebrations! 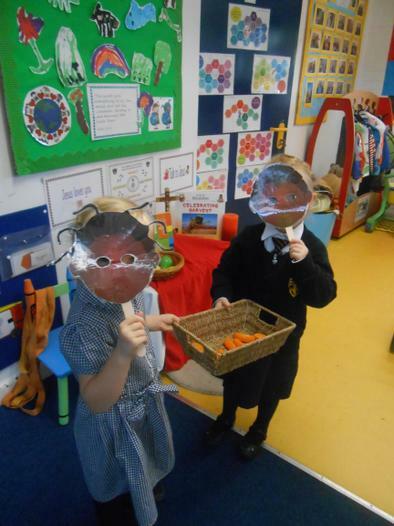 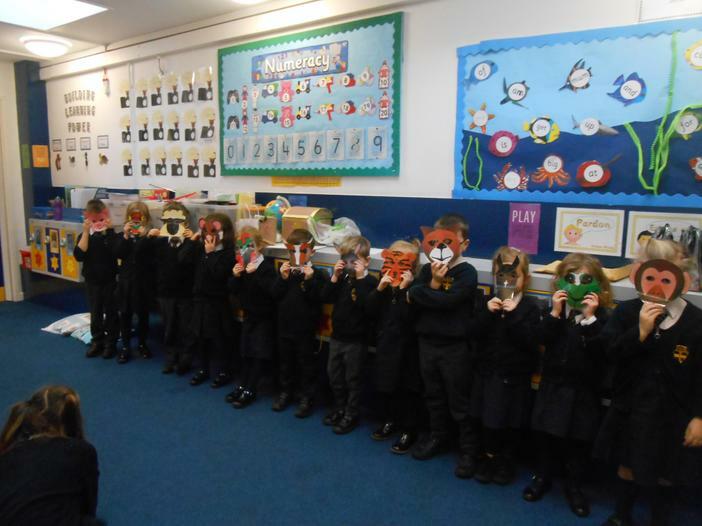 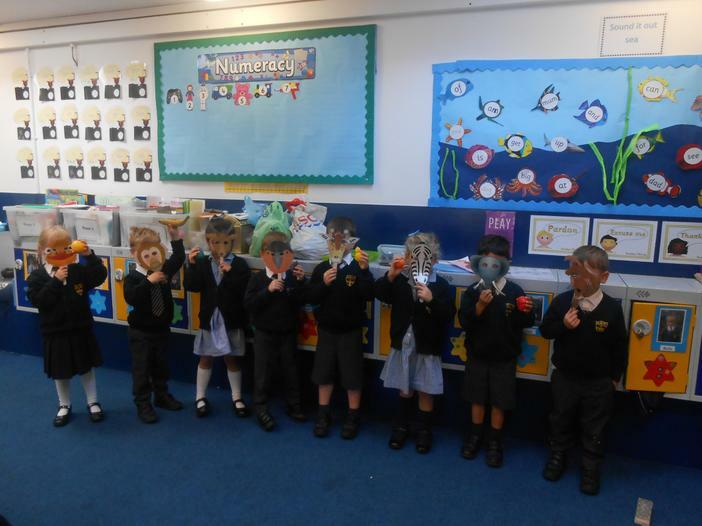 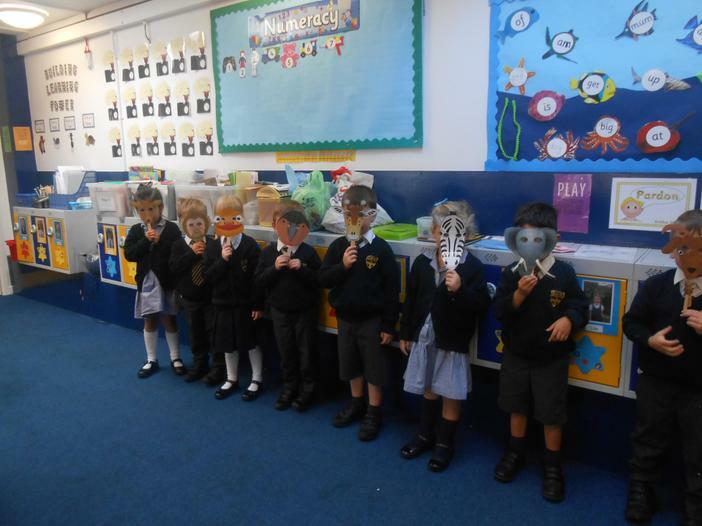 We acted out the story of the Chinese Zodiac and learnt what animal year we were born in. 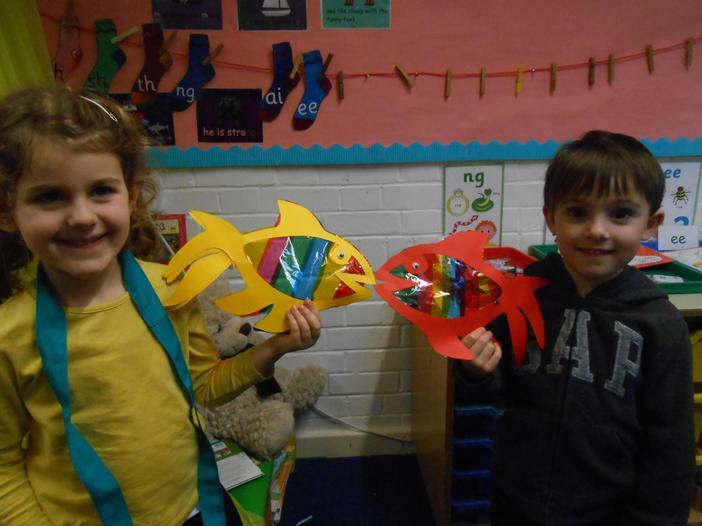 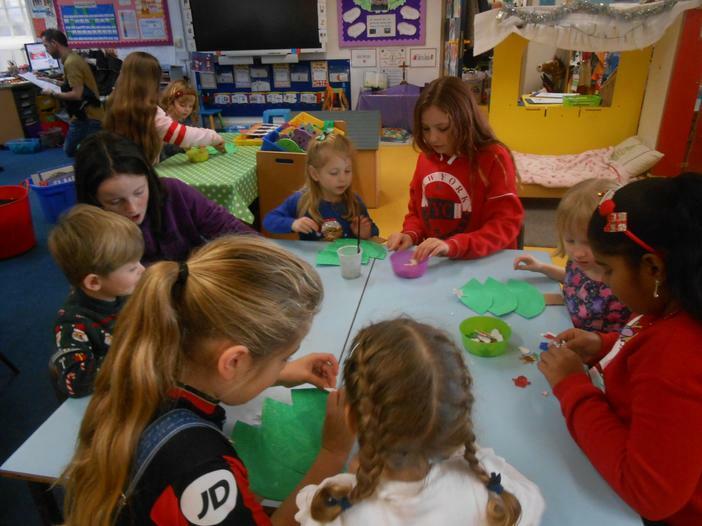 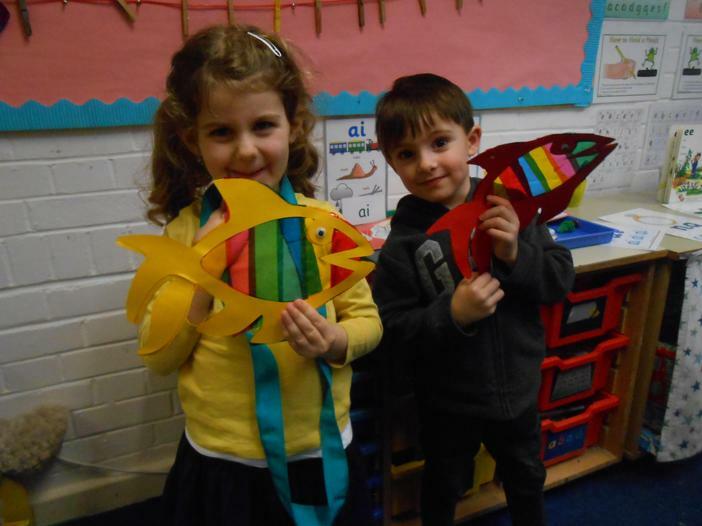 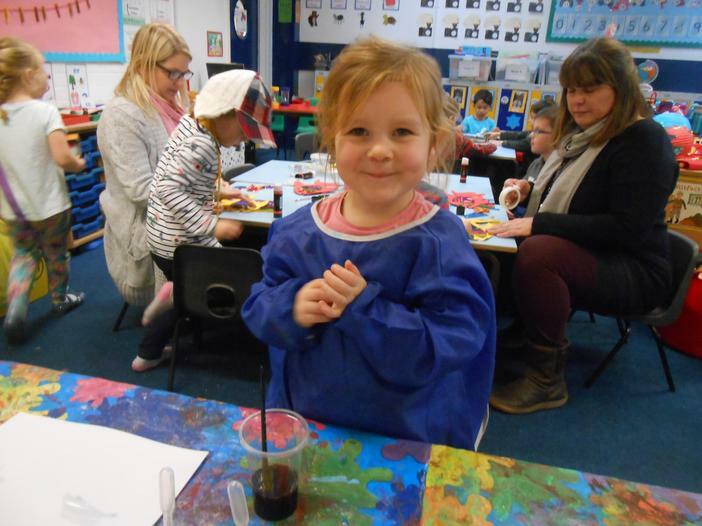 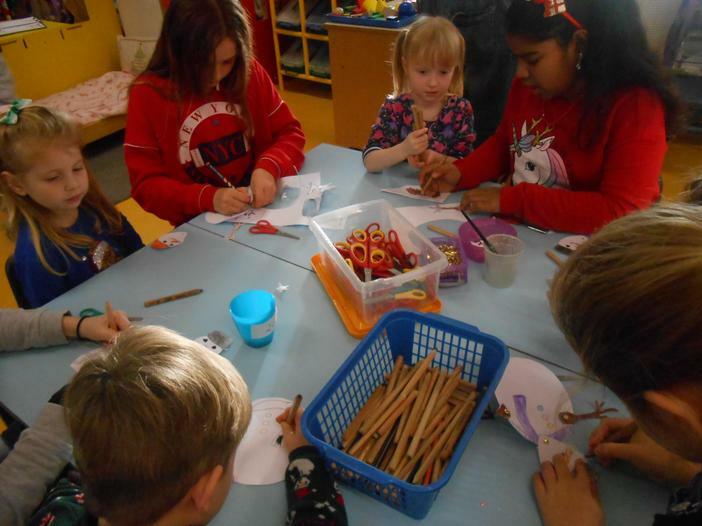 We made lots of lovely arts and crafts including dragon puppets, Chinese lanterns, rainbow fish sun catchers and dragon masks. 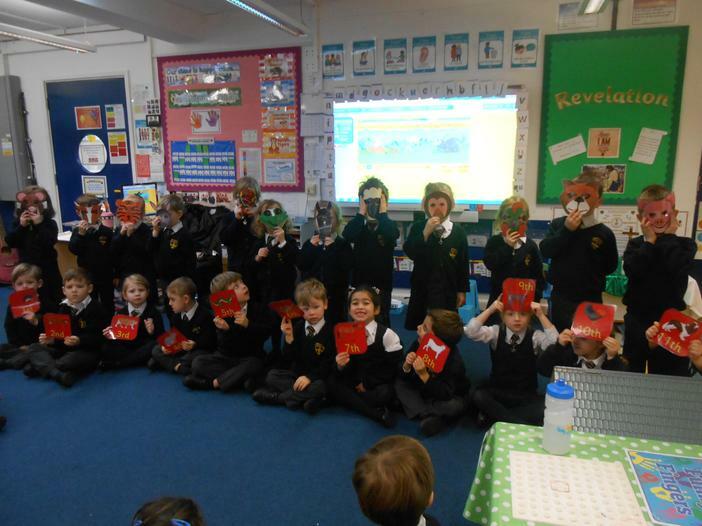 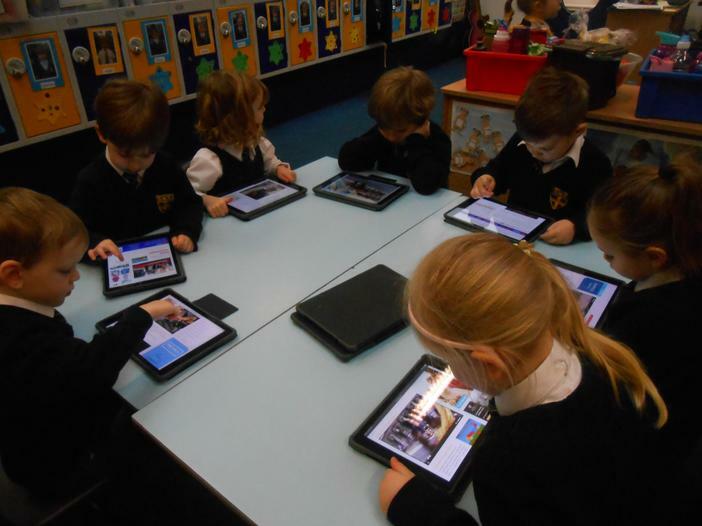 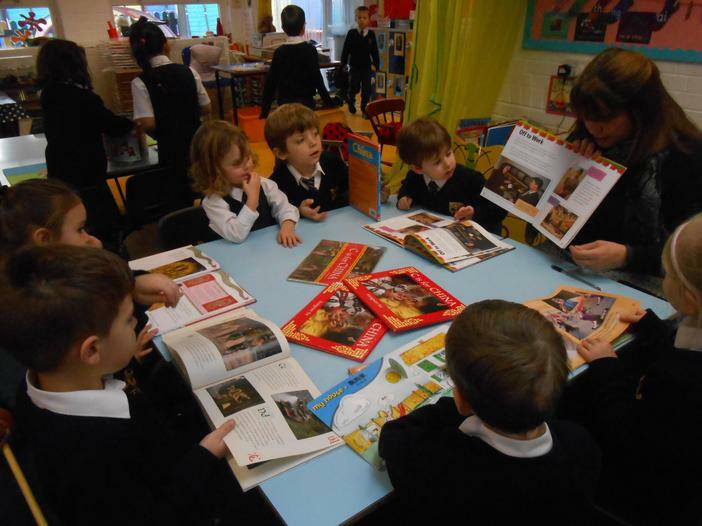 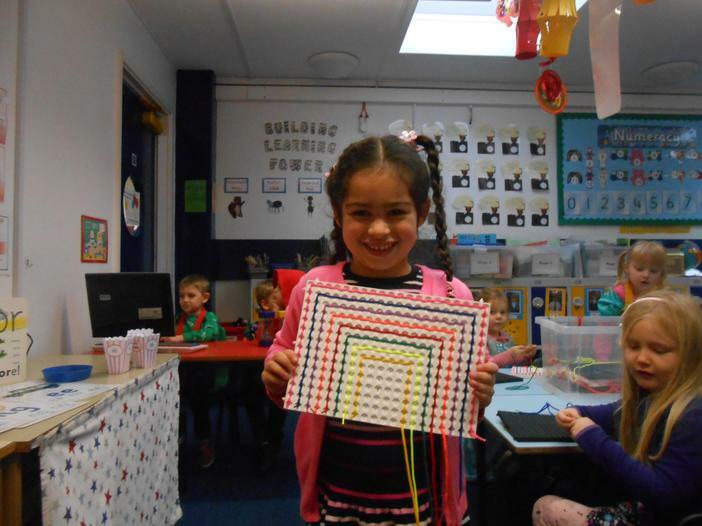 We also found out facts about China and the new year celebrations in books and on the internet. 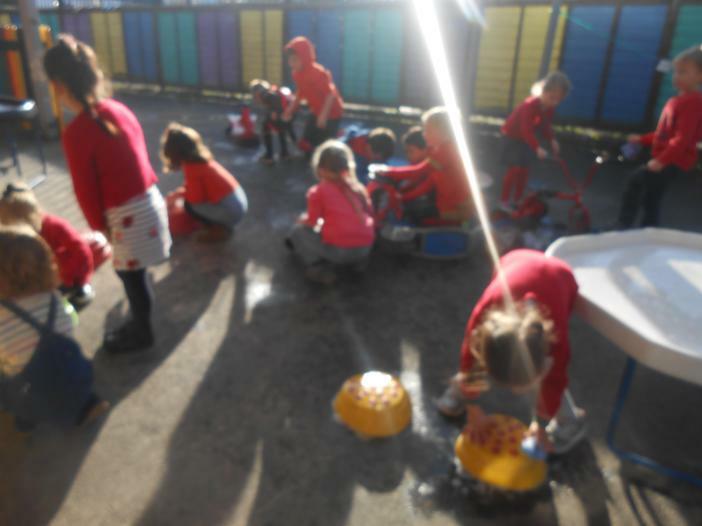 Our highlight was our party day! 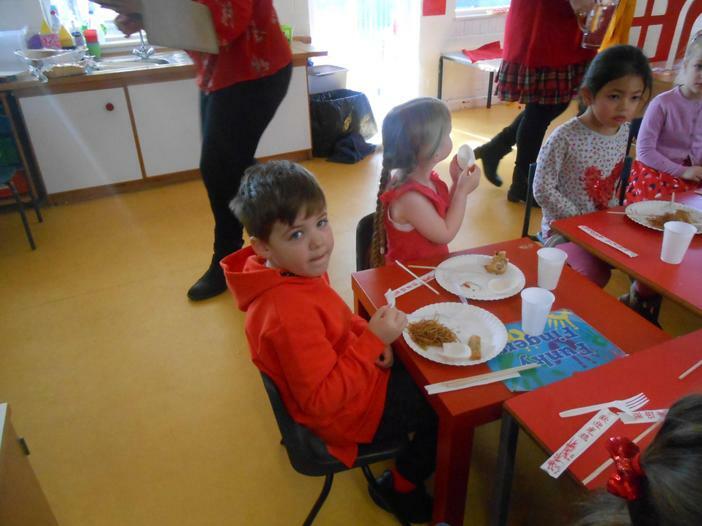 We all looked fabulous in red! 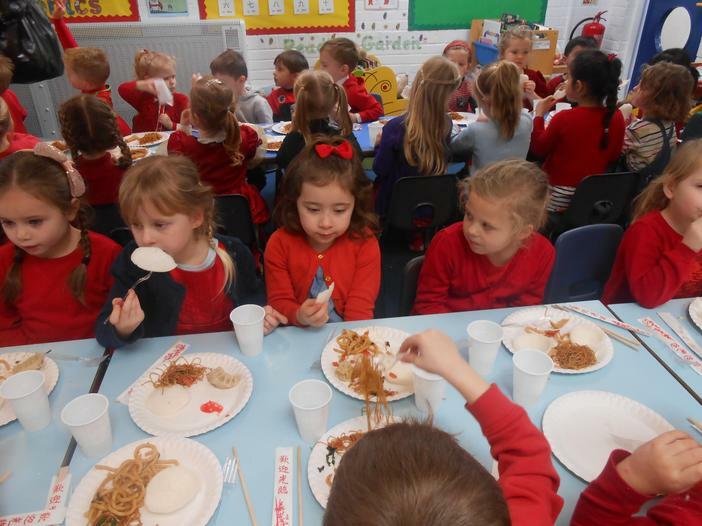 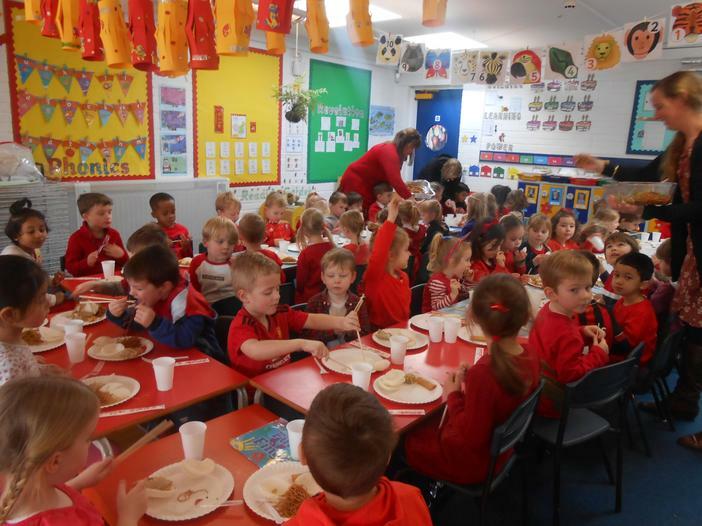 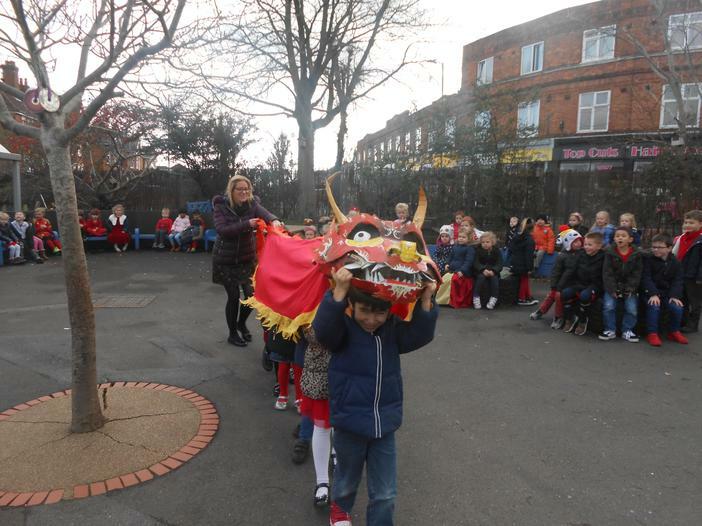 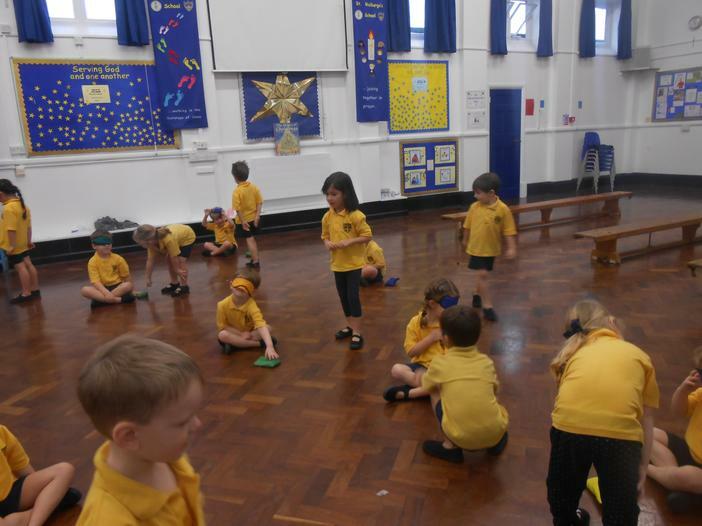 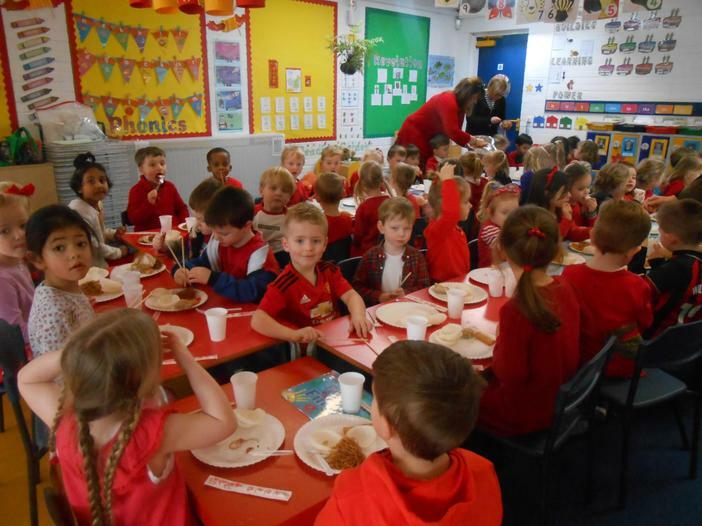 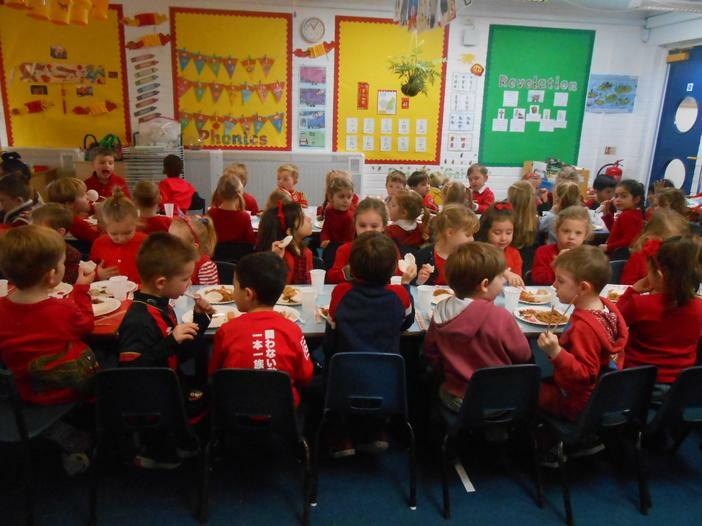 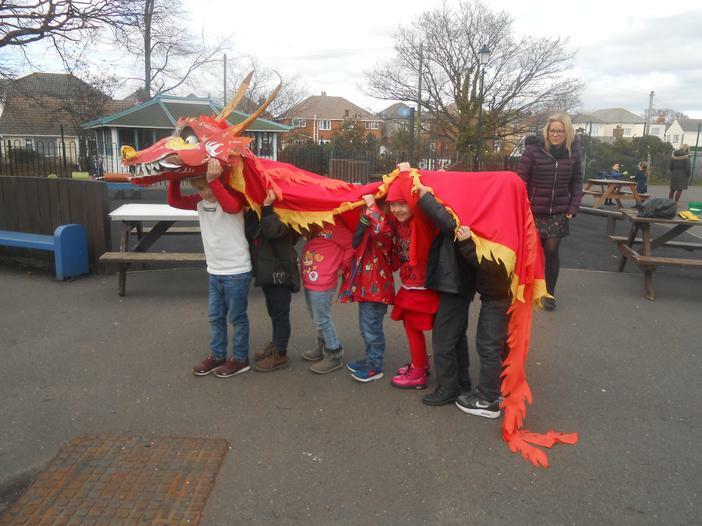 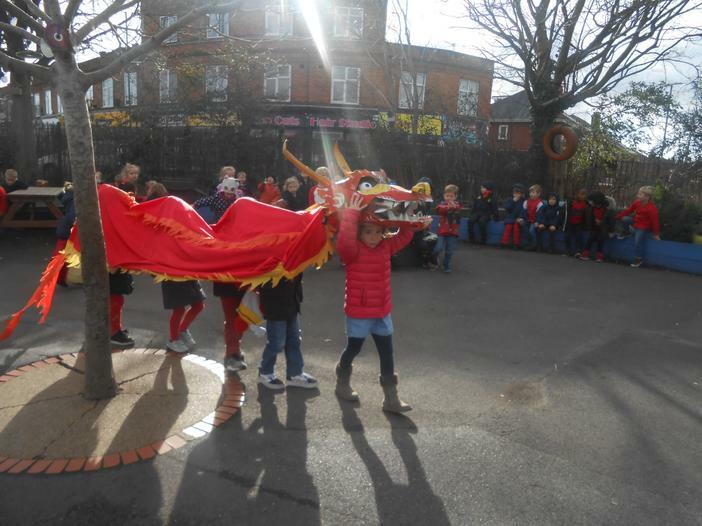 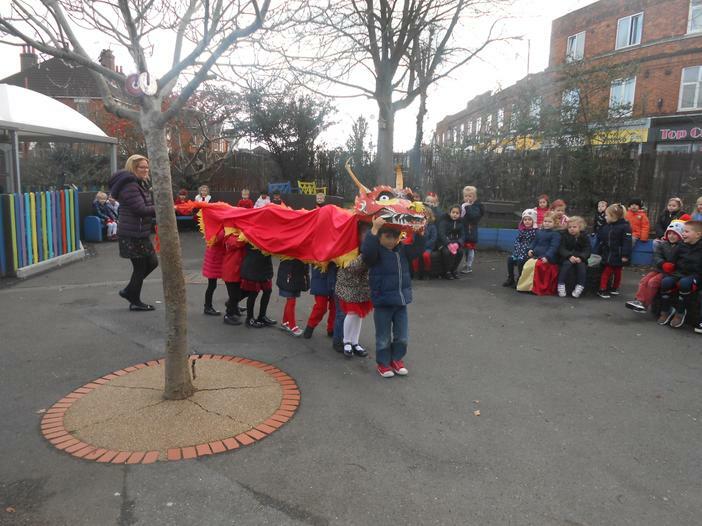 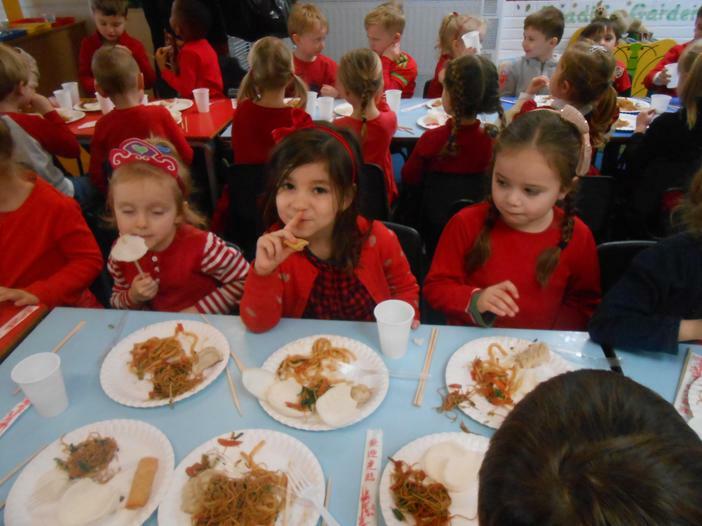 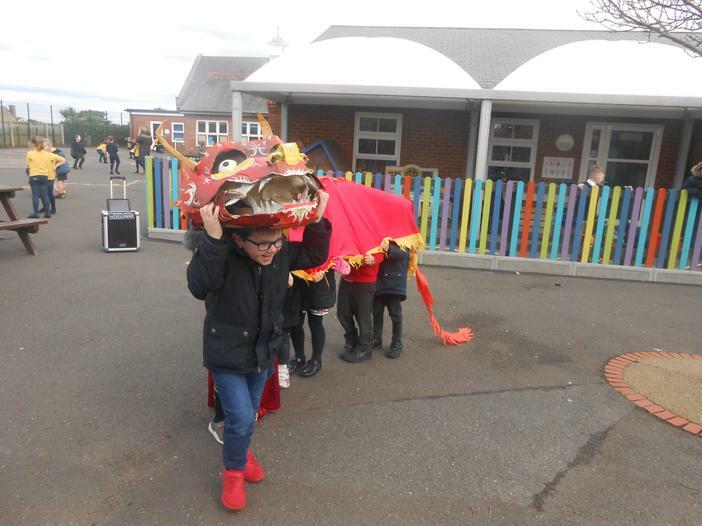 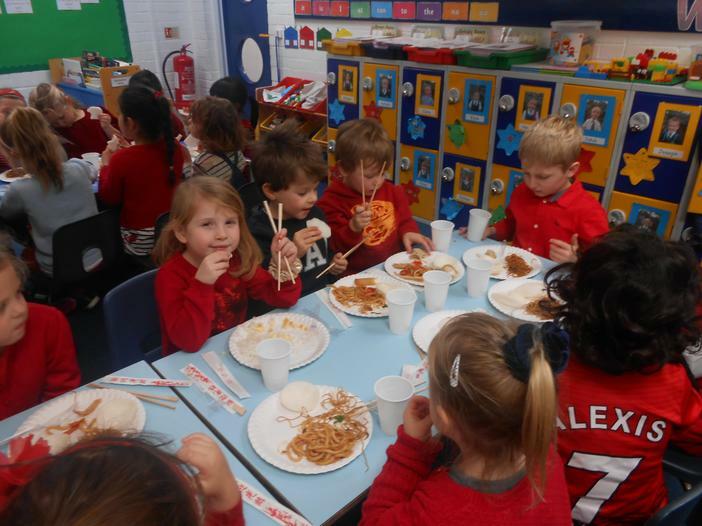 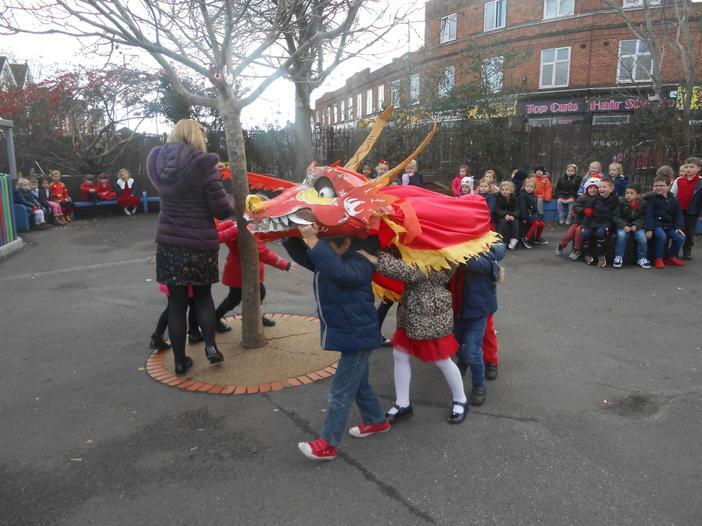 We enjoyed the Chinese food, played traditional Chinese playground games, did a dragon dance and enjoyed performing a song to our parents and showing them all our work. 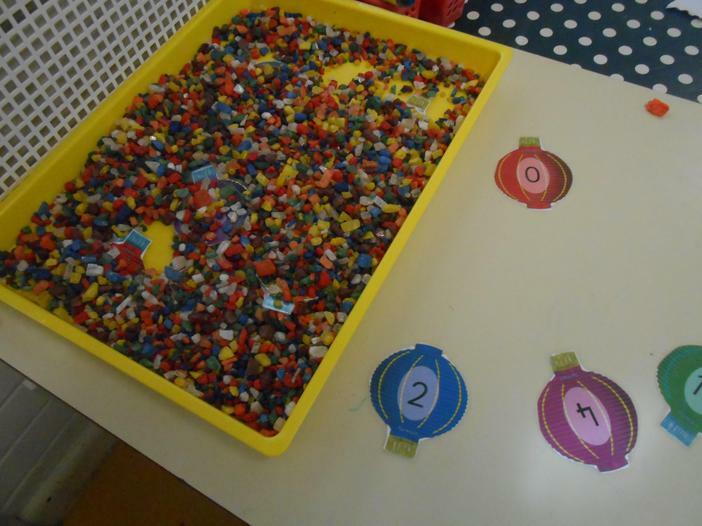 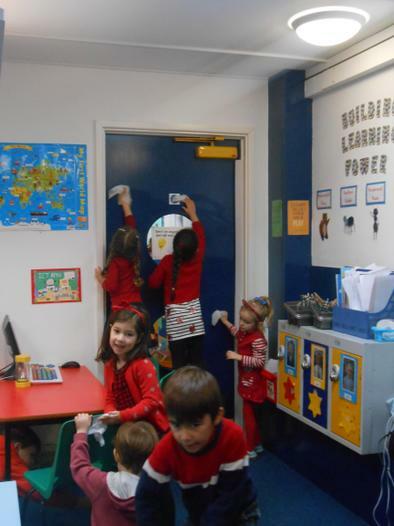 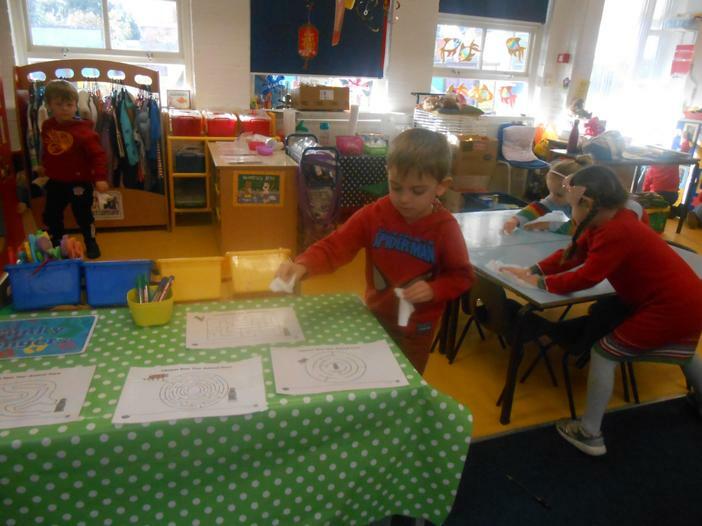 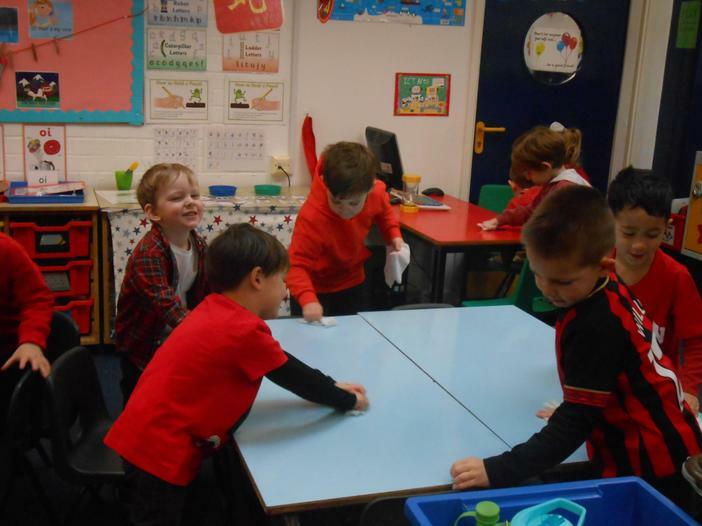 We also cleaned our classroom to clean away the bad luck and welcome in the good luck! 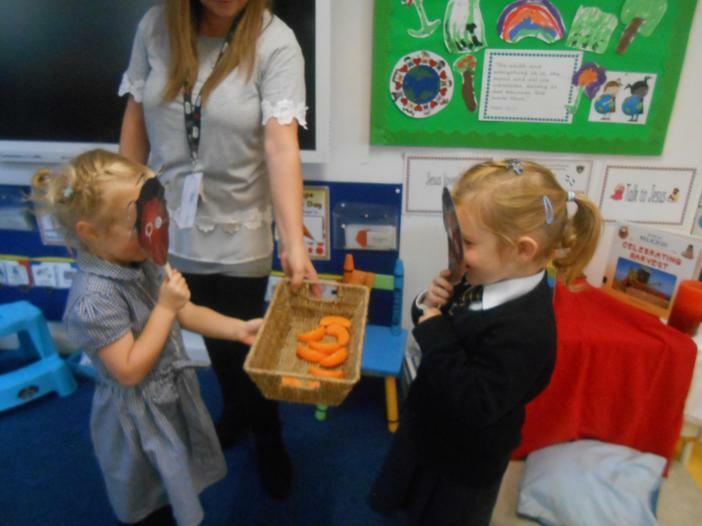 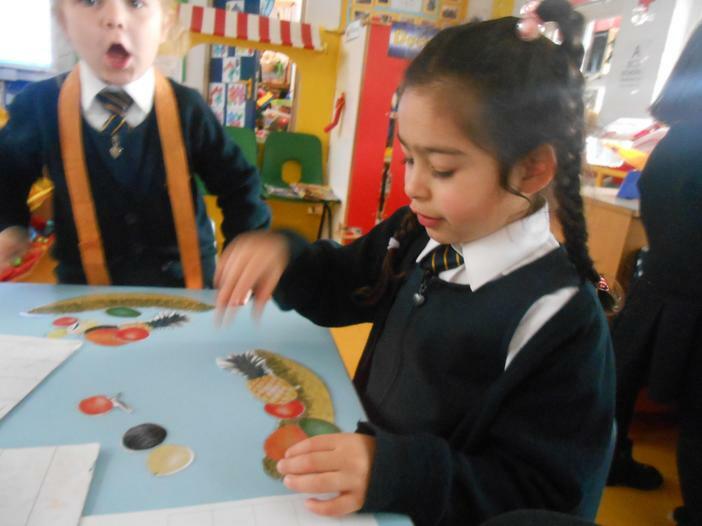 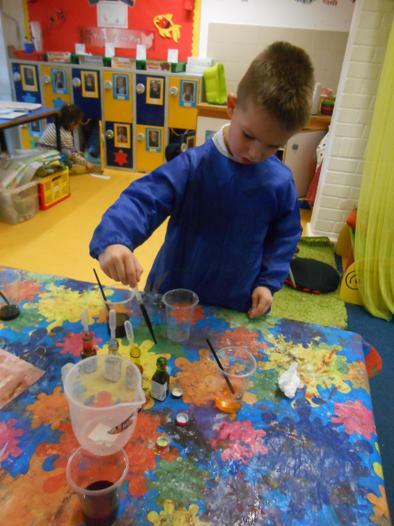 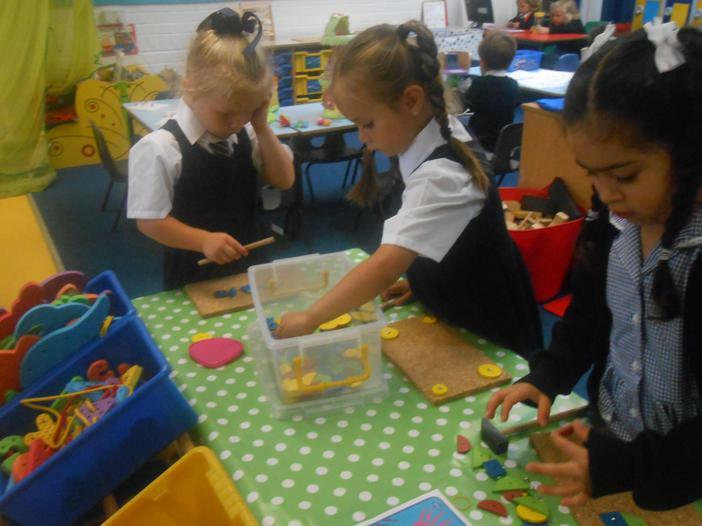 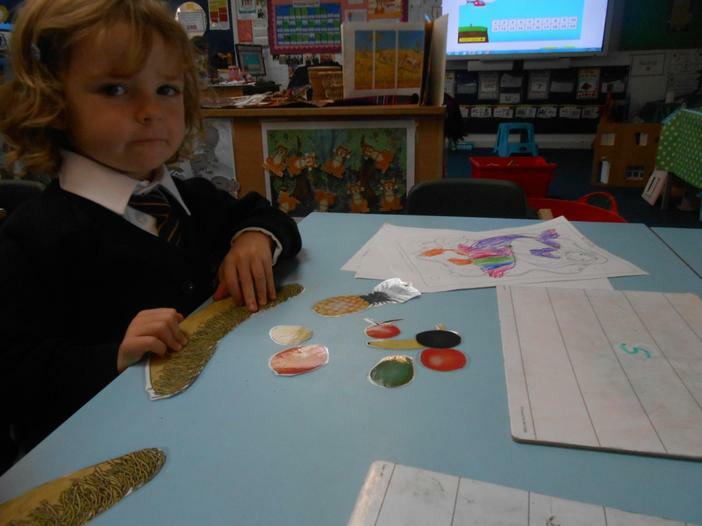 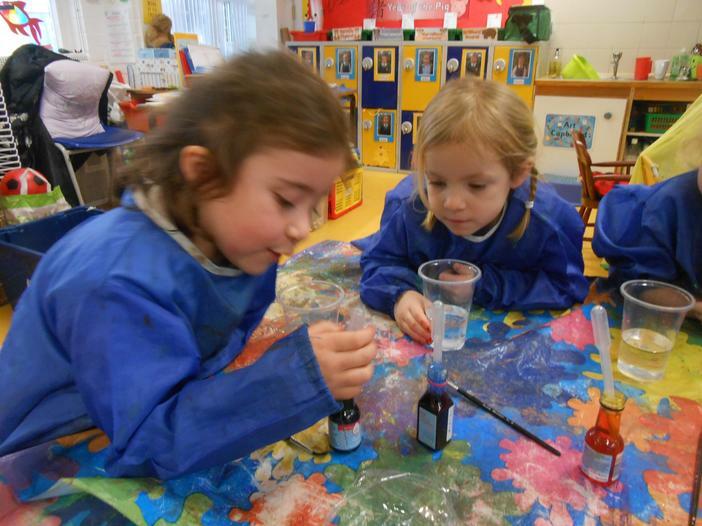 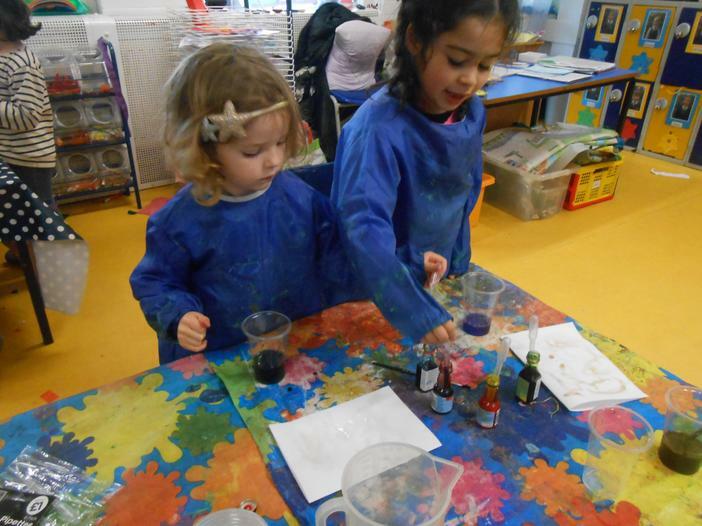 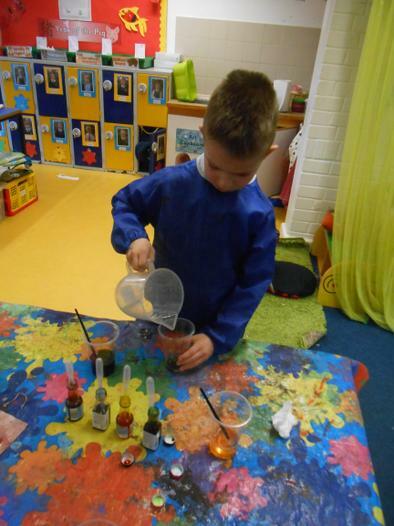 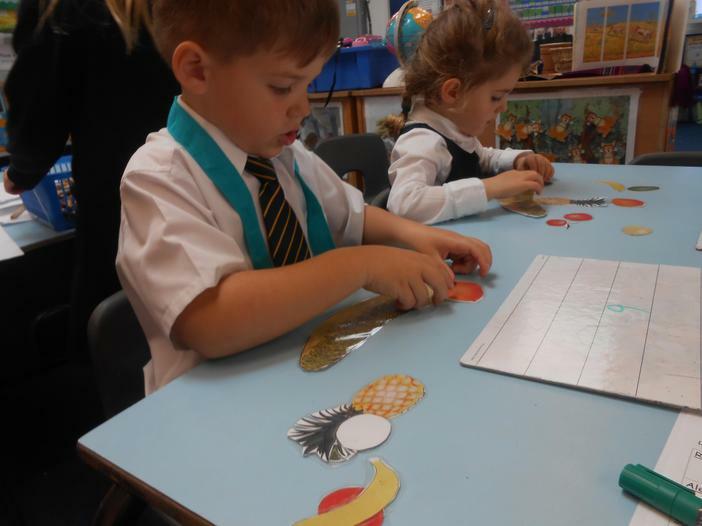 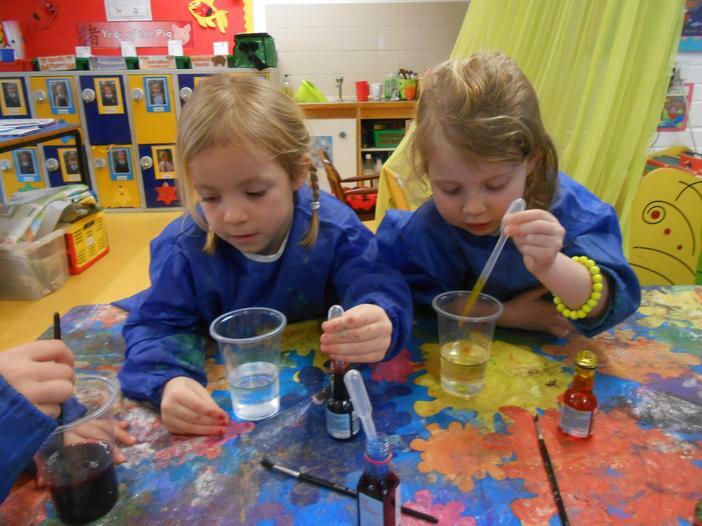 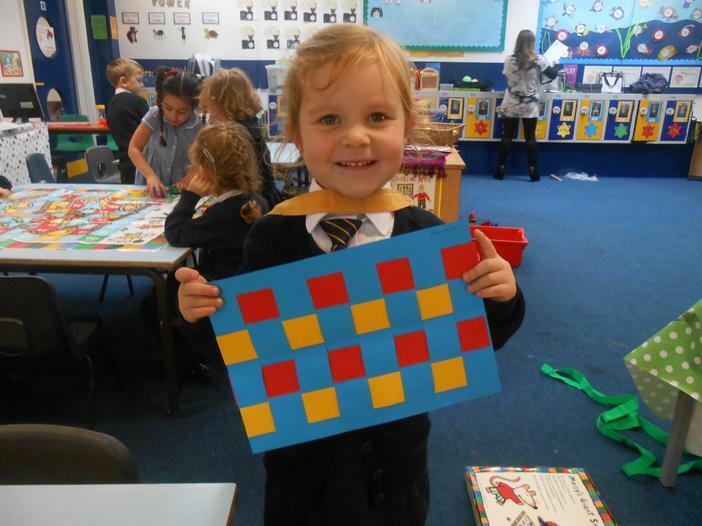 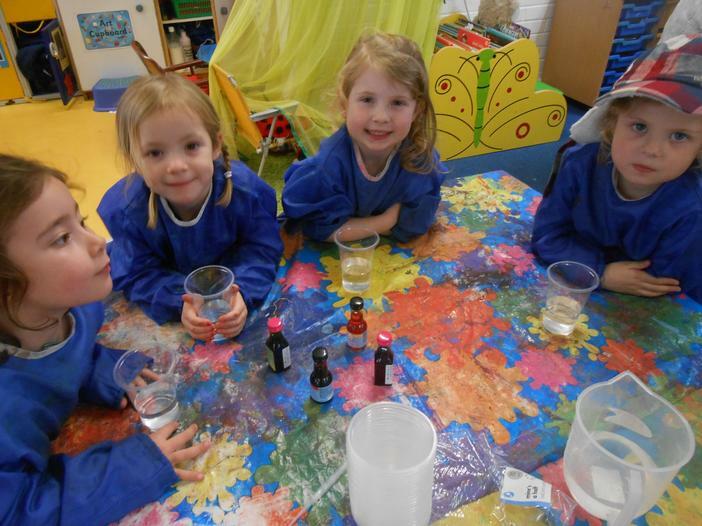 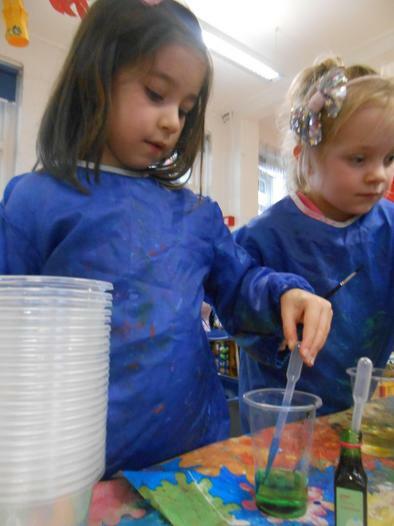 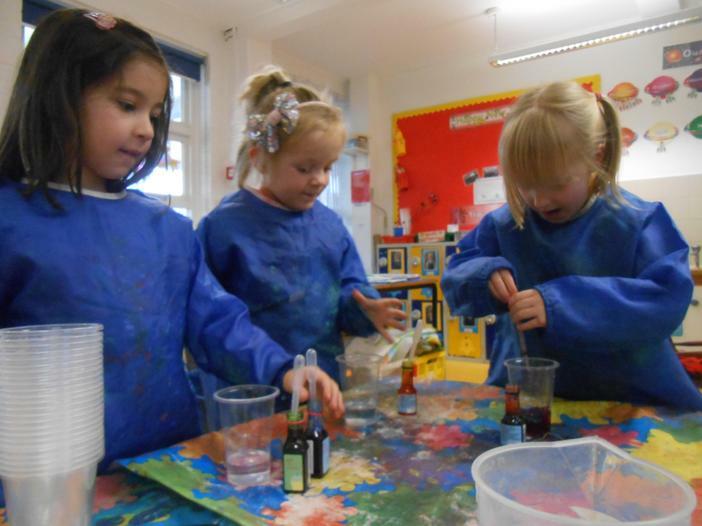 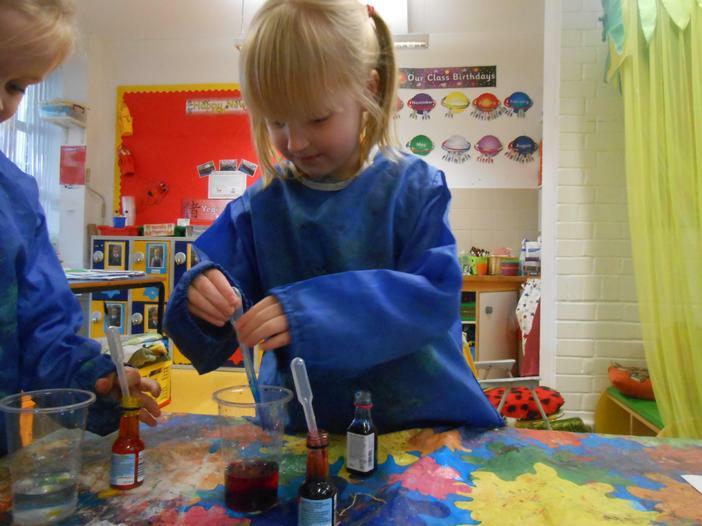 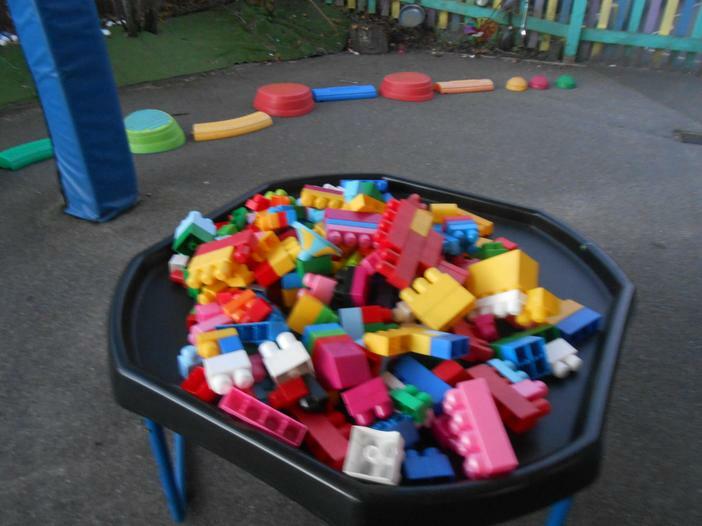 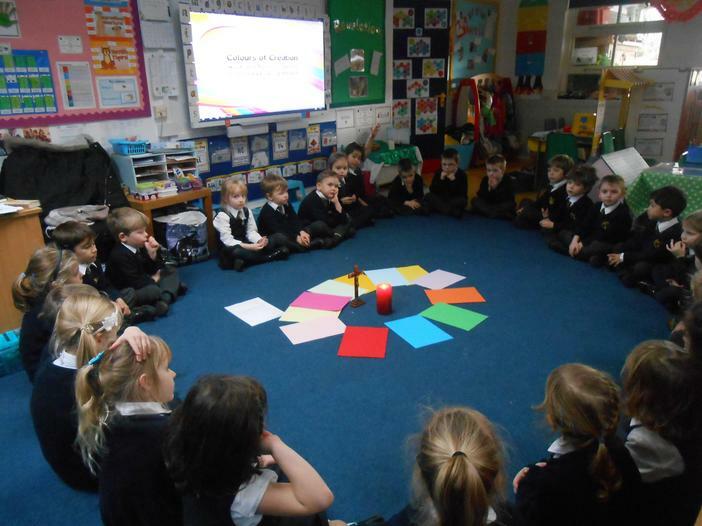 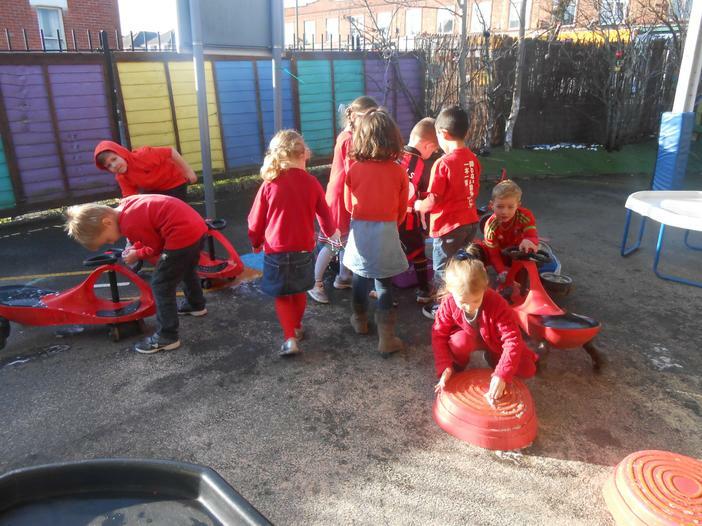 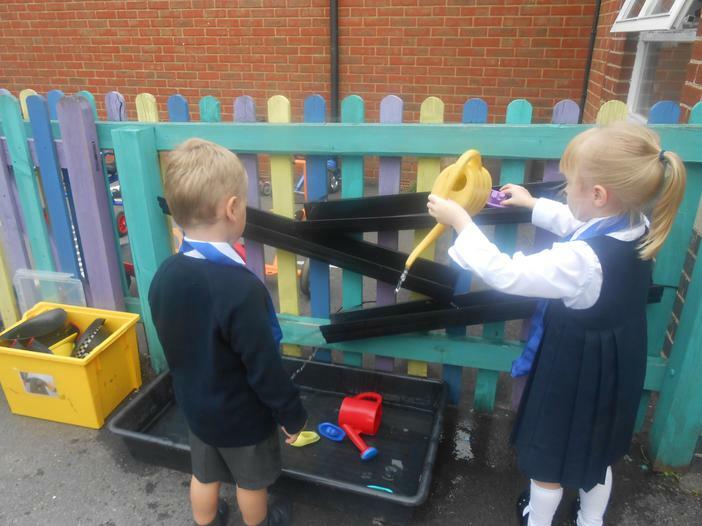 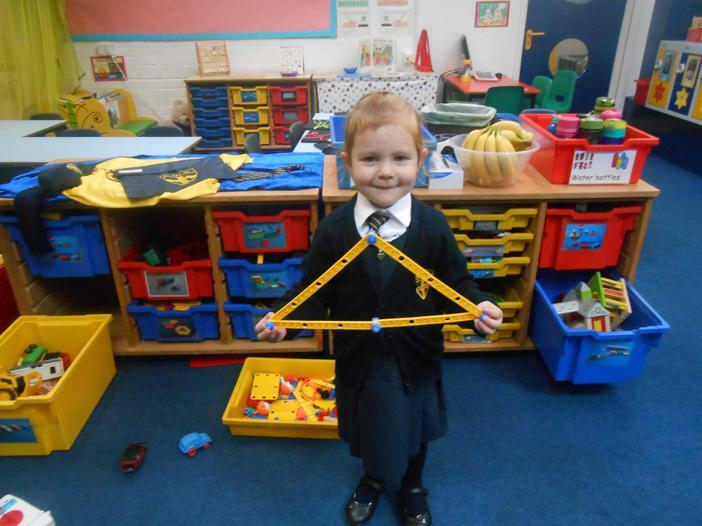 In reception, we have had lots of fun exploring colours this week. 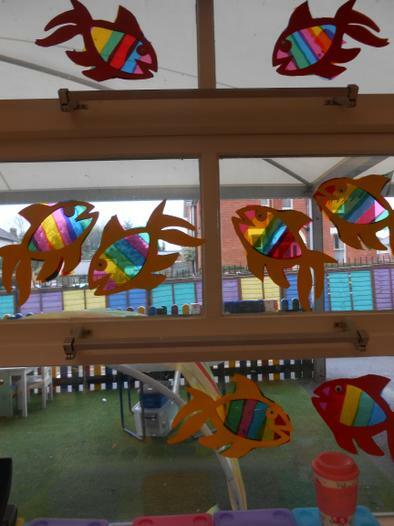 We used colourful cellophane to make Chinese lucky fish sun catchers. 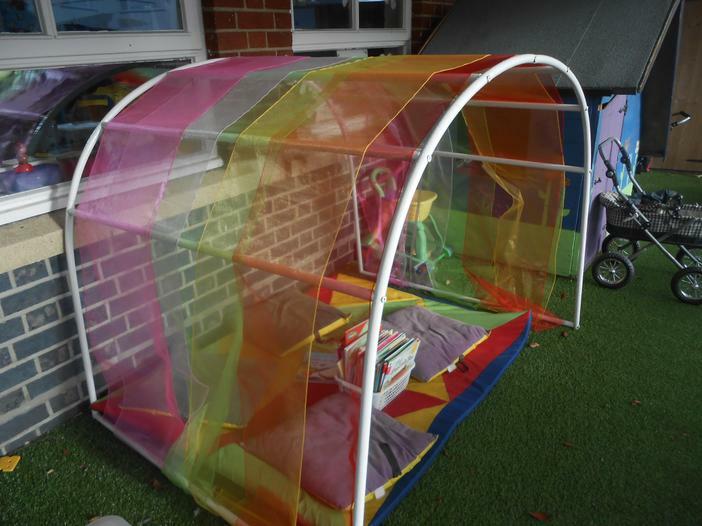 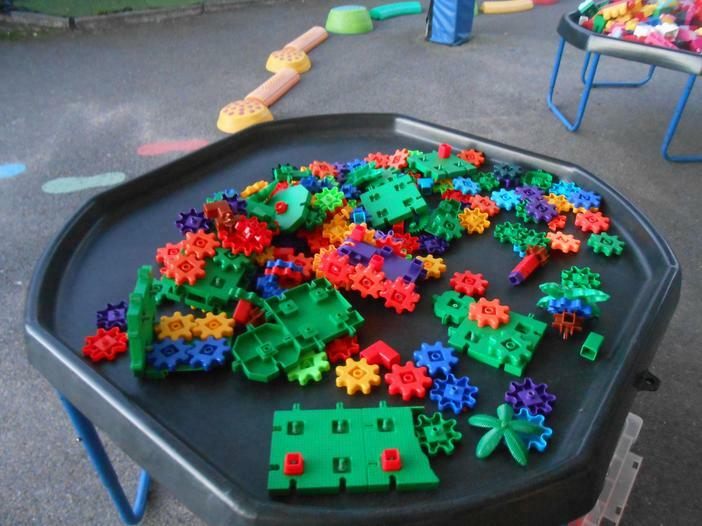 We are looking forward to seeing the beautiful rainbow colours when the sun shines through them! 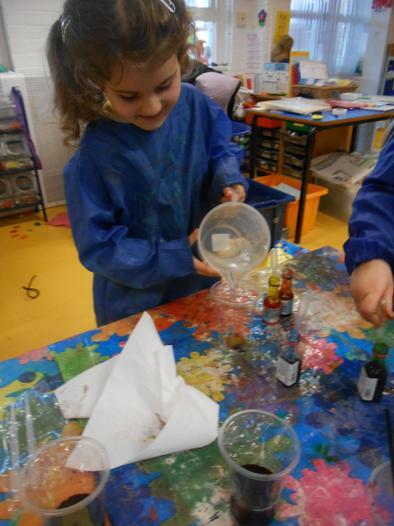 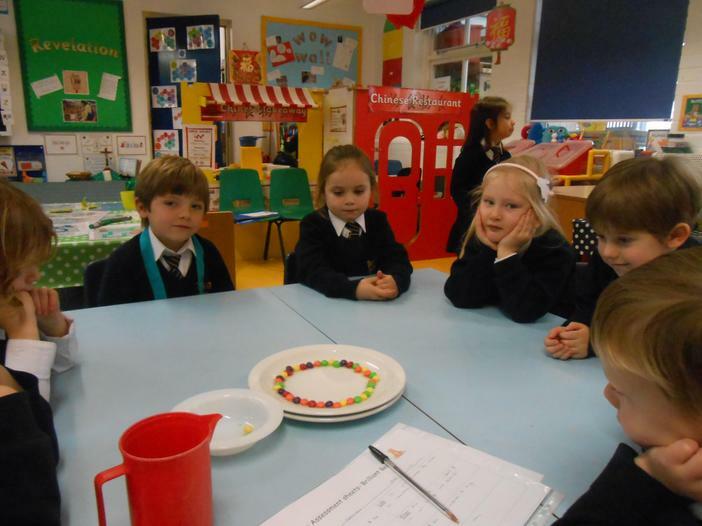 We also had fun experimenting with skittles and water. 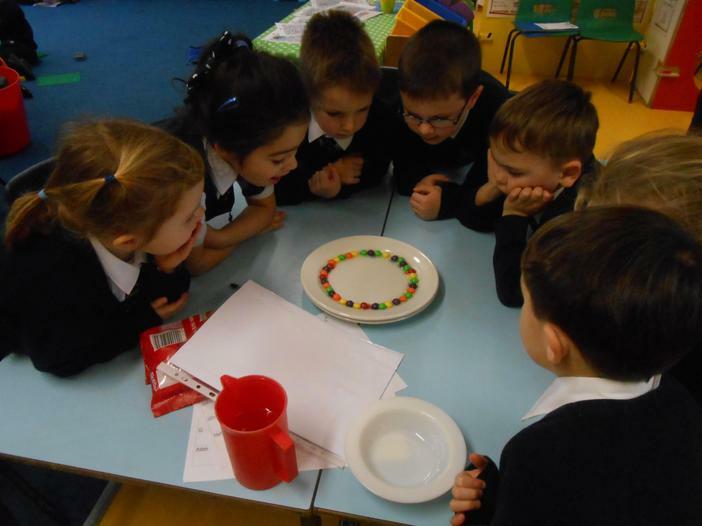 We predicted what we thought would happen when the warm water touched the skittles. 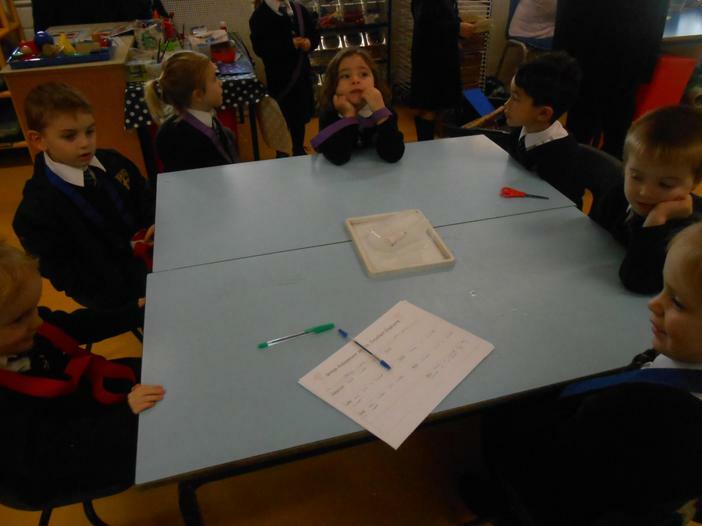 We talked about how in science experiments, it doesn’t matter whether your prediction was right or wrong but that you try and use your prior knowledge to make informed guesses about what will happen. 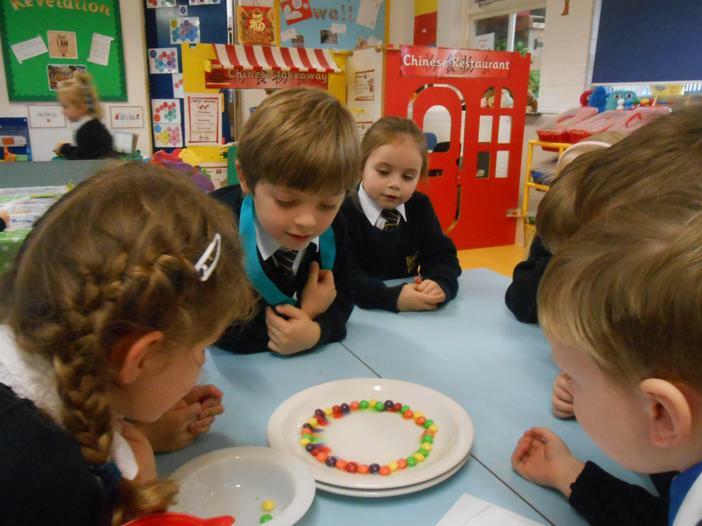 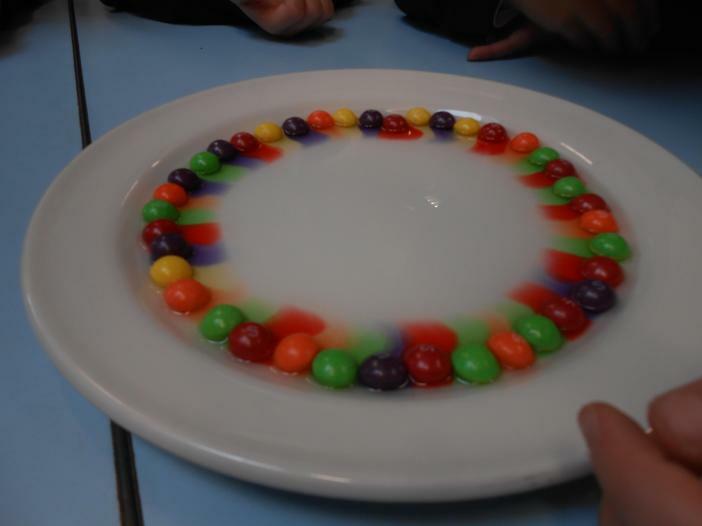 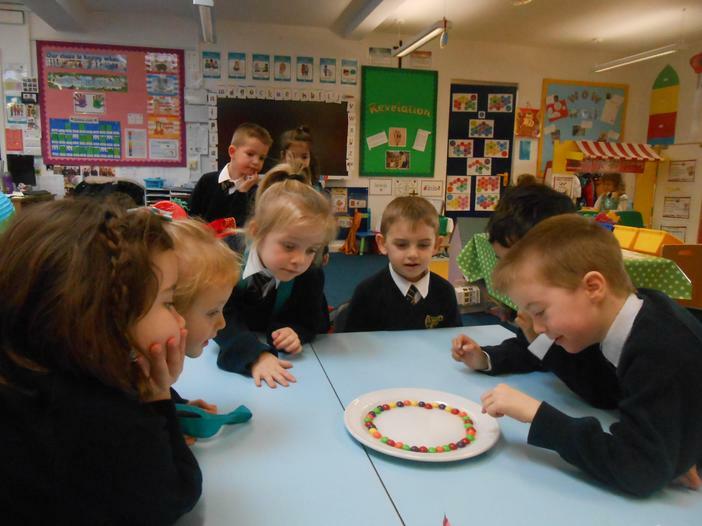 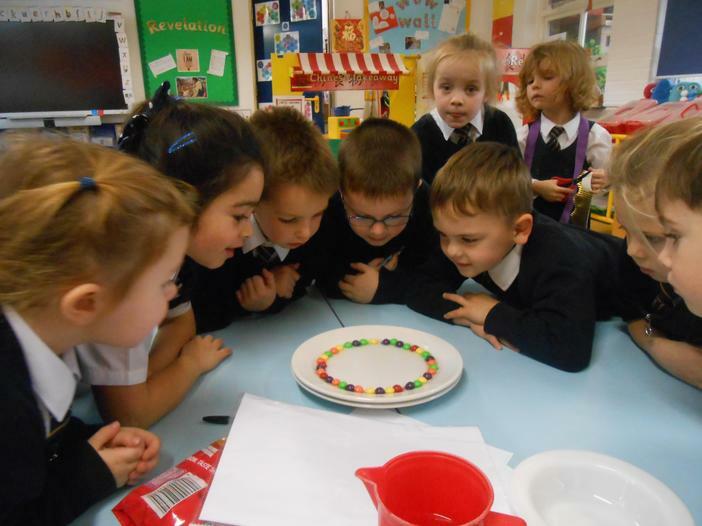 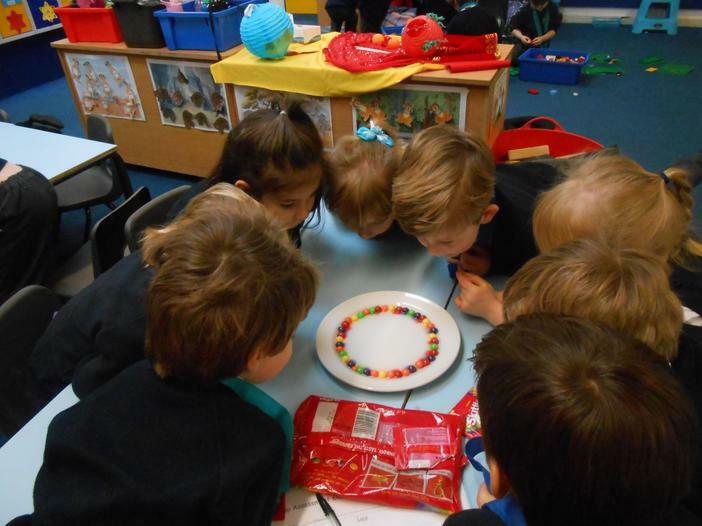 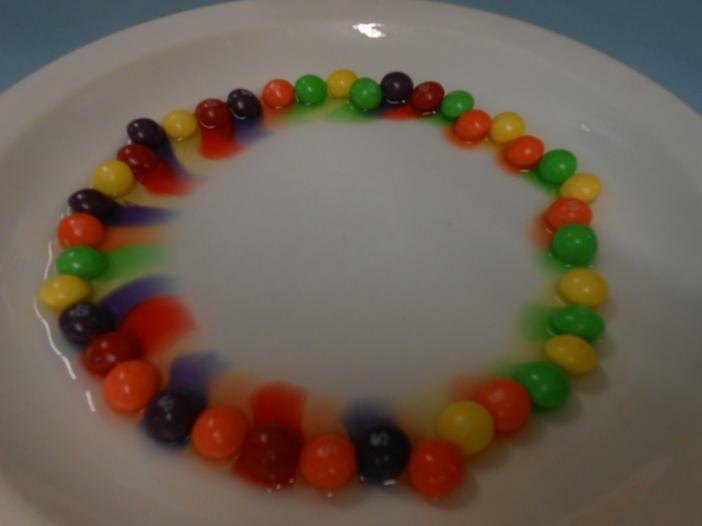 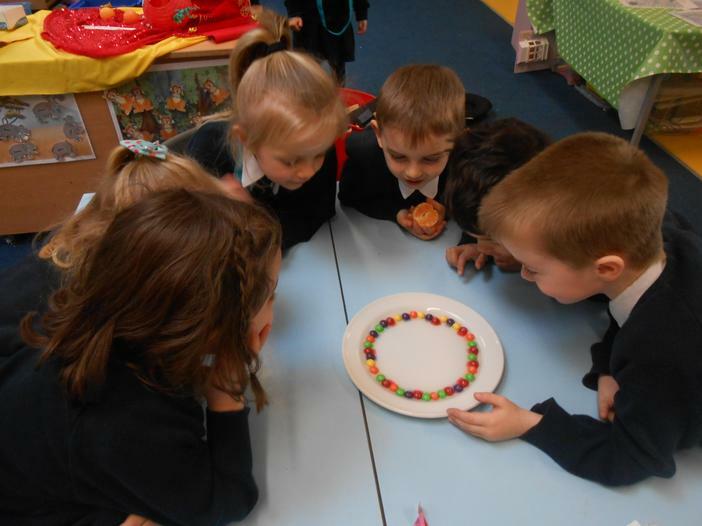 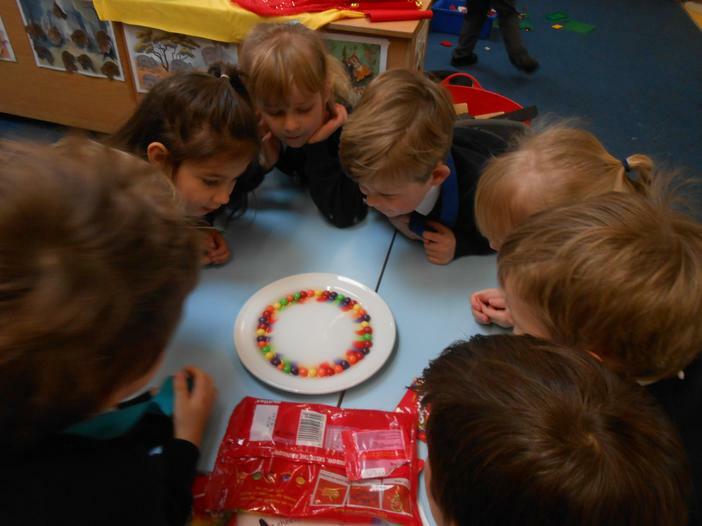 We were all excited when we discovered that the warm water makes the colour from the skittles spread like a rainbow! 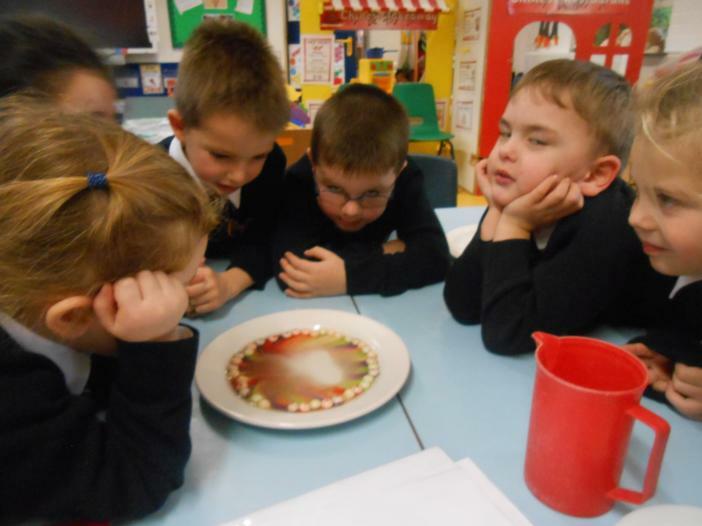 We discussed the concept of dissolving rather than melting and how these are different. 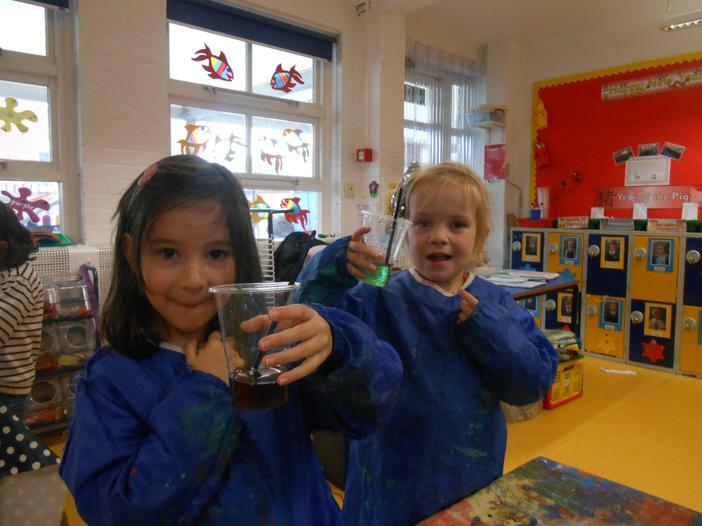 Some of us also explored what happened when we mixed different coloured water together and discussed our findings with our friends. 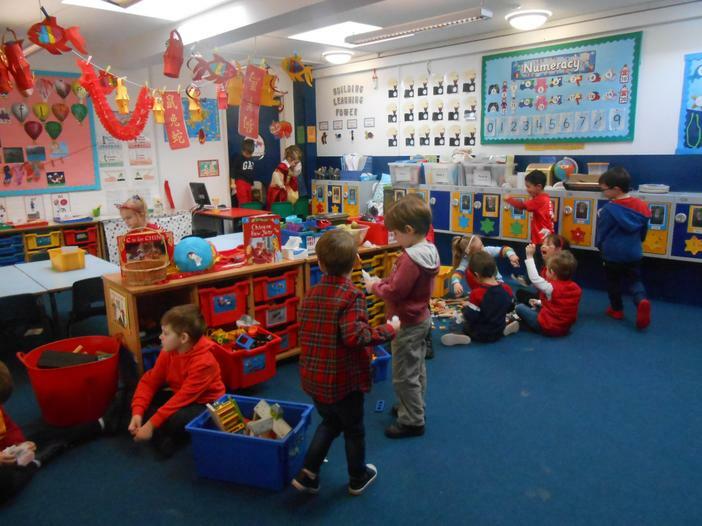 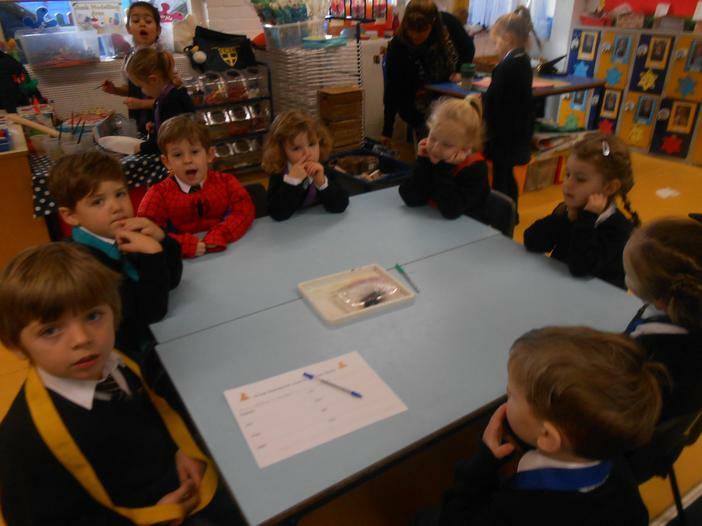 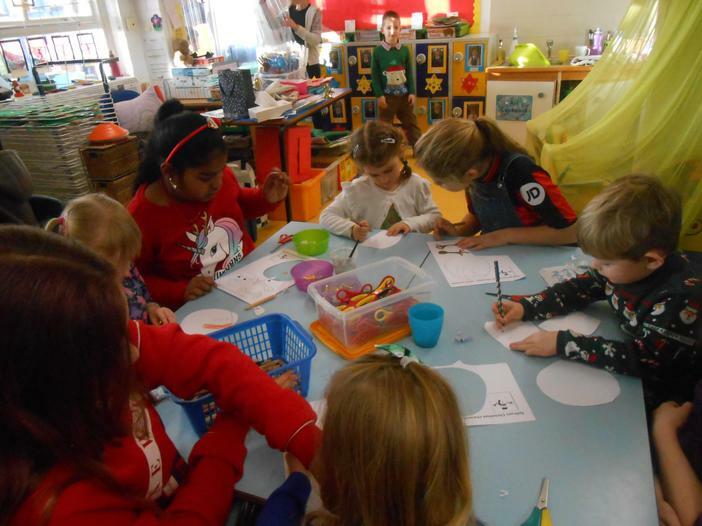 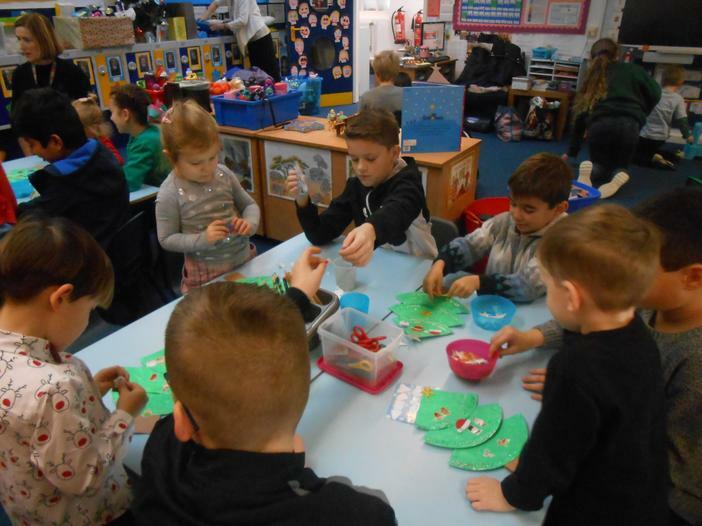 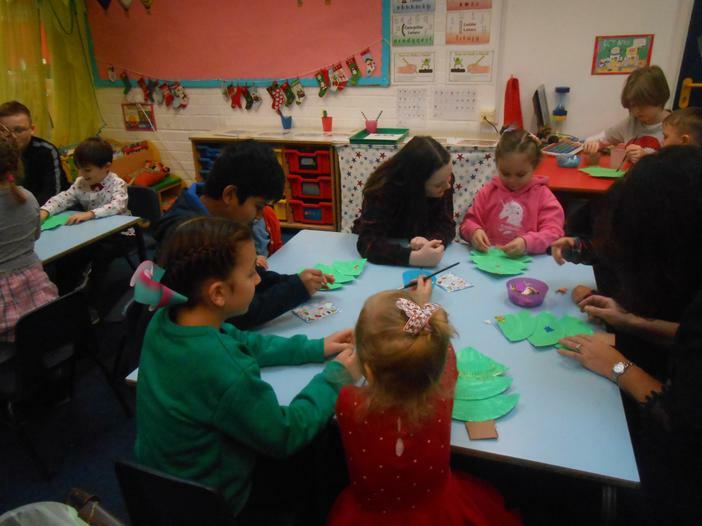 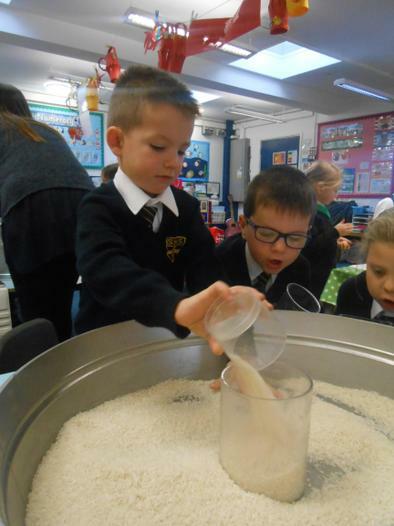 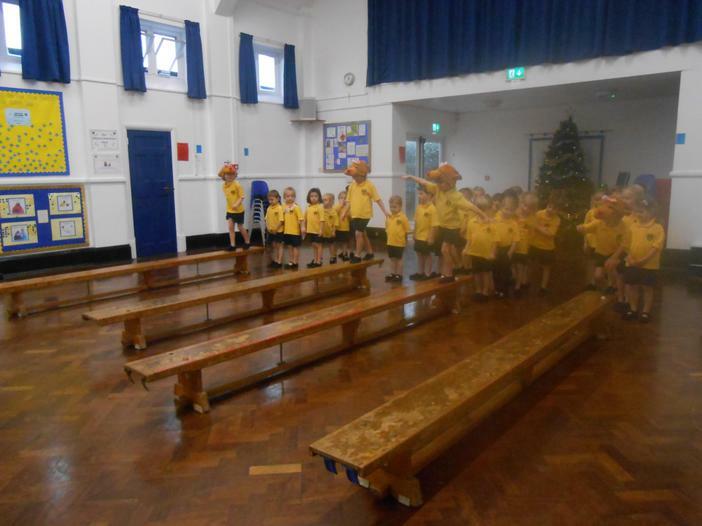 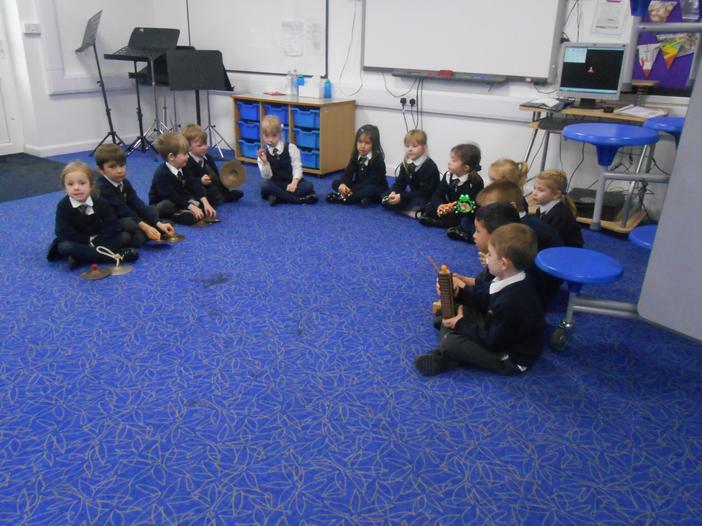 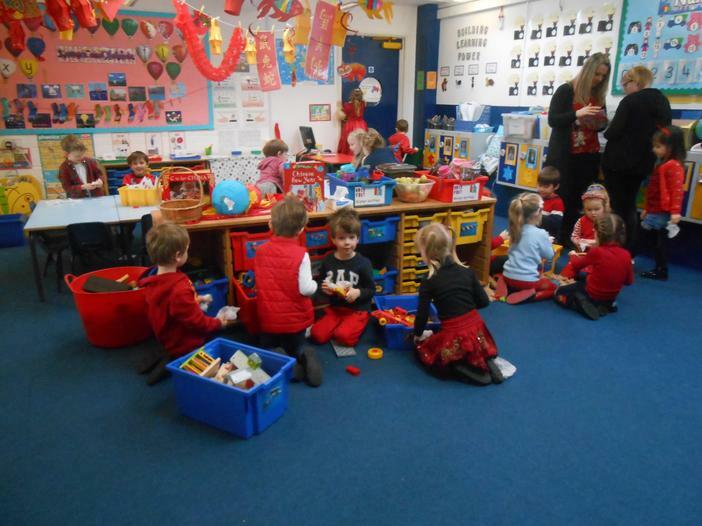 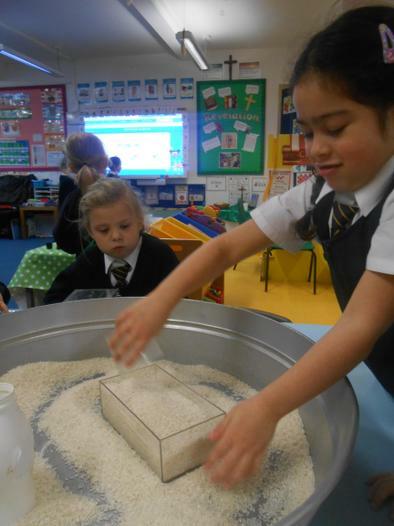 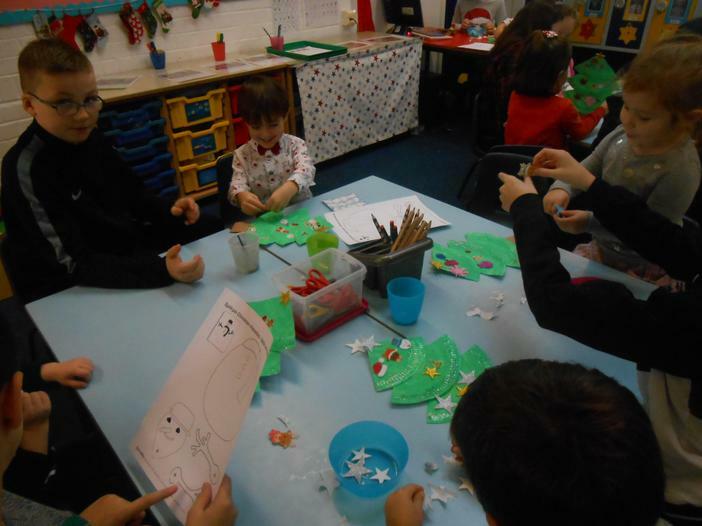 We had such fun over the Christmas season in reception. 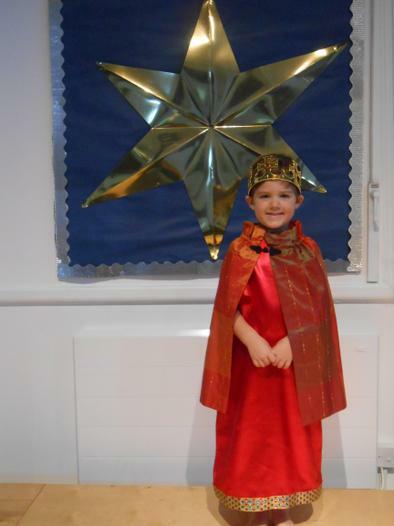 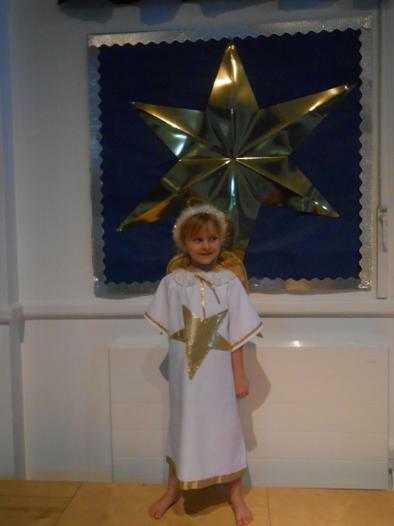 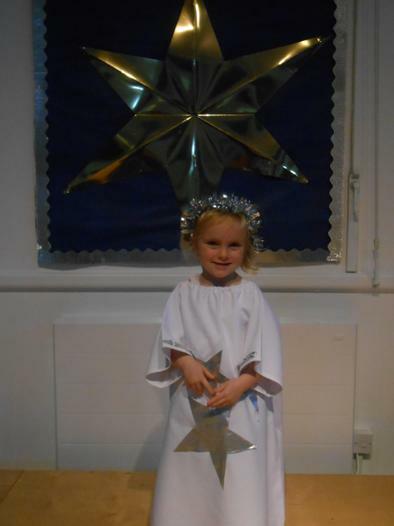 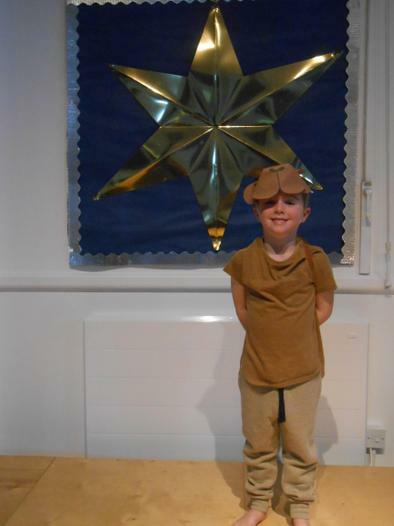 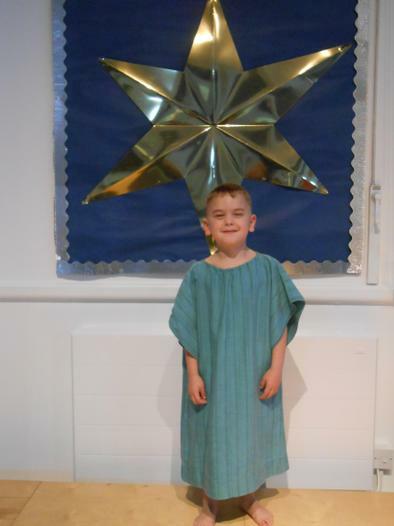 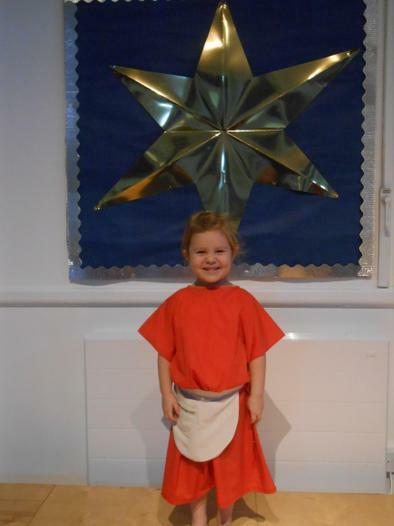 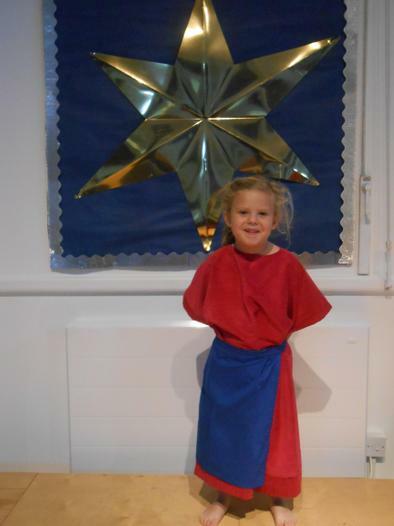 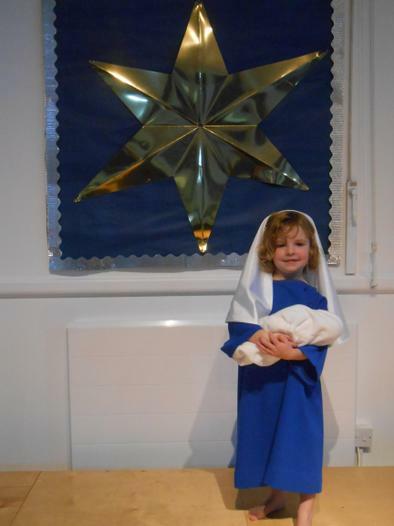 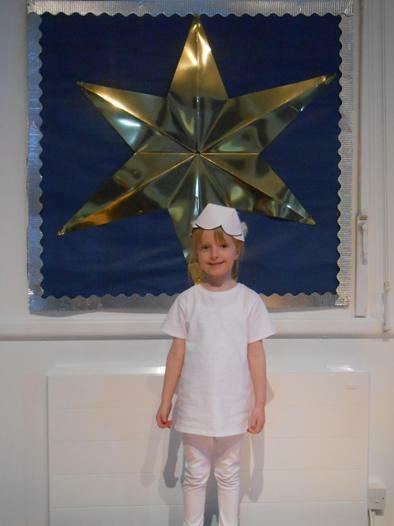 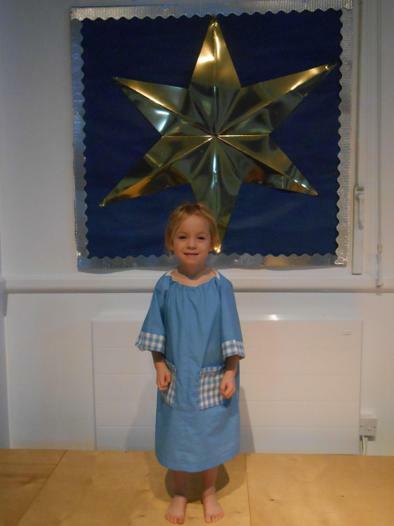 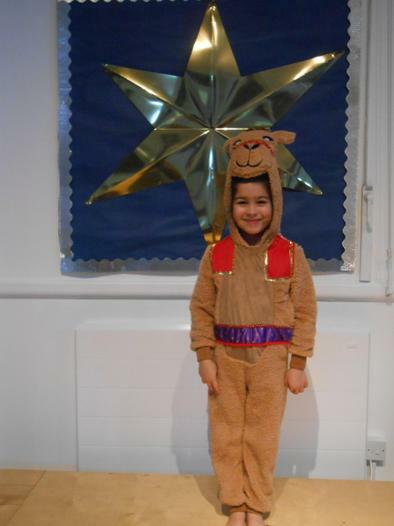 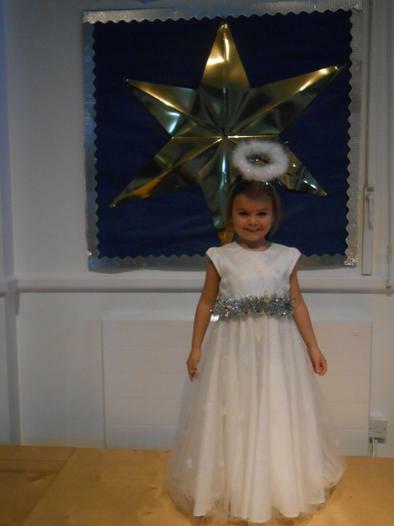 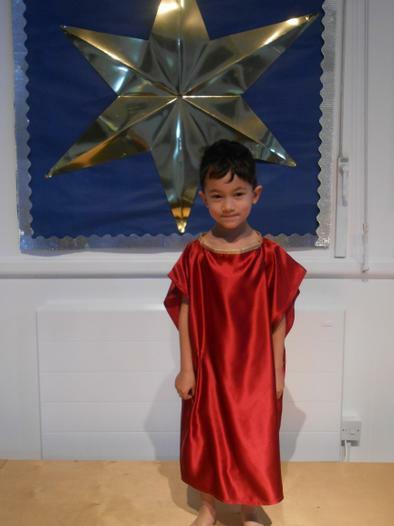 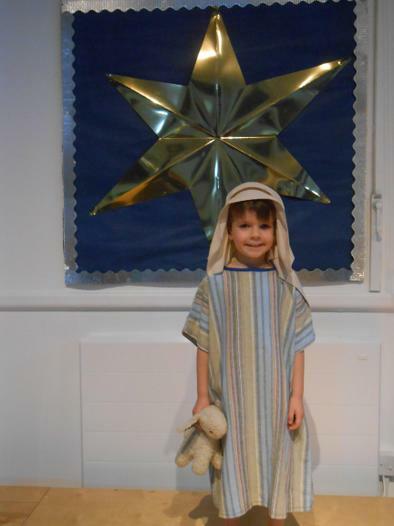 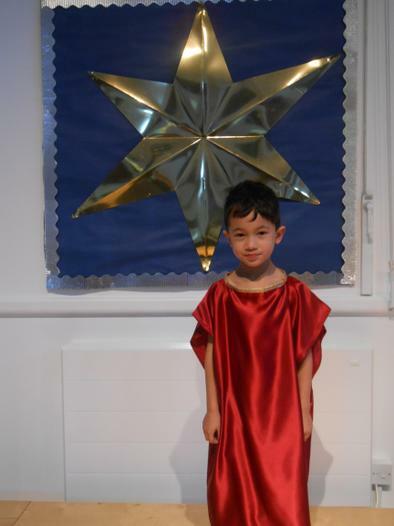 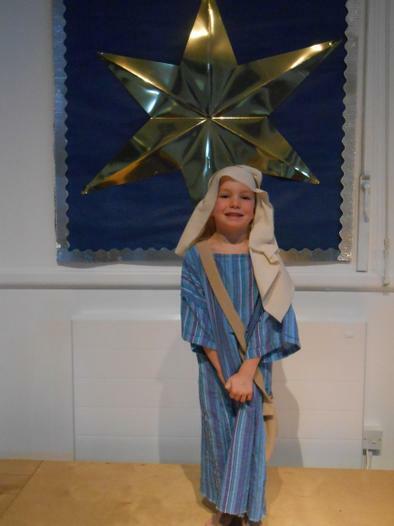 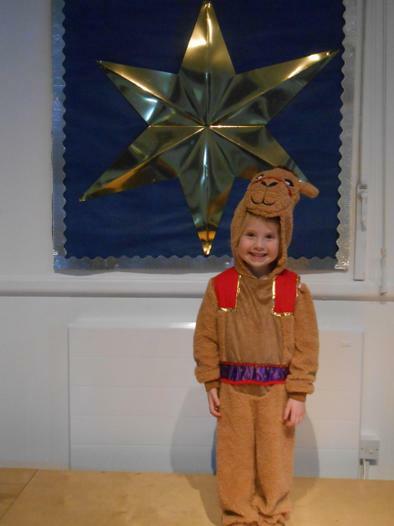 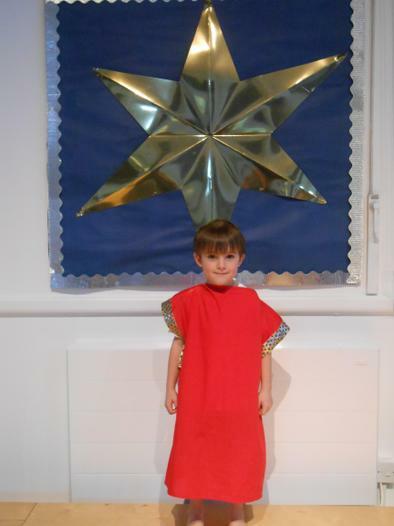 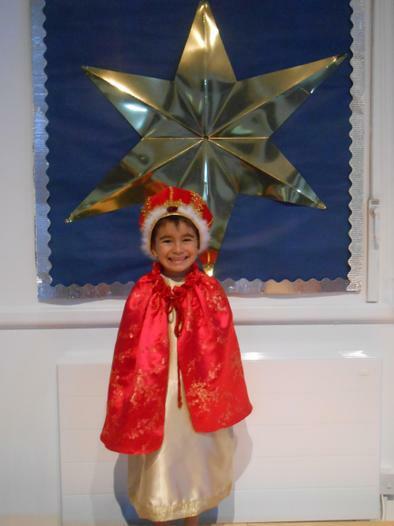 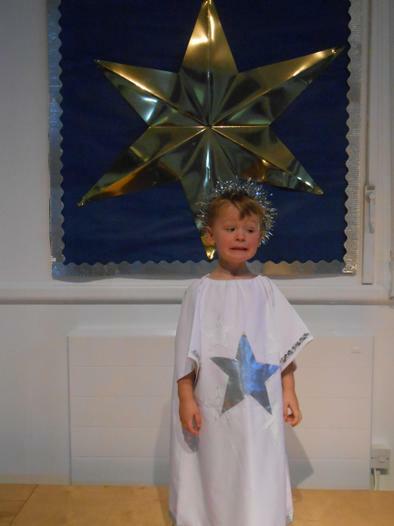 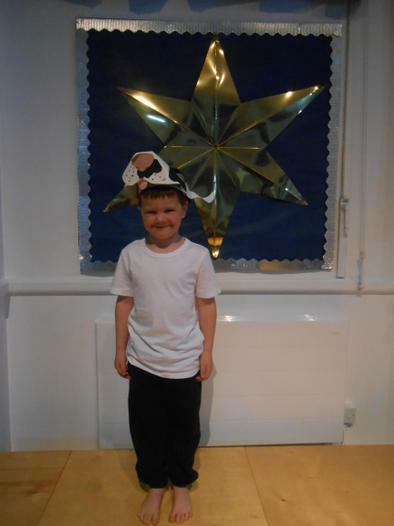 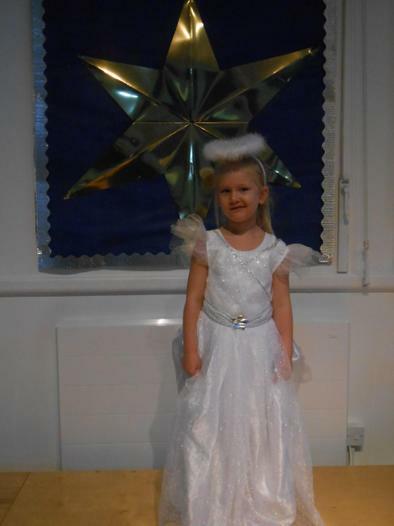 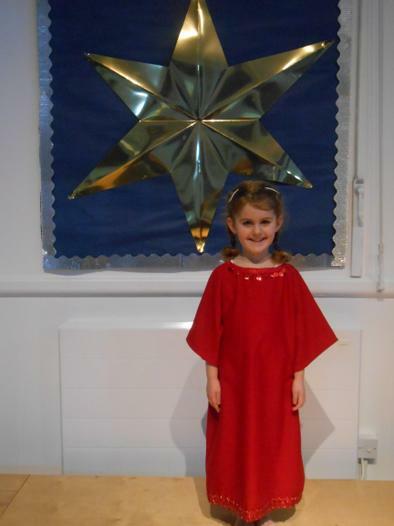 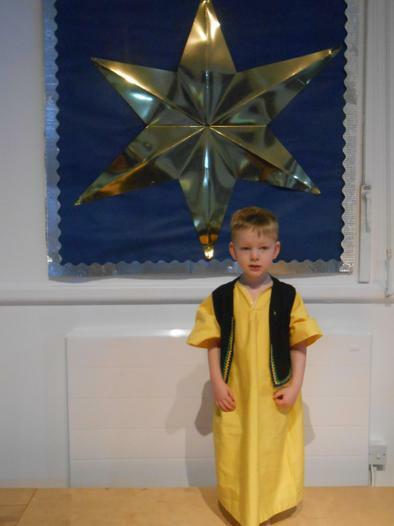 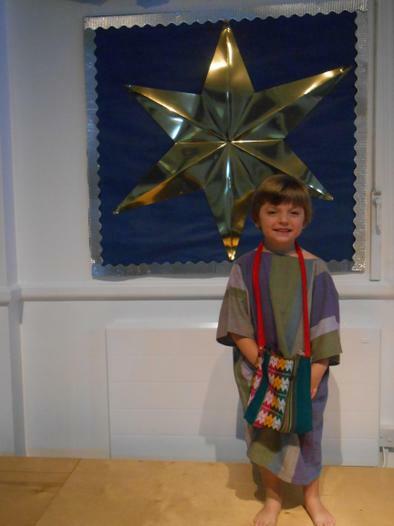 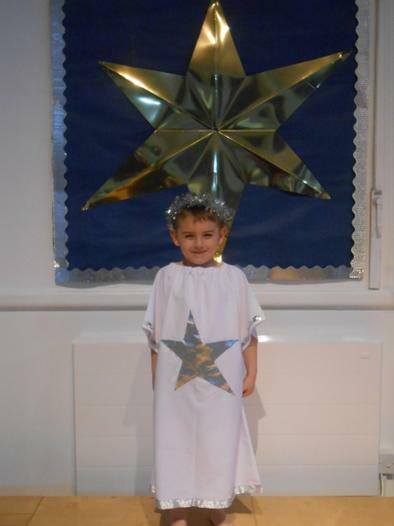 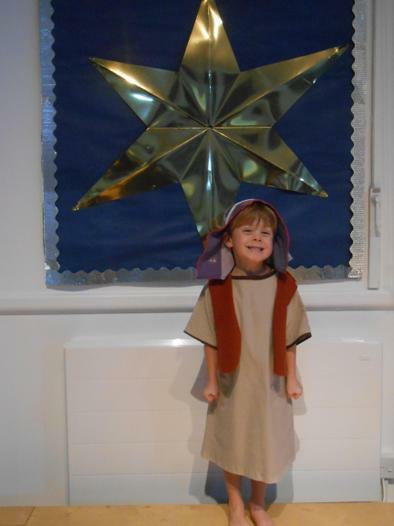 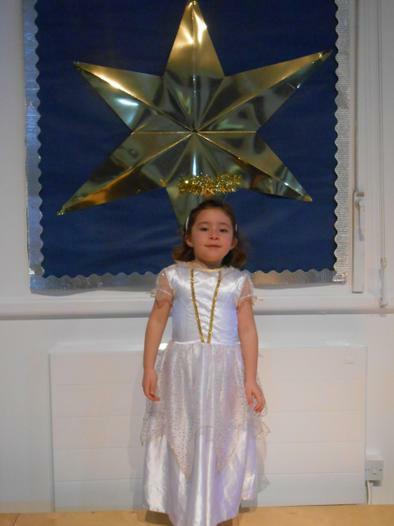 We enjoyed taking part in the Nativity play and we hope everyone who came to watch, enjoyed themselves too! 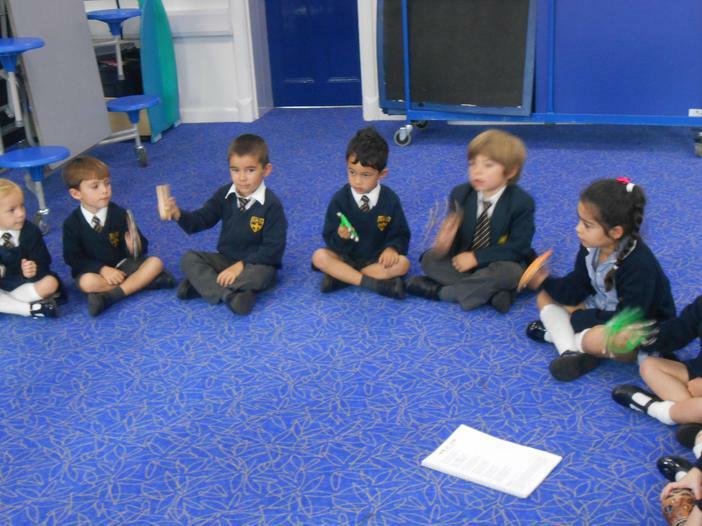 We were so proud of the children's efforts in learning the songs and any lines they had to say. 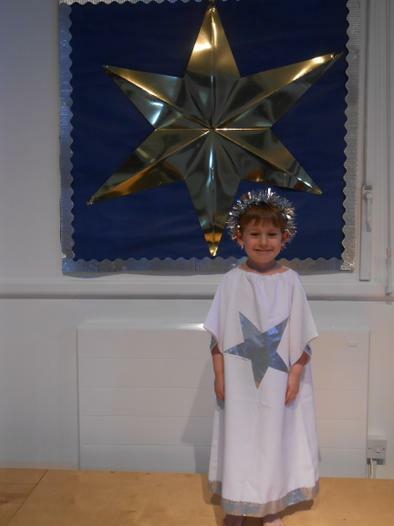 It was a special way to learn about the true meaning of Christmas. 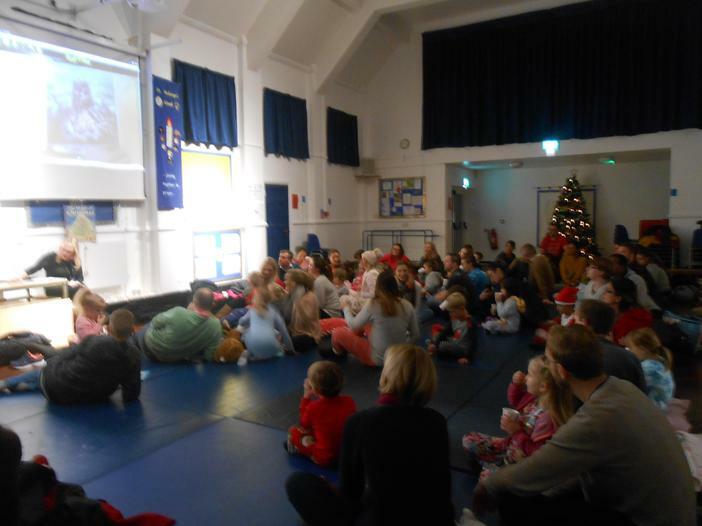 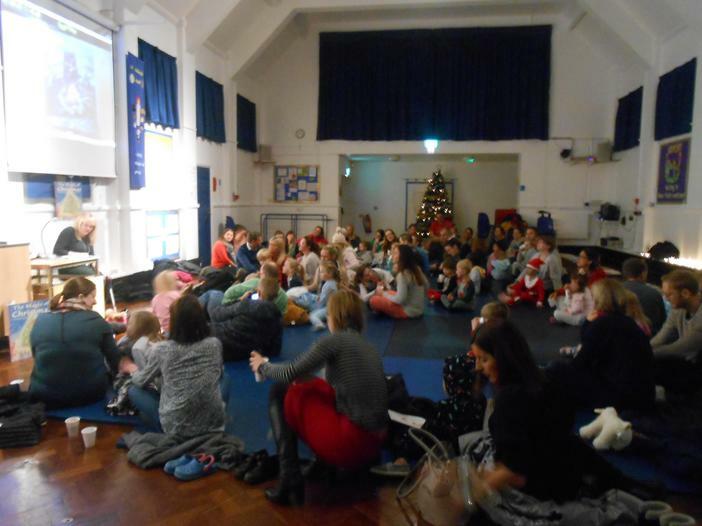 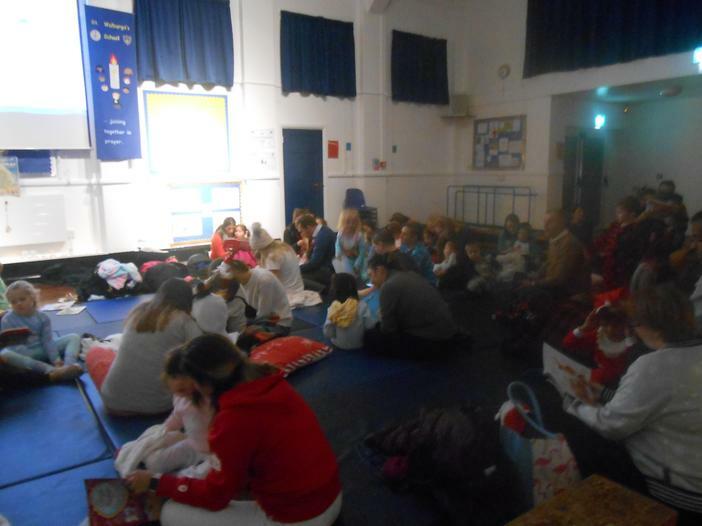 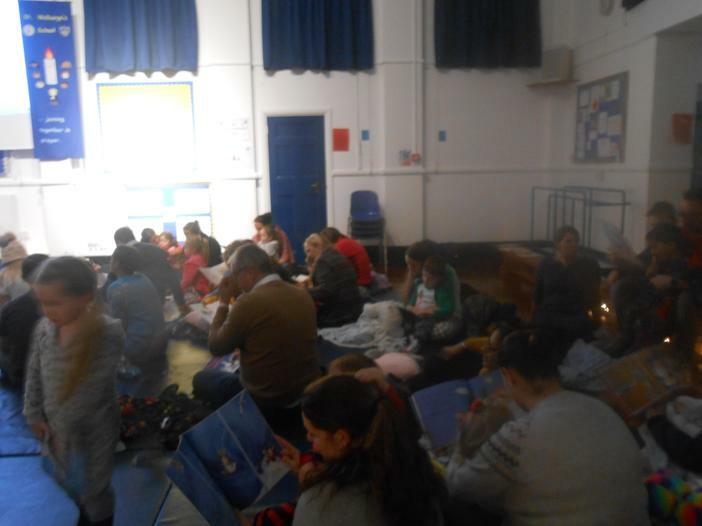 We also really enjoyed the Christmas story telling evening- the hot chocolates and biccies were a highlight and we hope parents and children enjoyed sharing this time together. 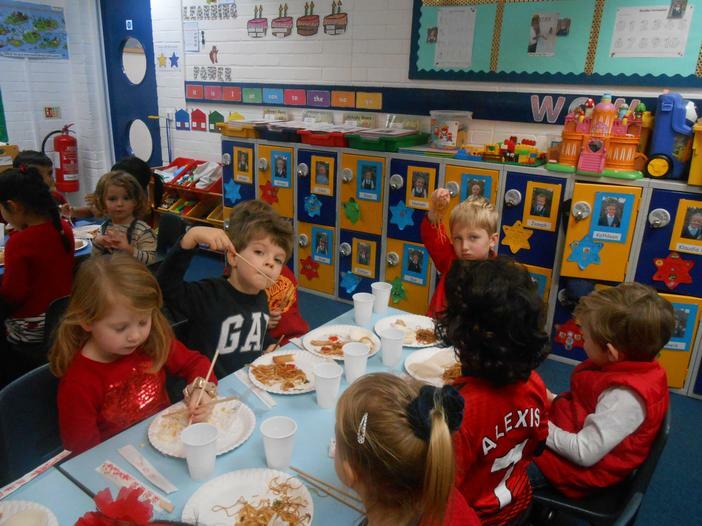 We had lots of fun on Christmas party day! 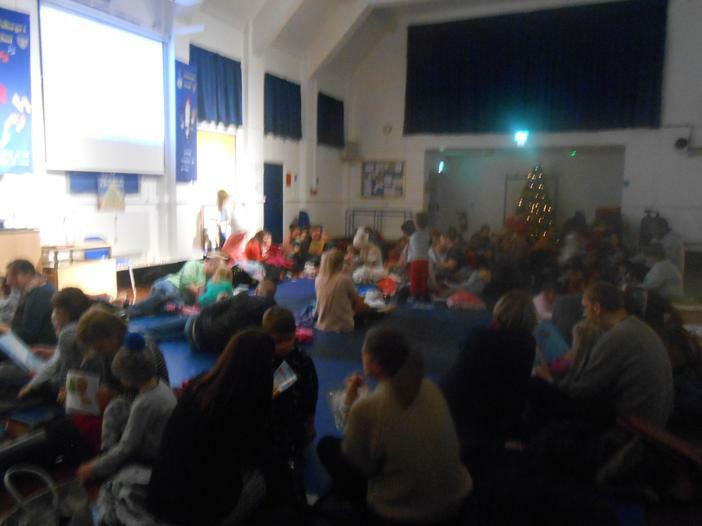 Santa came to visit and gave us all a treat! 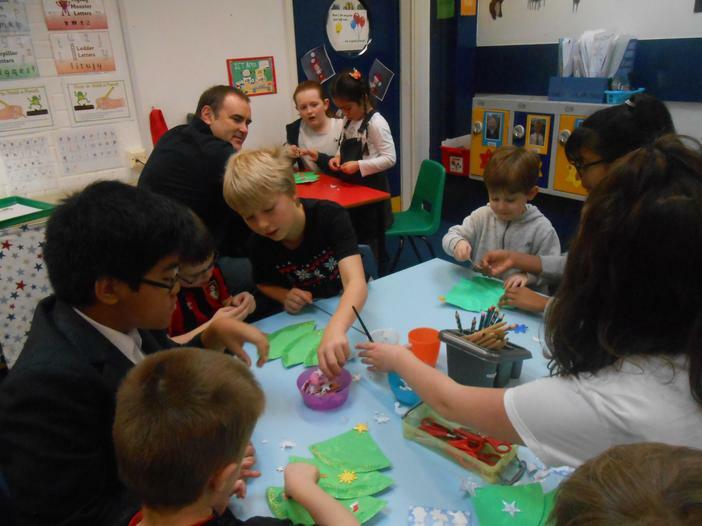 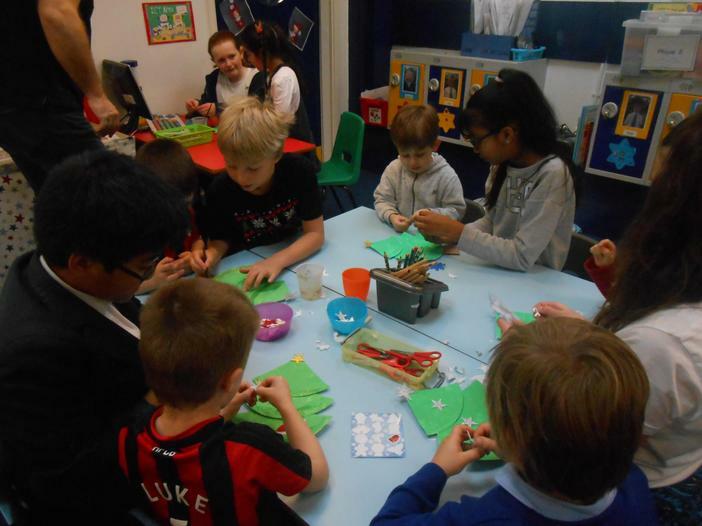 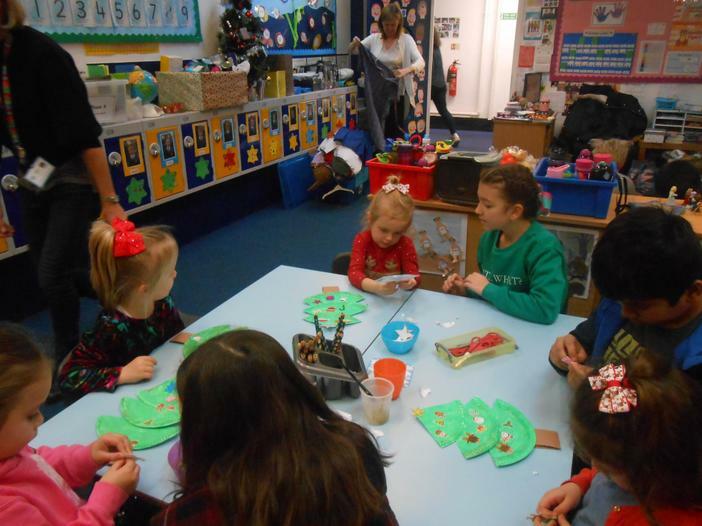 We enjoyed spending time with our year 6 prayer buddies and they helped us decorate the Christmas trees we had made. 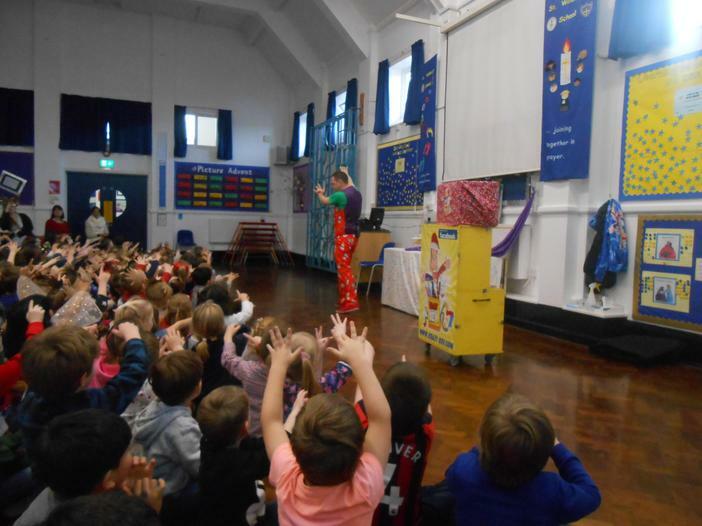 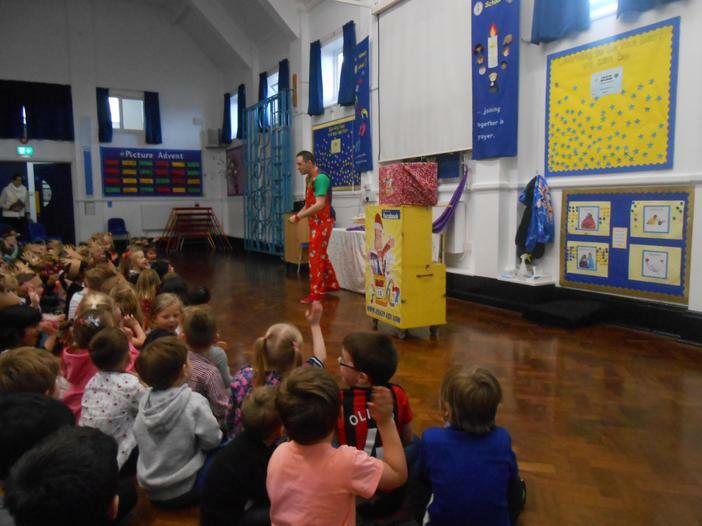 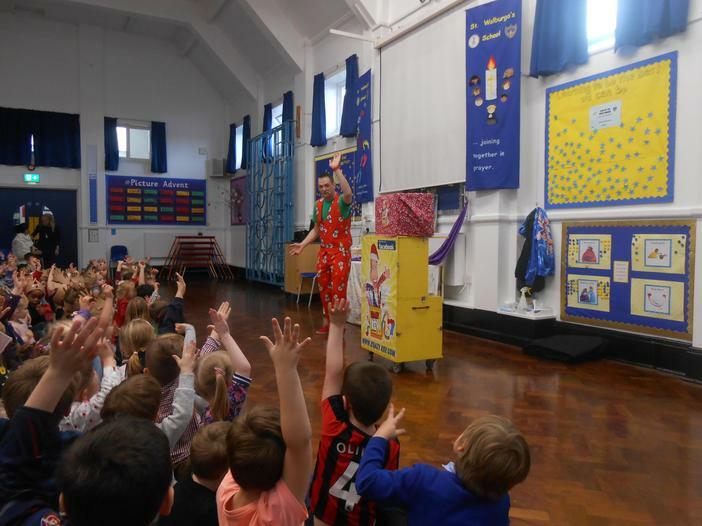 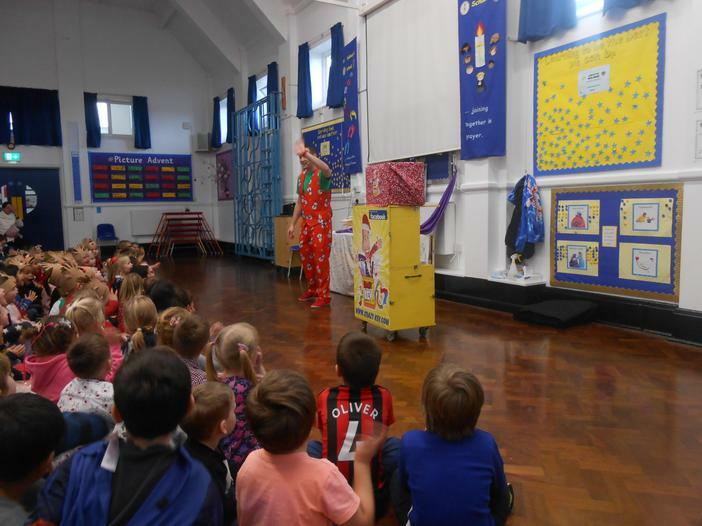 Then in the afternoon, Krazy Kev came to school and did some really funny magic with us! 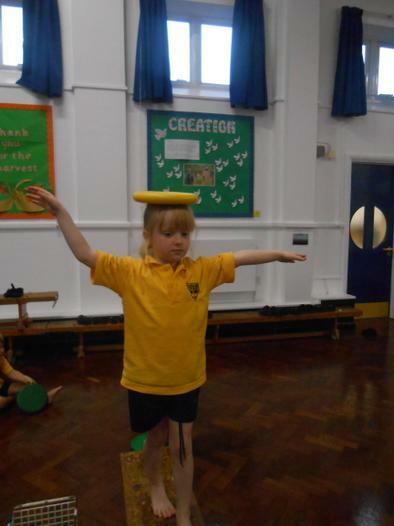 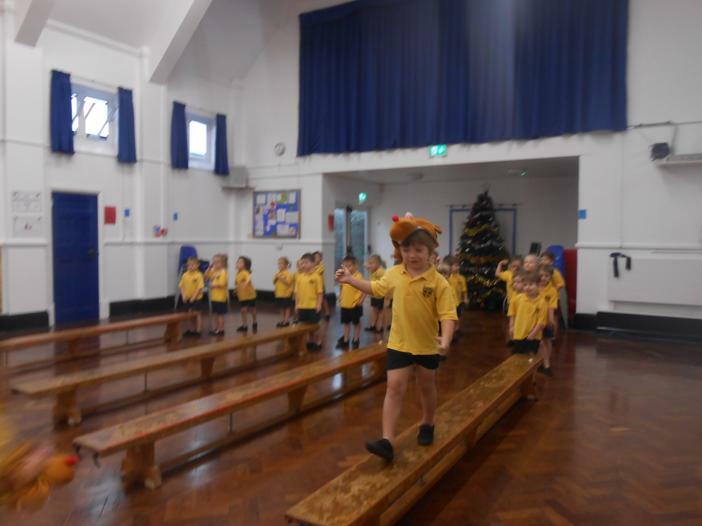 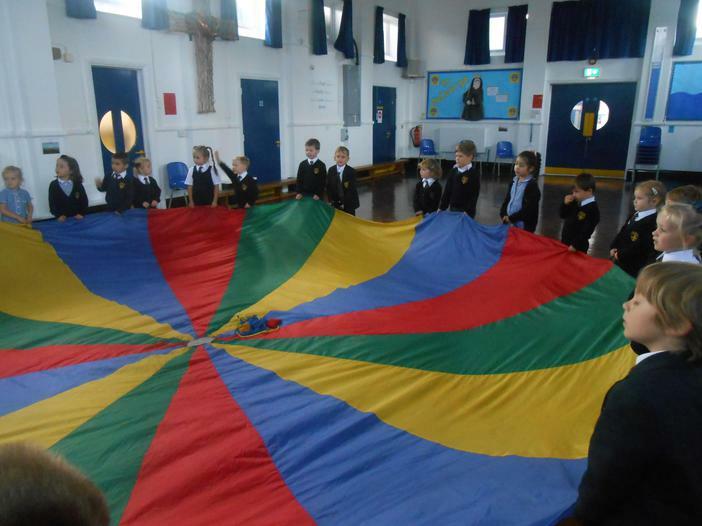 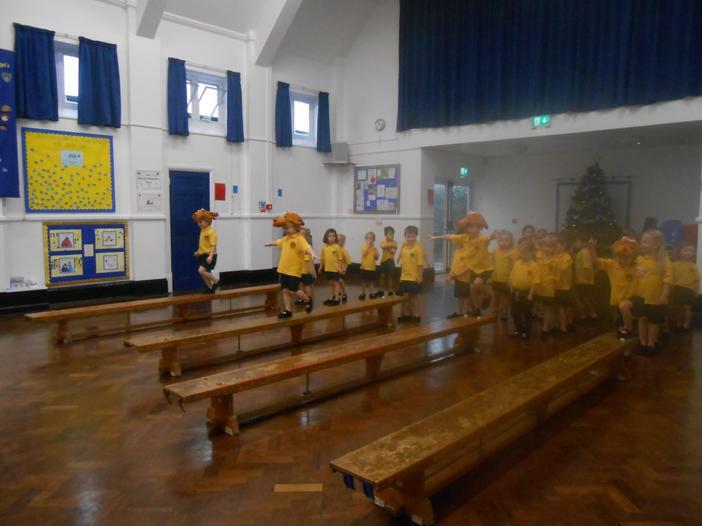 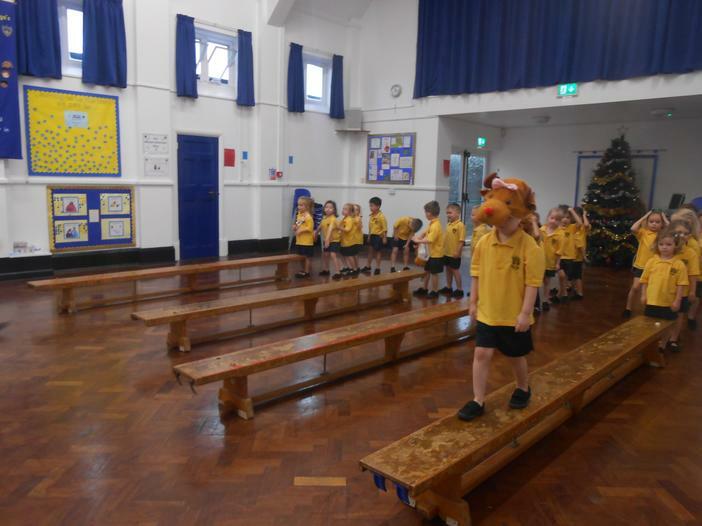 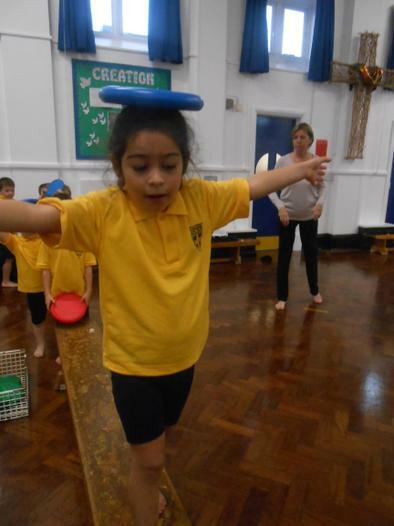 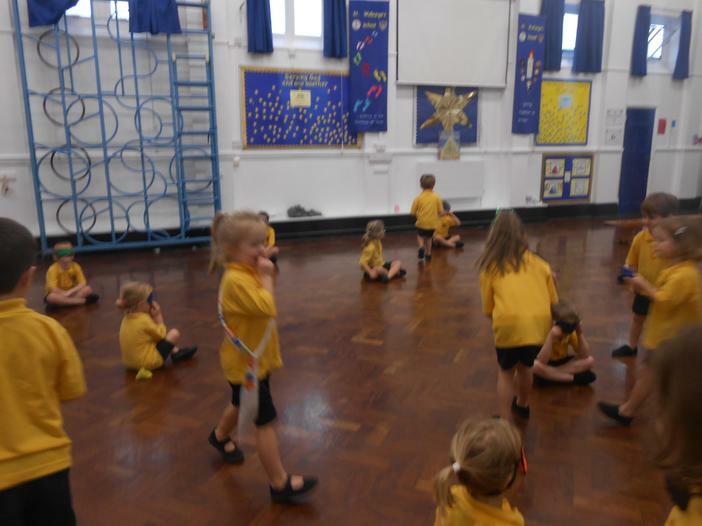 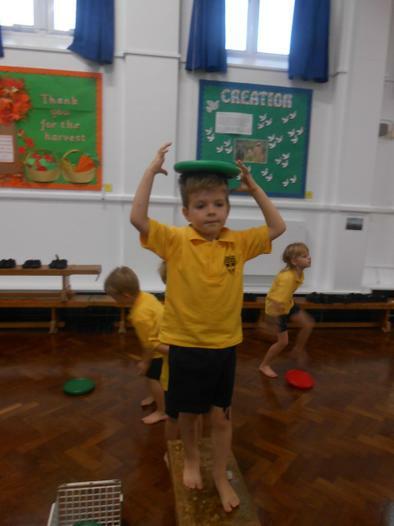 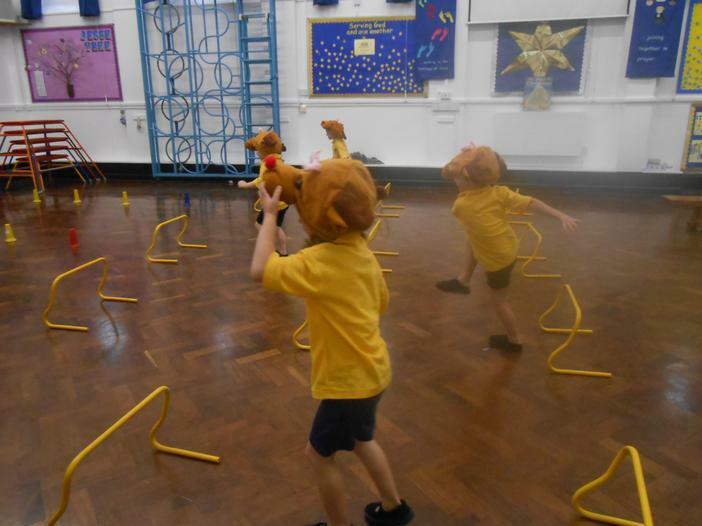 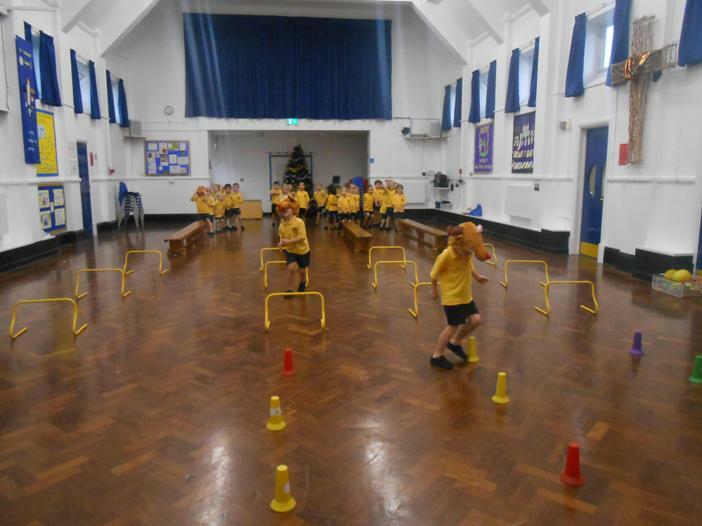 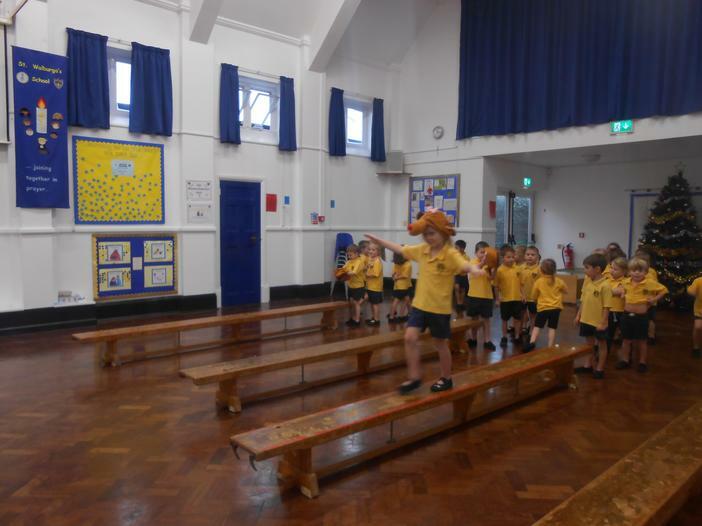 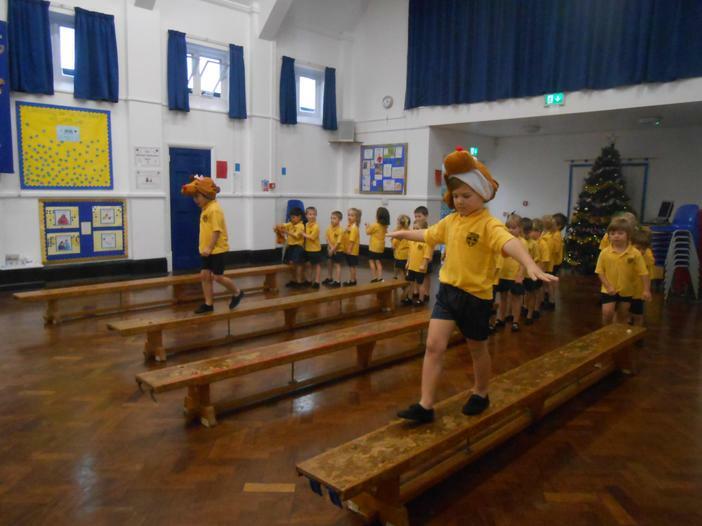 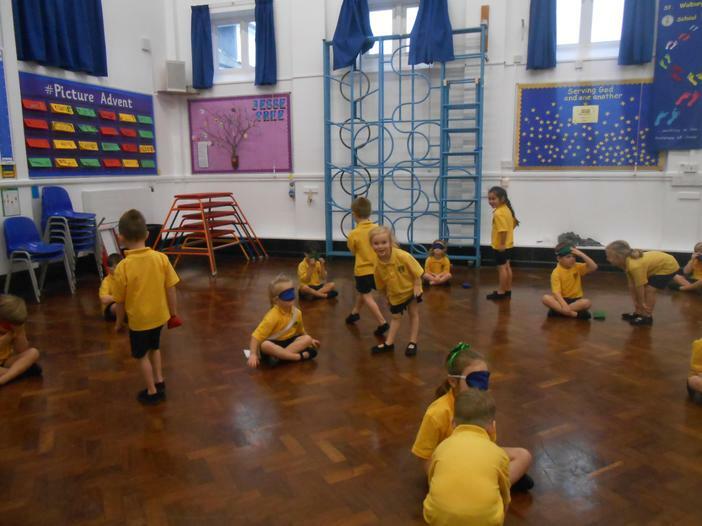 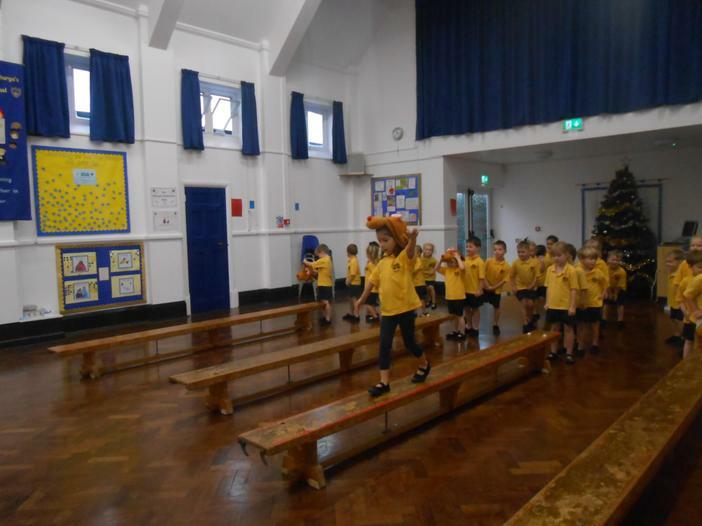 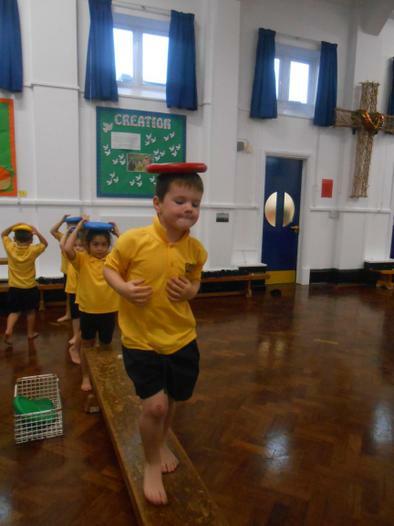 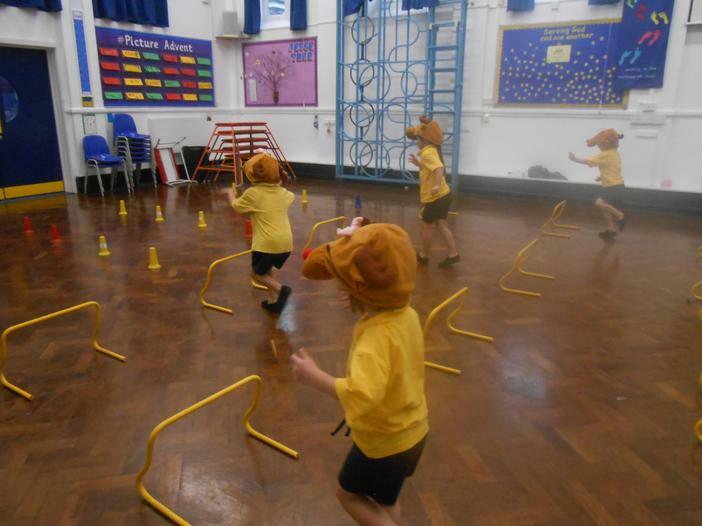 in PE,, we enjoyed taking part in reindeer training and practising our balance and jumping skills! 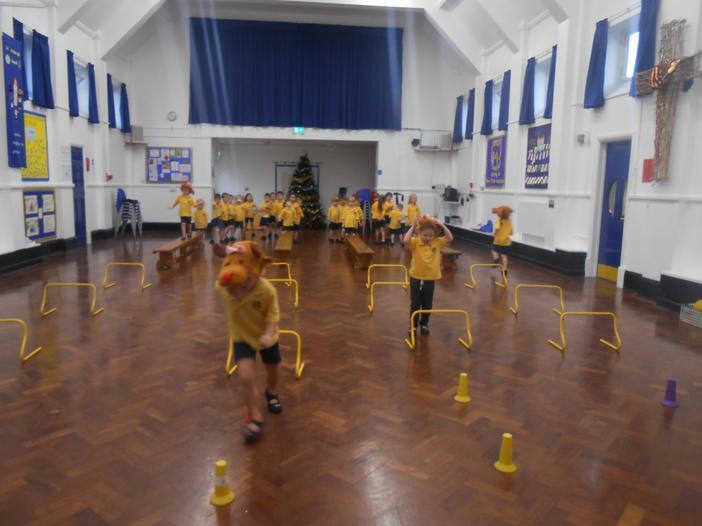 We all looked brilliant in our Christmas jumpers on the last day of term and we had fun having party games with our friends in RP. 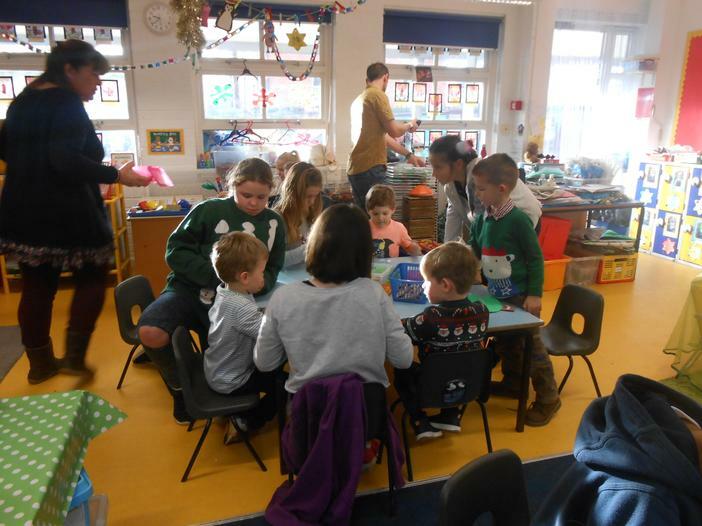 It was a really fun Christmas at school! 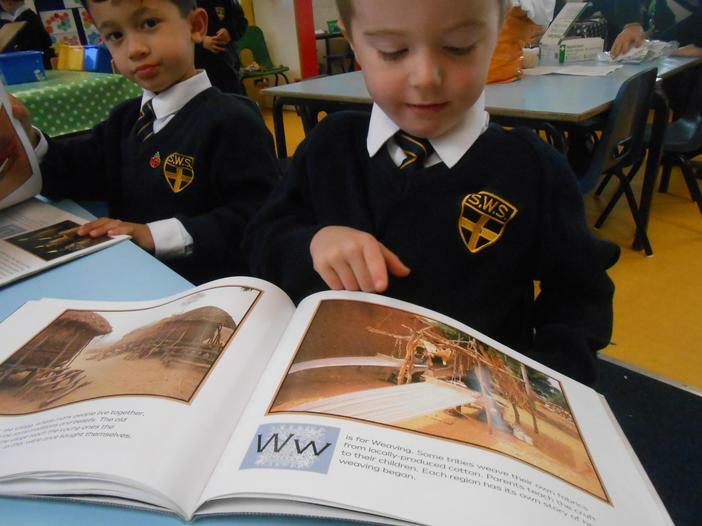 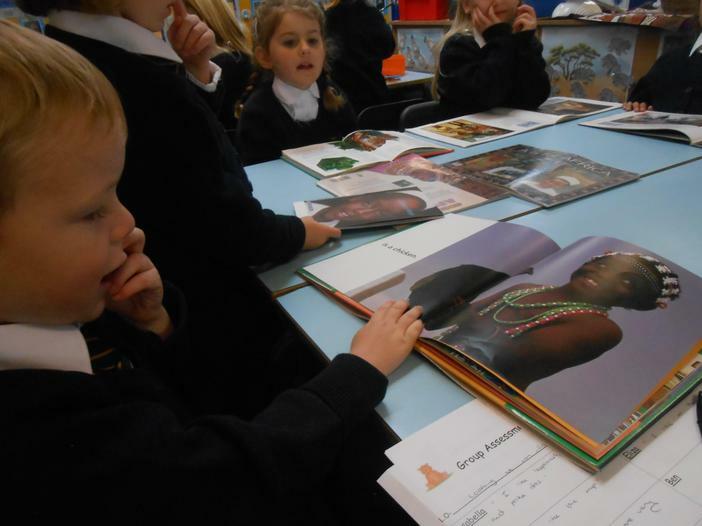 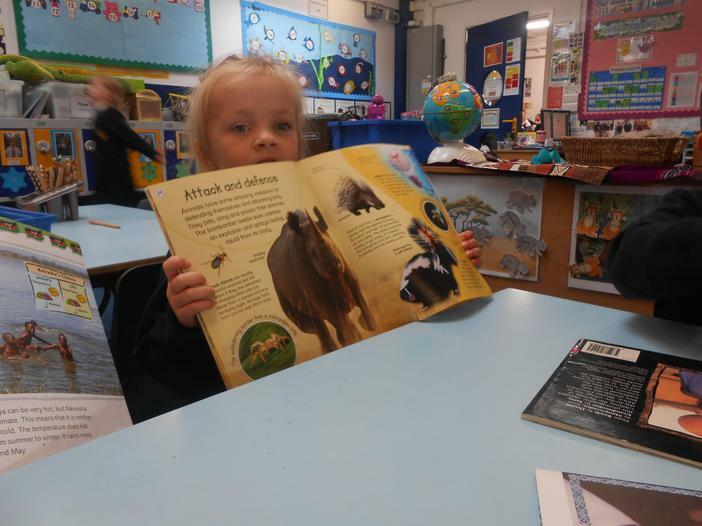 We have had lots of fun learning about Africa over the last term. 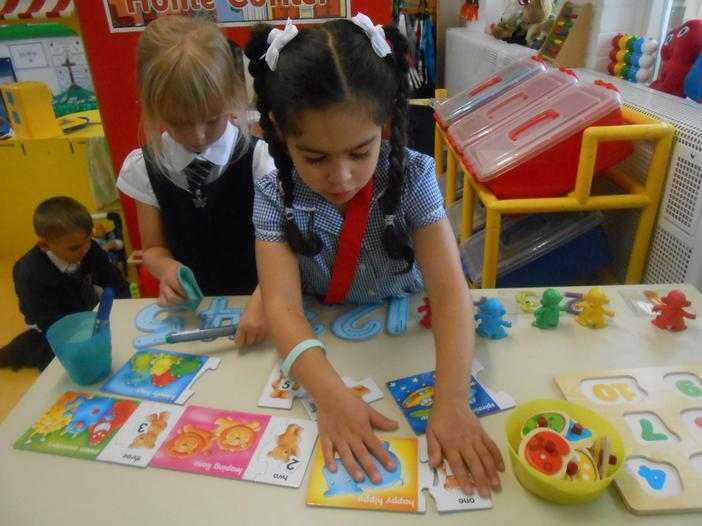 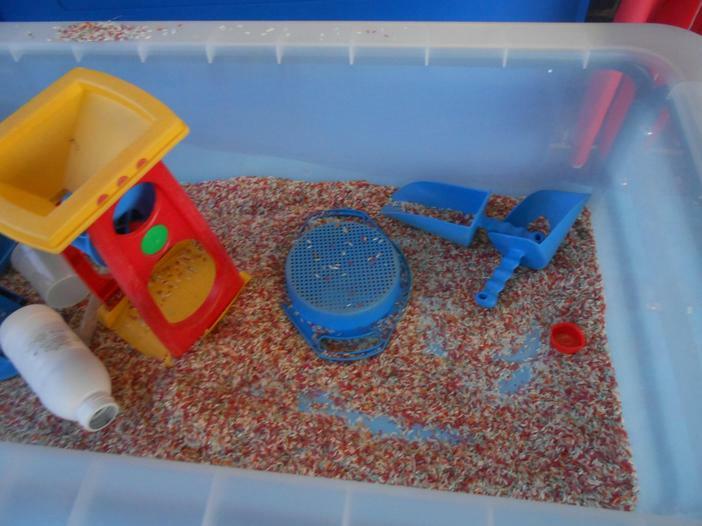 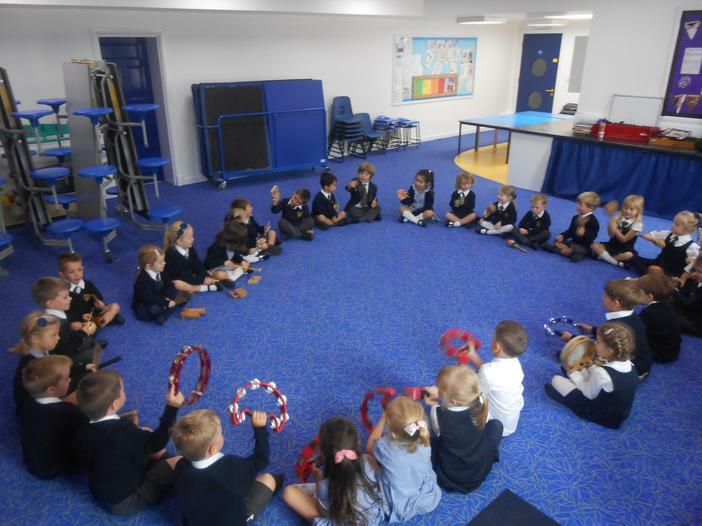 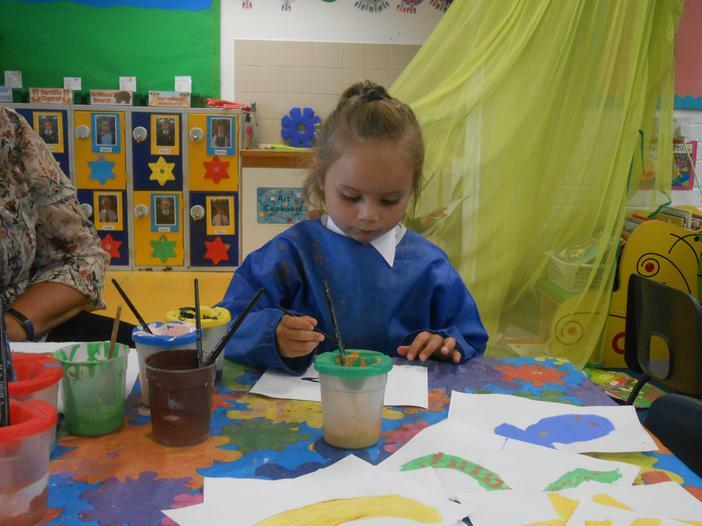 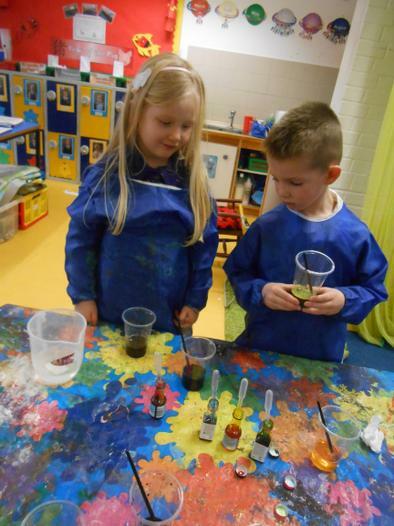 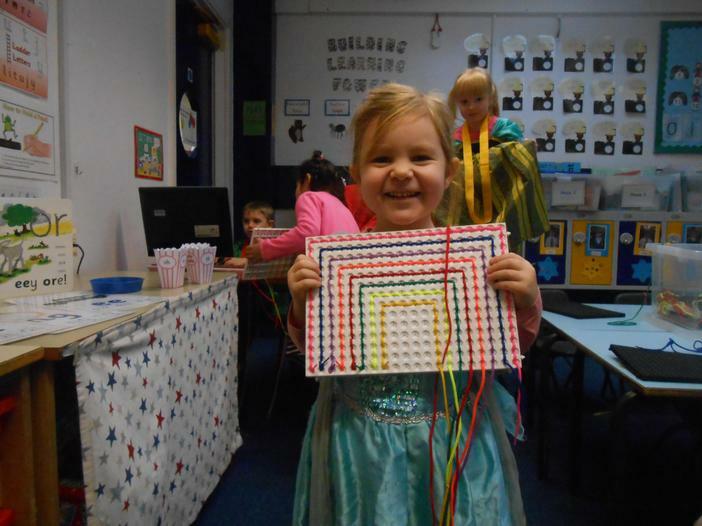 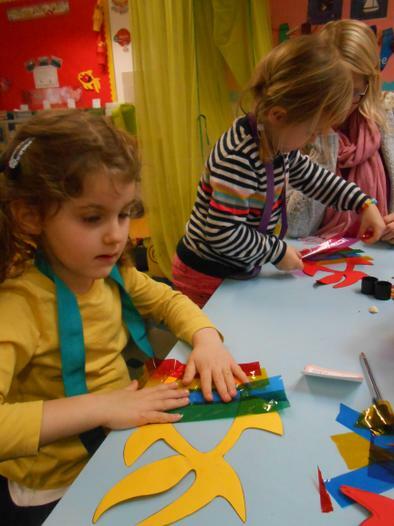 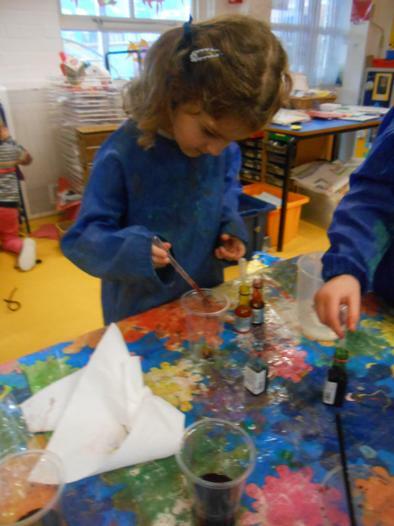 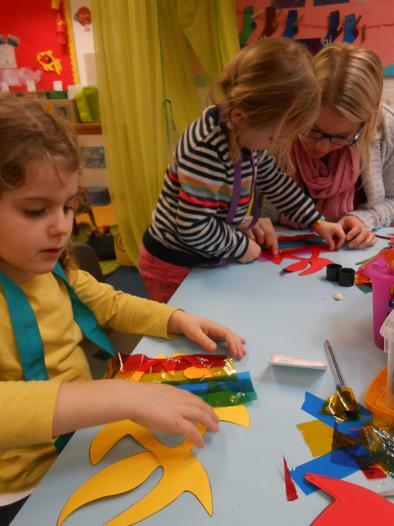 We have done lots of art, dance, story telling and other activities related to the topic. 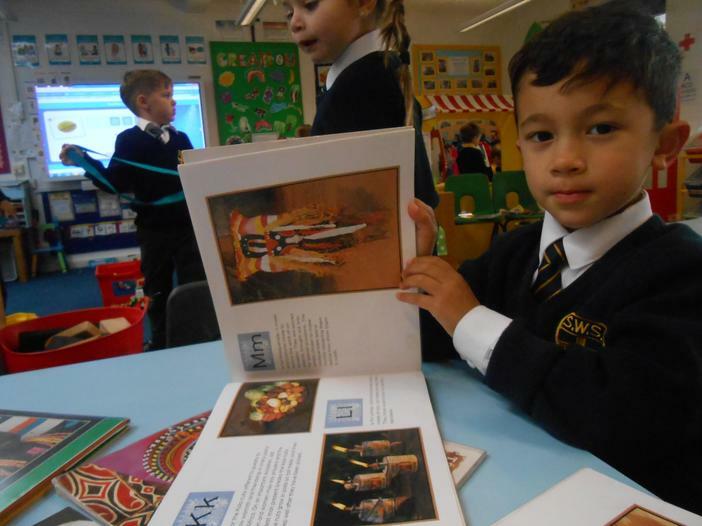 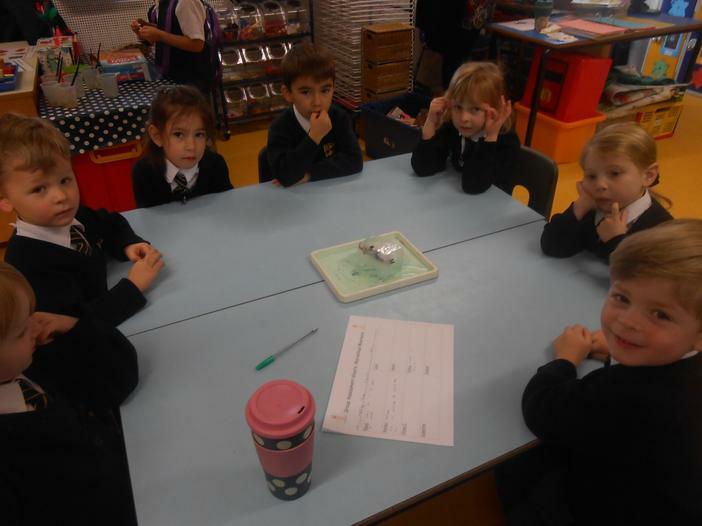 We enjoyed hearing stories about Handa too in this topic. 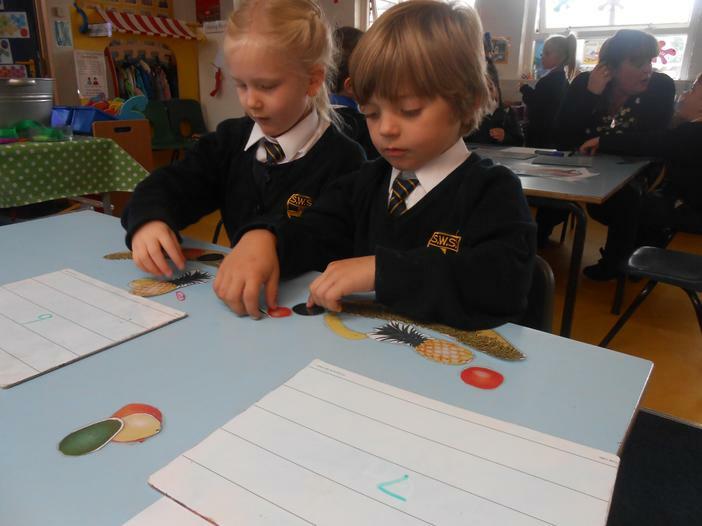 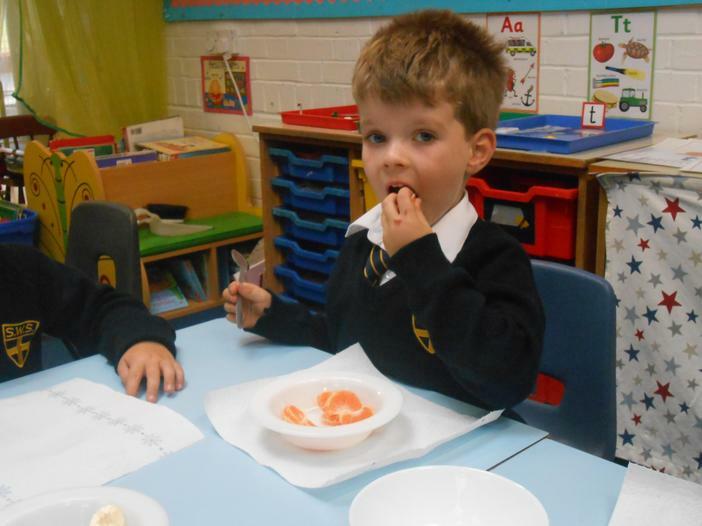 We tasted fruit from the Handa's surprise story and painted our own Handas. 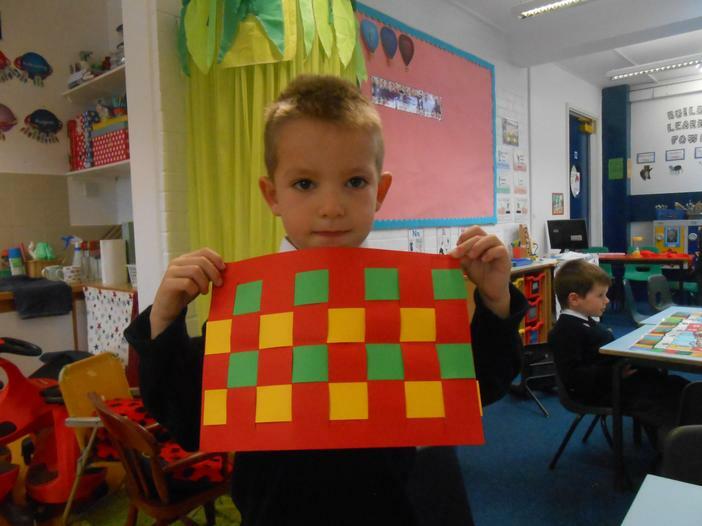 We also did some weaving, Adinkra paintings, savannah sunset art and painted African masks. 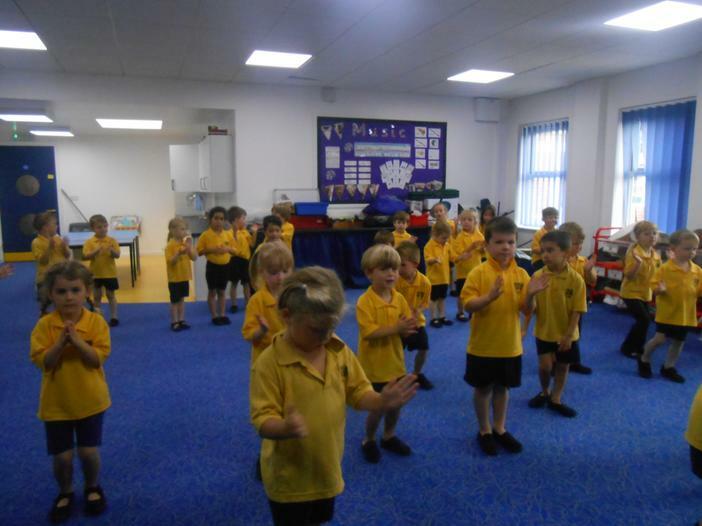 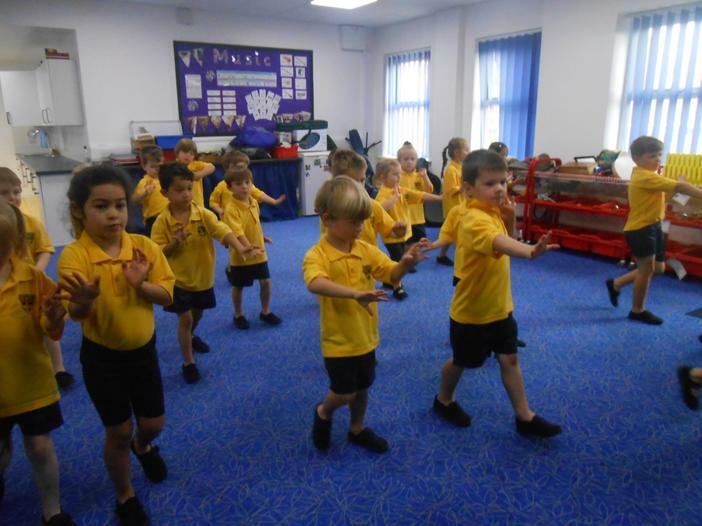 We have listened to and responded to African music and learnt an African dance. 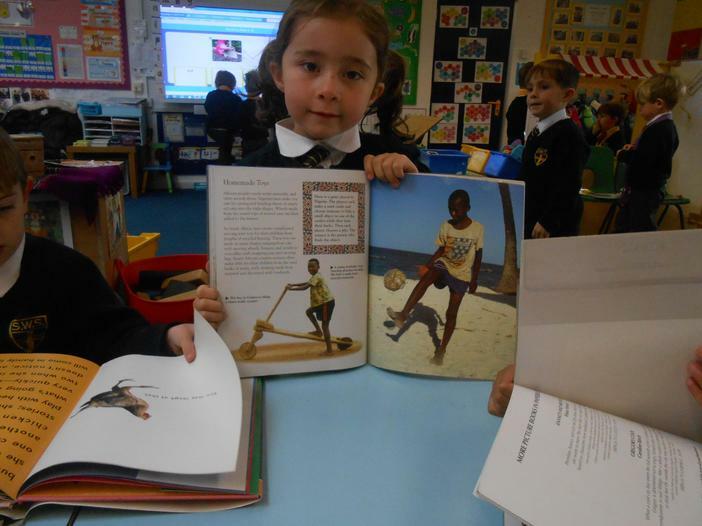 Africa is amazing! 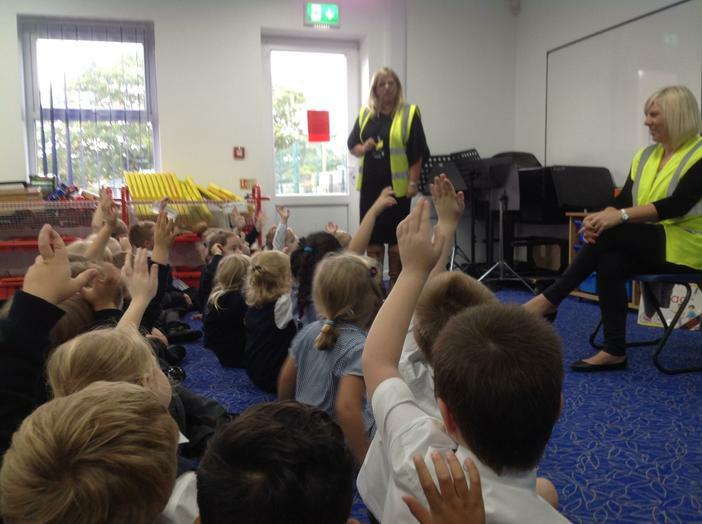 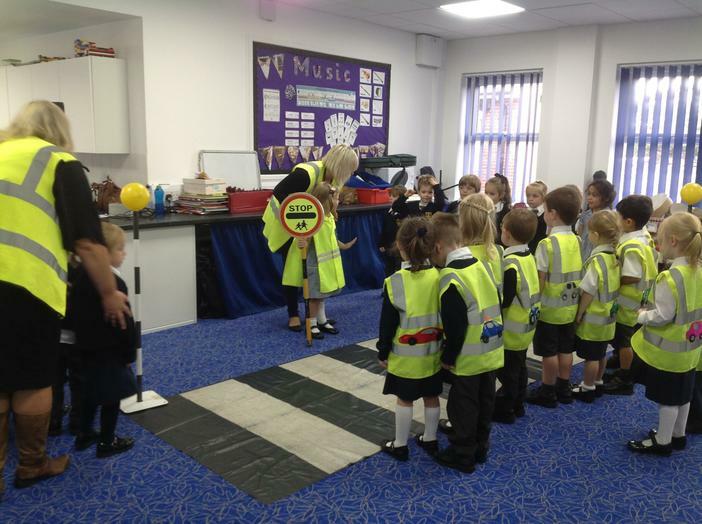 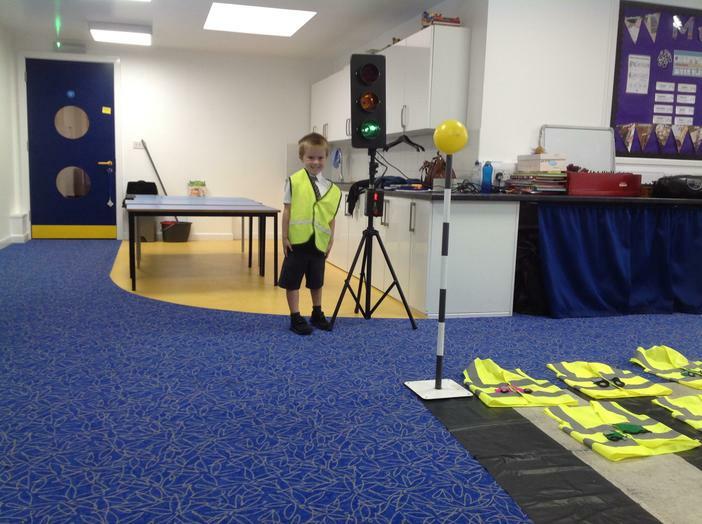 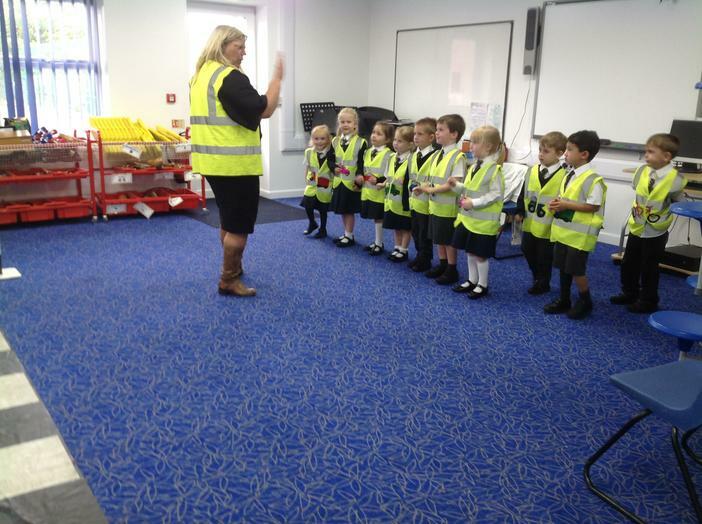 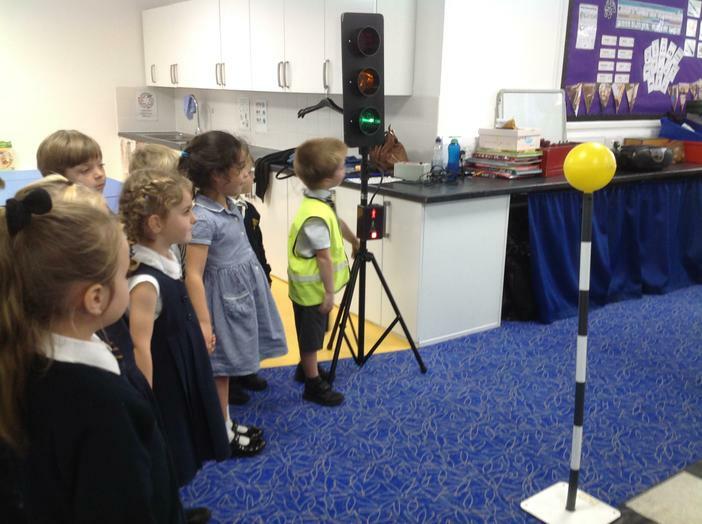 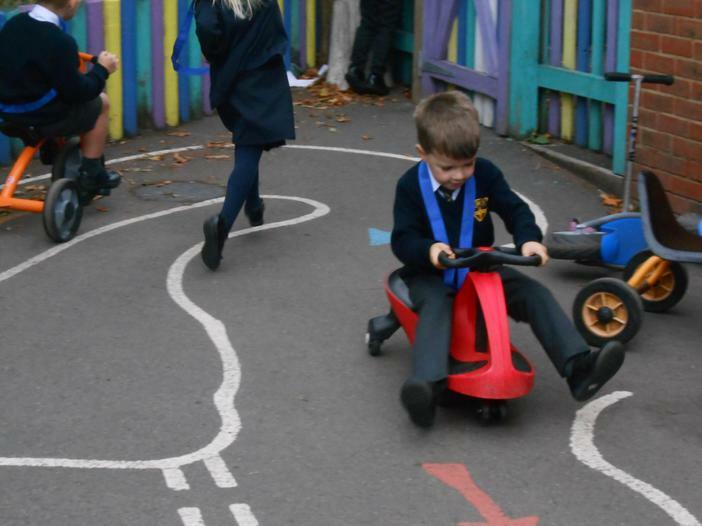 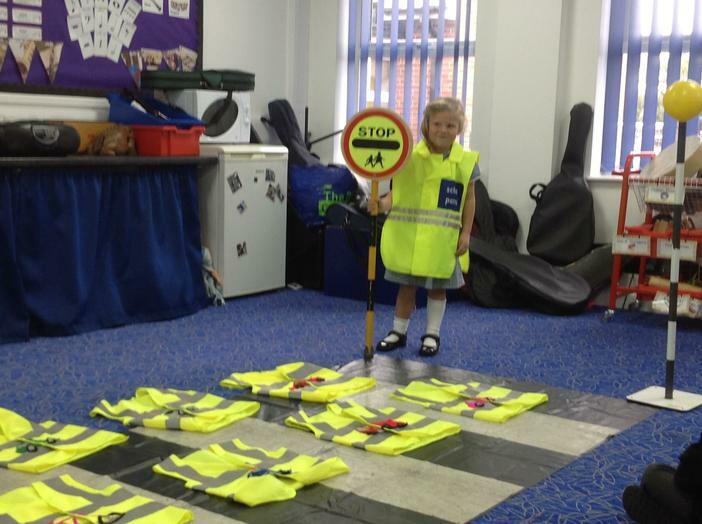 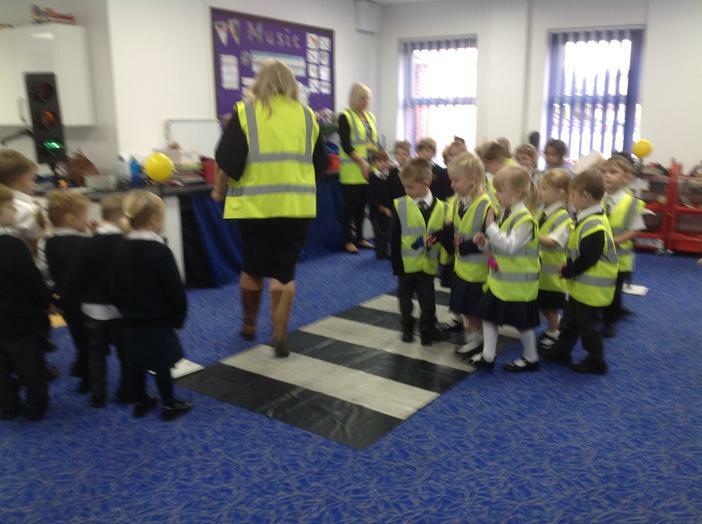 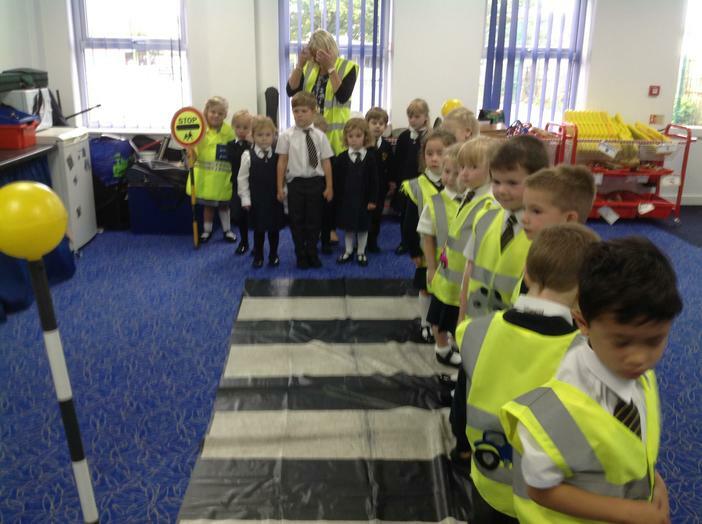 We had a lot of fun today learning about road safety ! 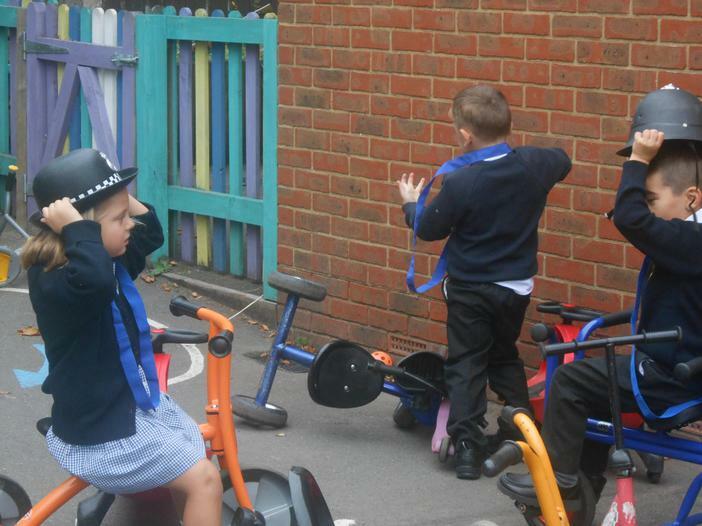 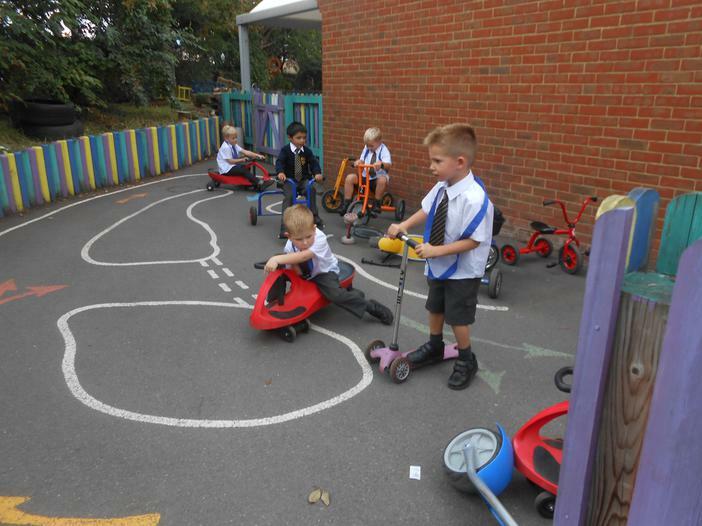 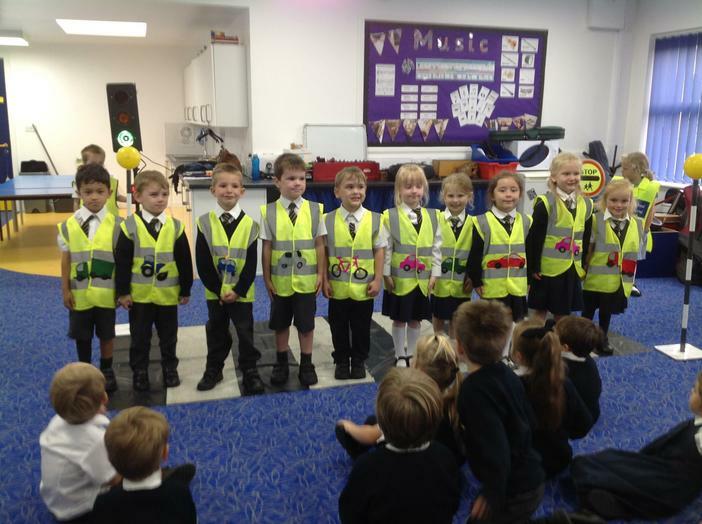 We had some special visitors who talked to us about how to keep ourselves safe when out and about on the roads, in our cars or on our bikes and scooters. 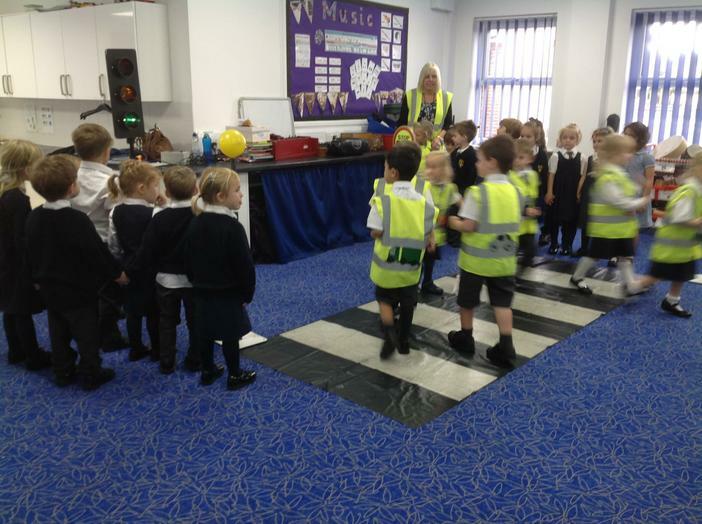 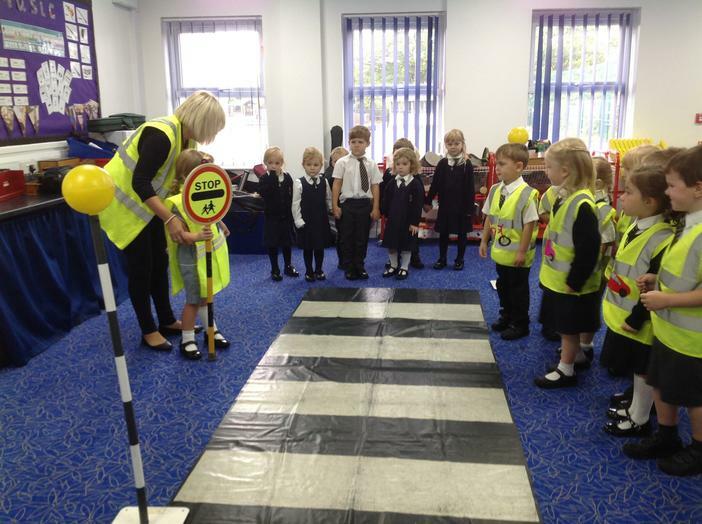 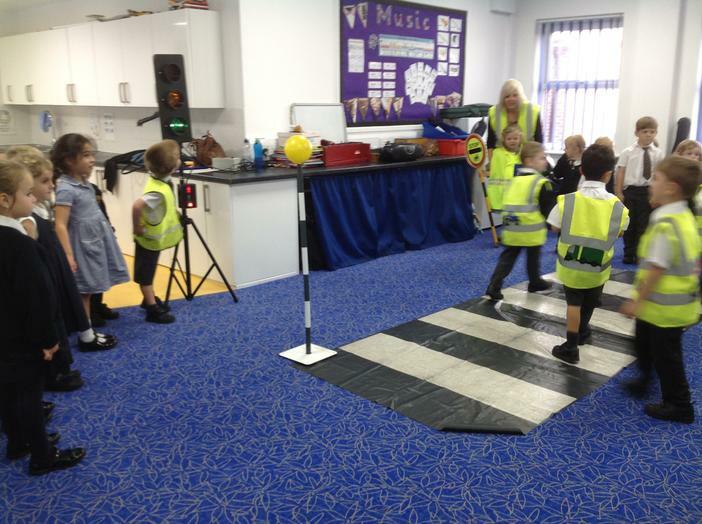 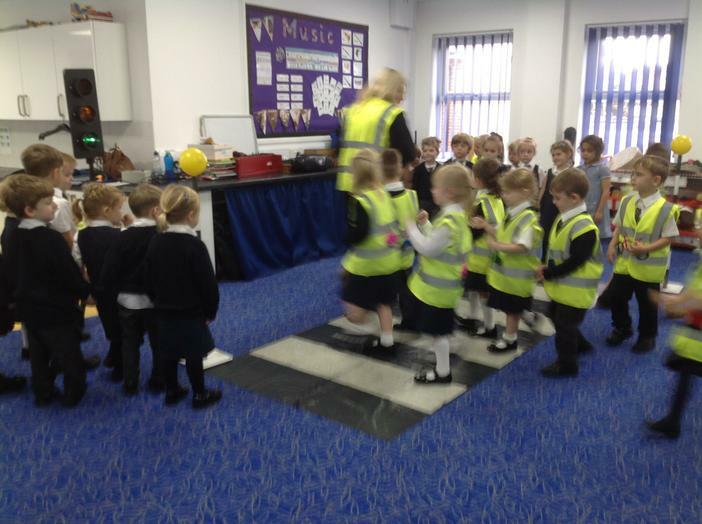 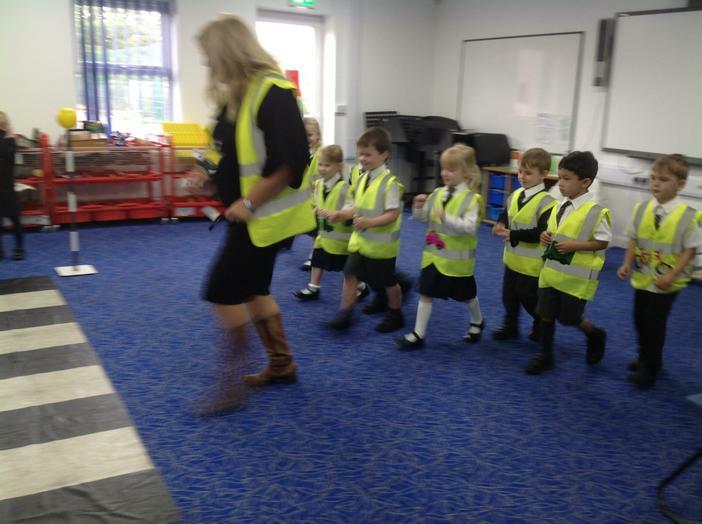 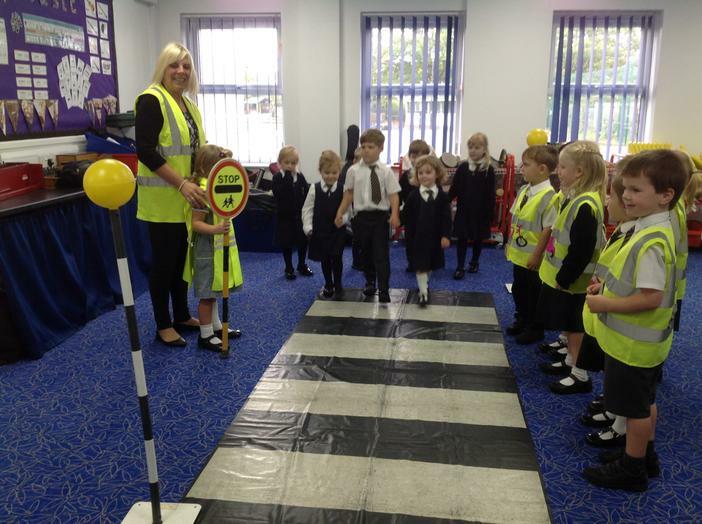 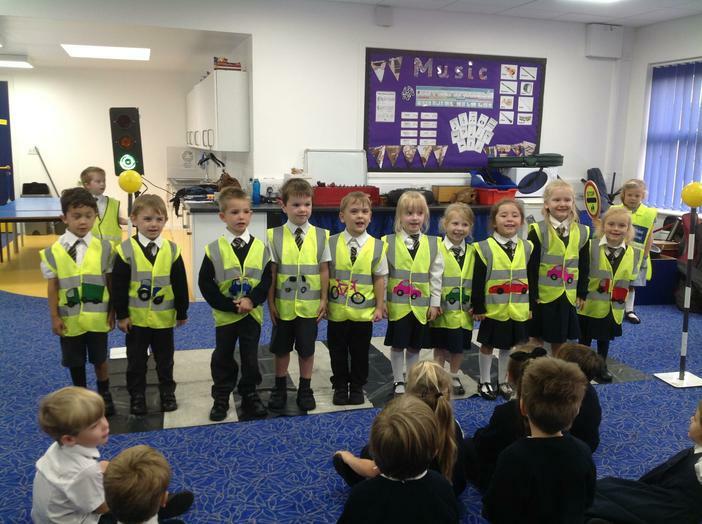 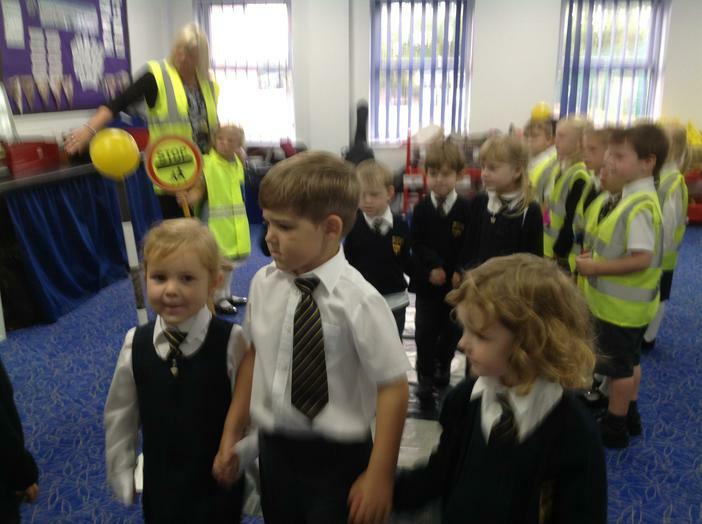 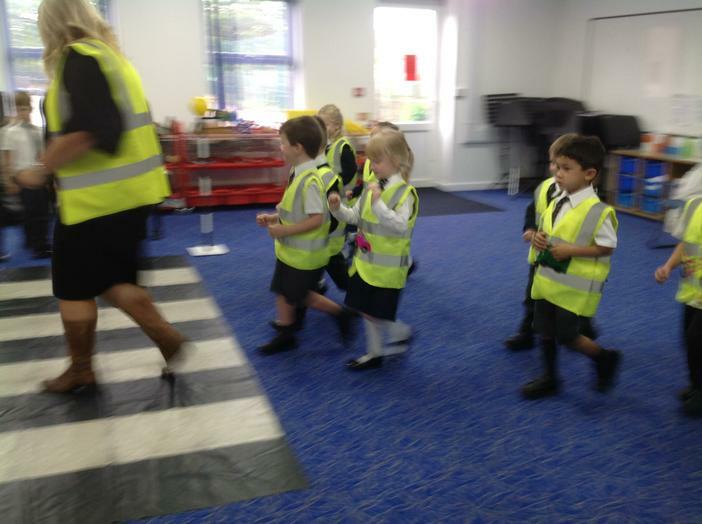 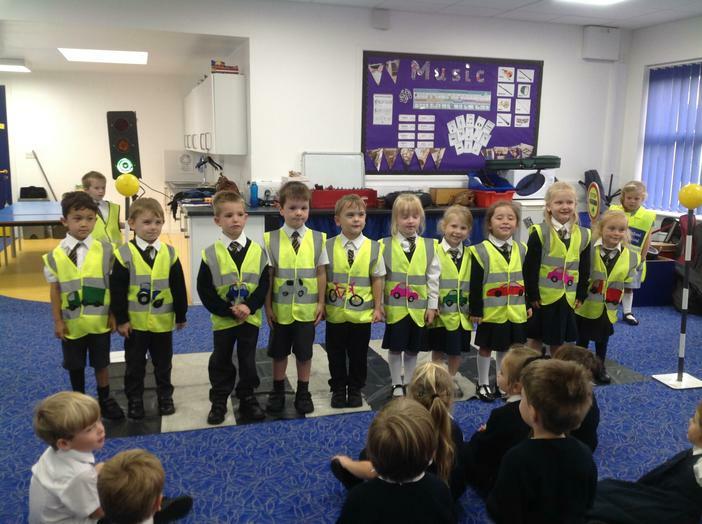 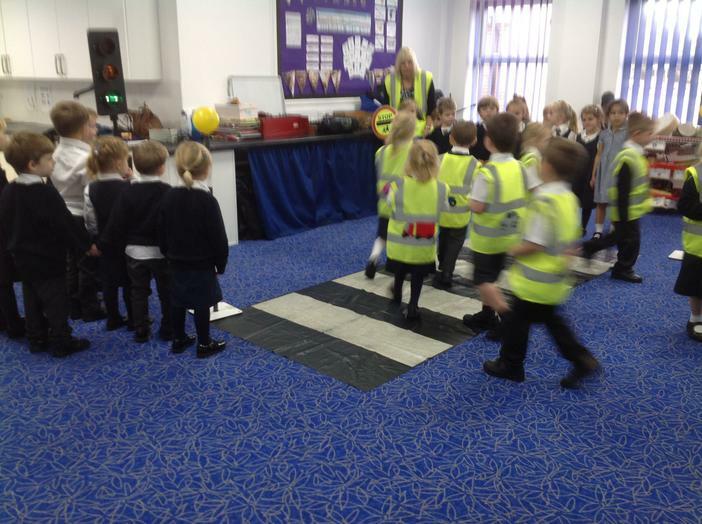 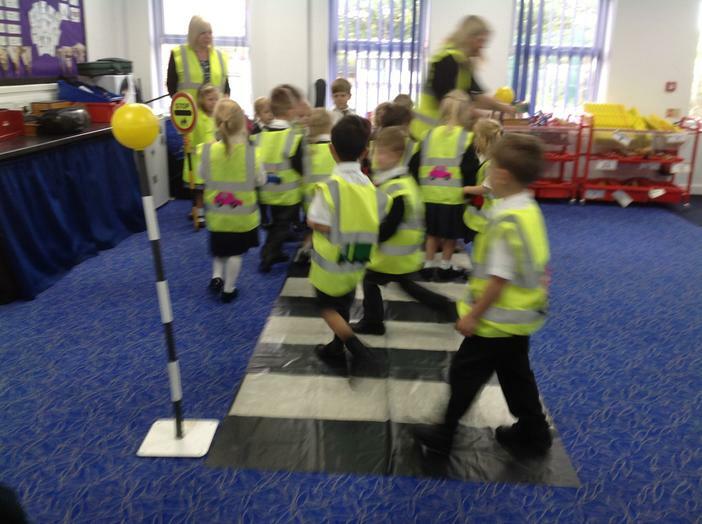 We had fun being either a vehicle, pedestrians or people helping others to cross the road! 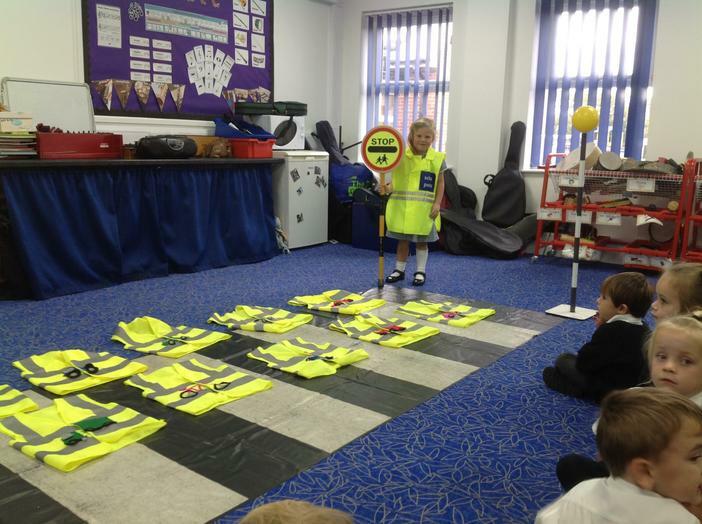 We learnt how important it is to stop, look, listen and think before we cross roads. 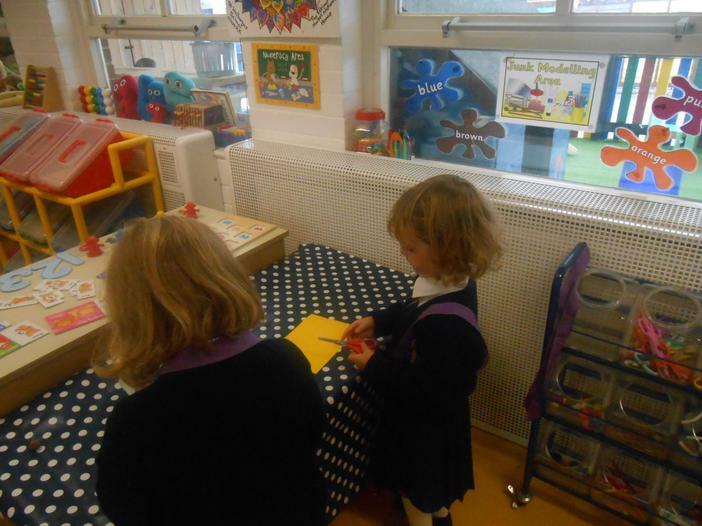 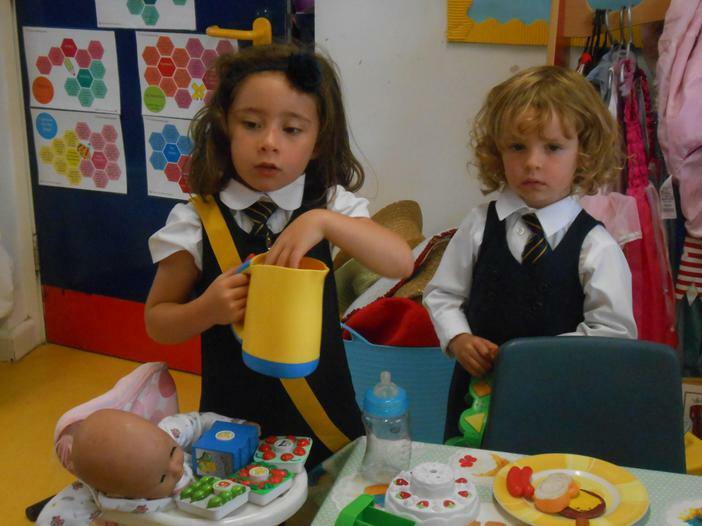 Our first weeks at big school! 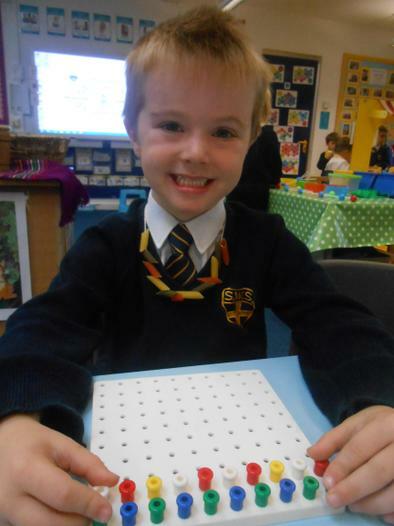 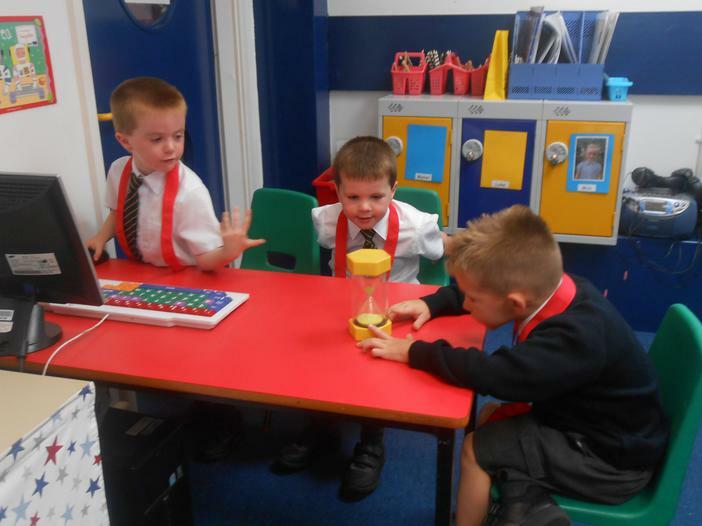 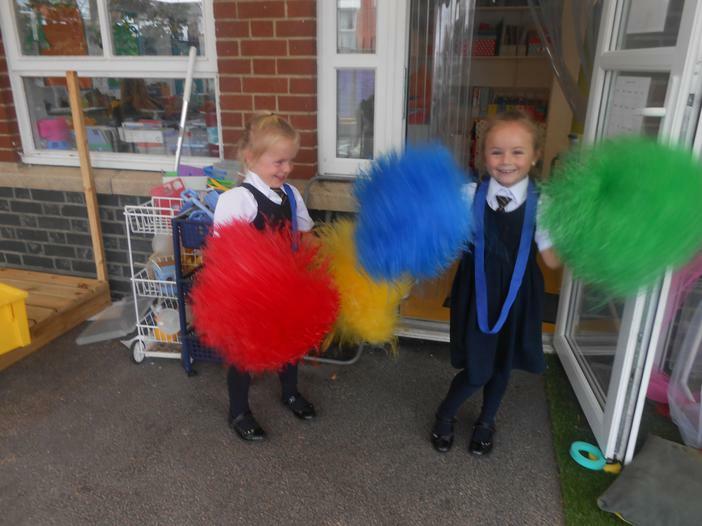 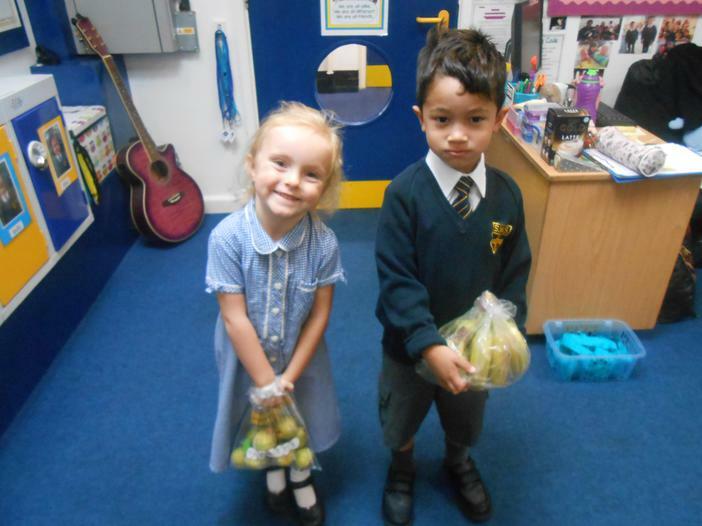 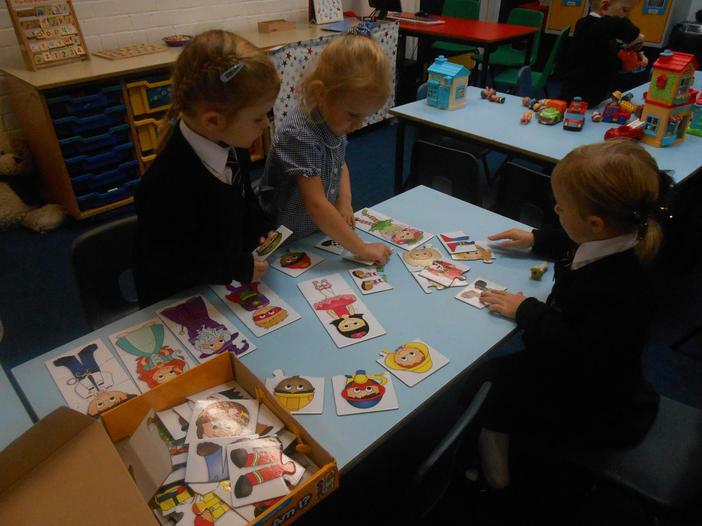 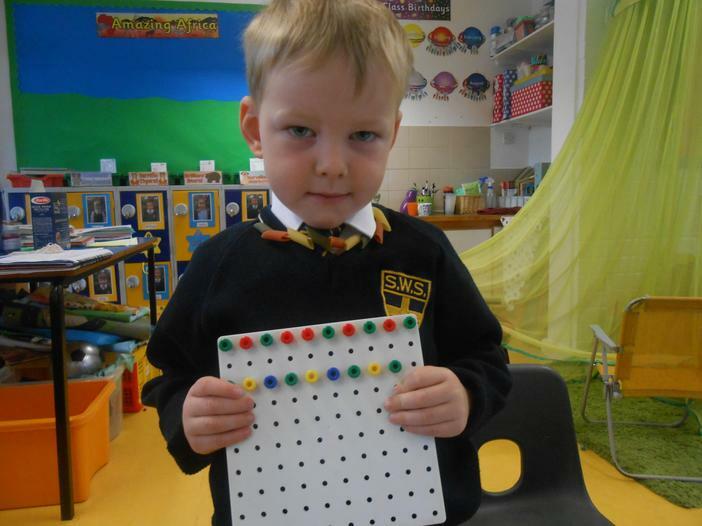 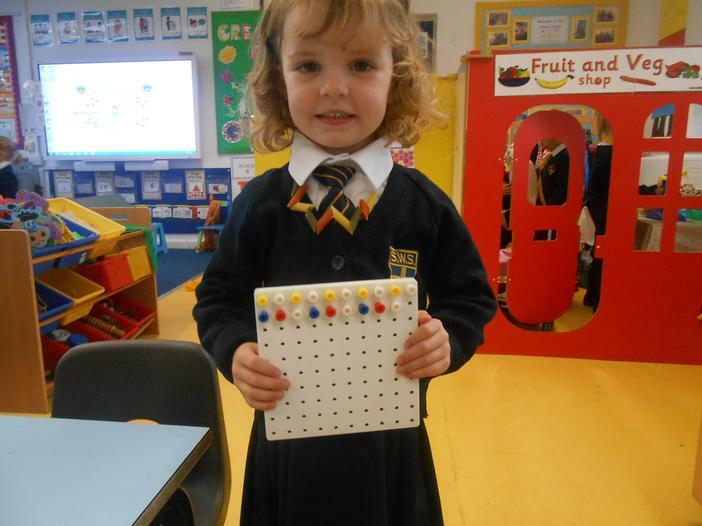 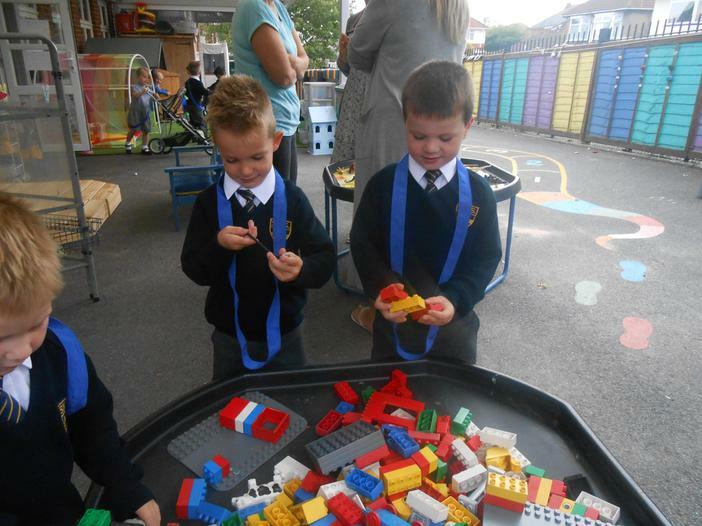 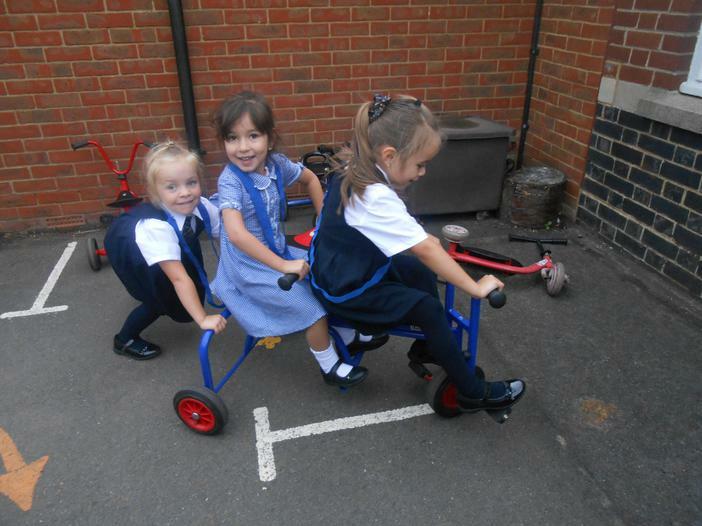 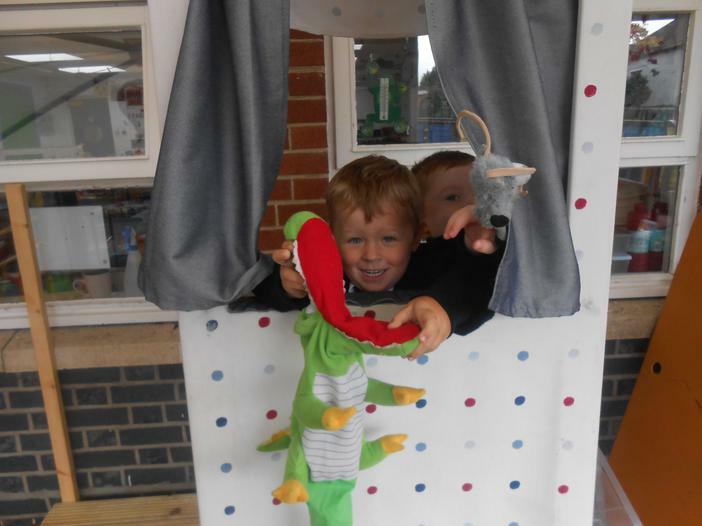 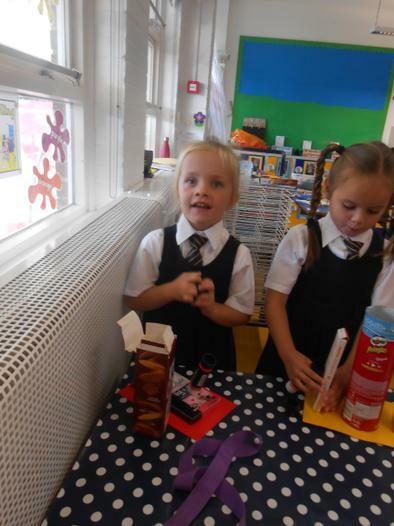 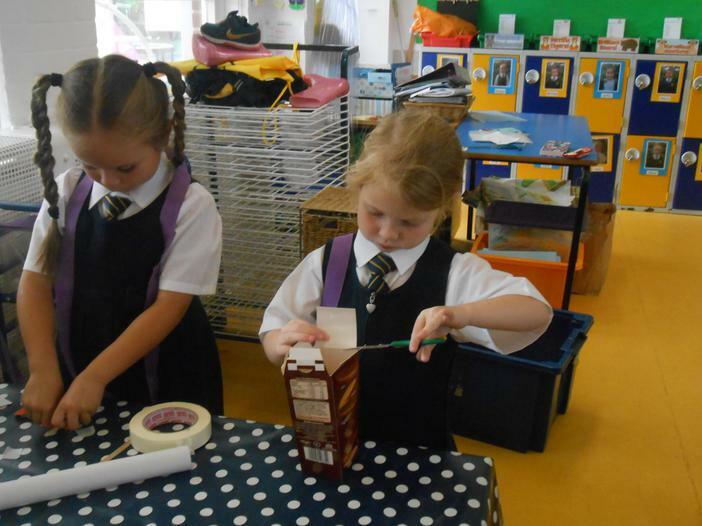 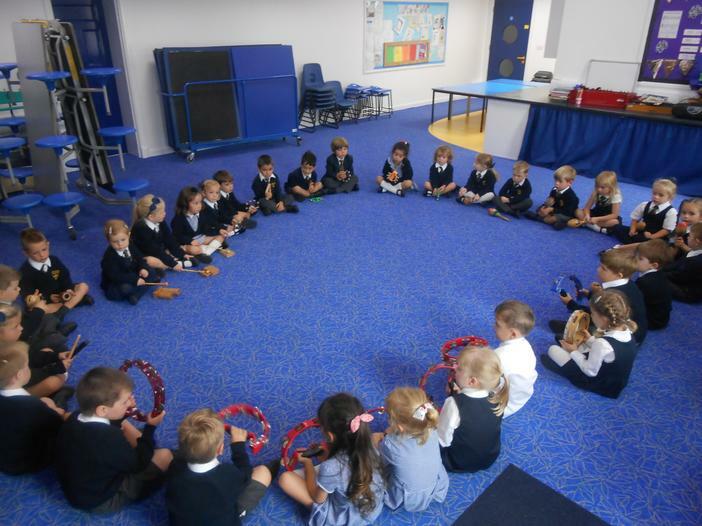 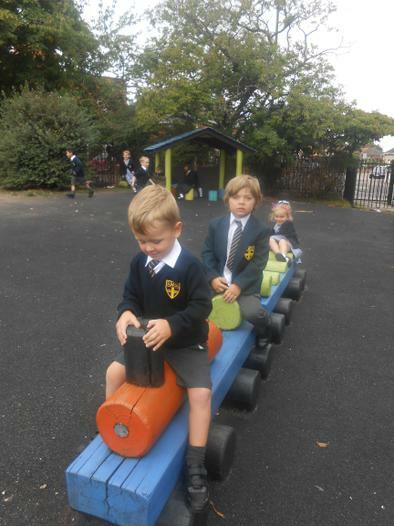 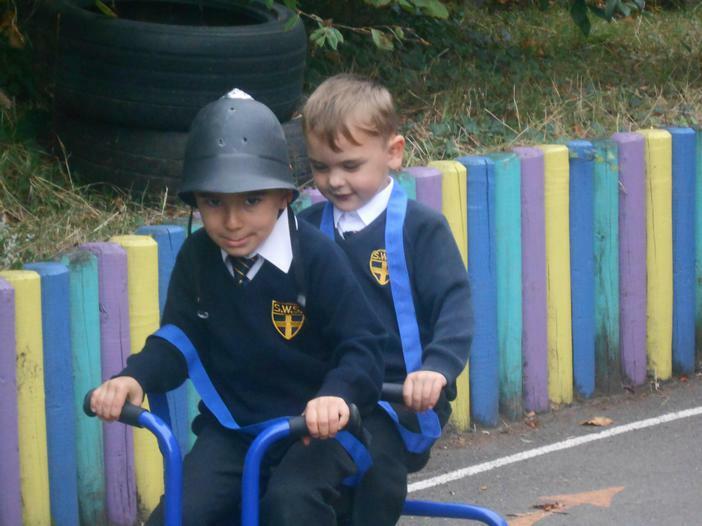 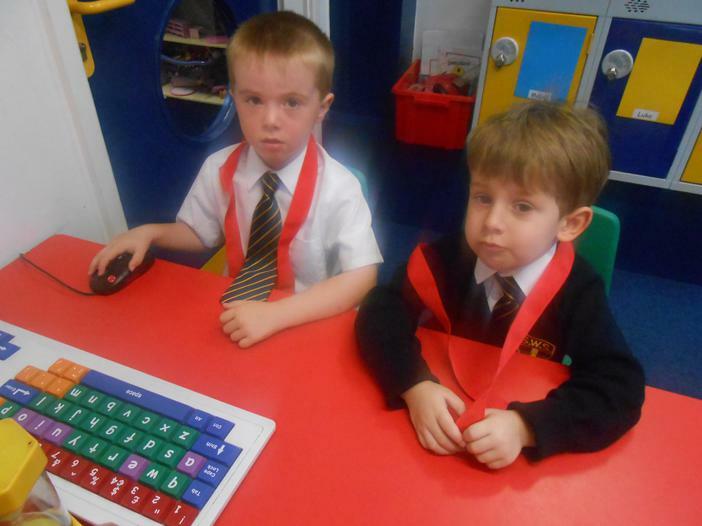 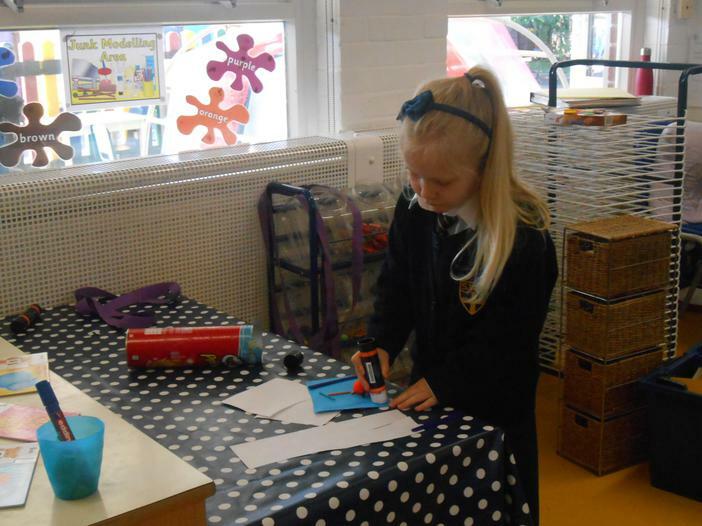 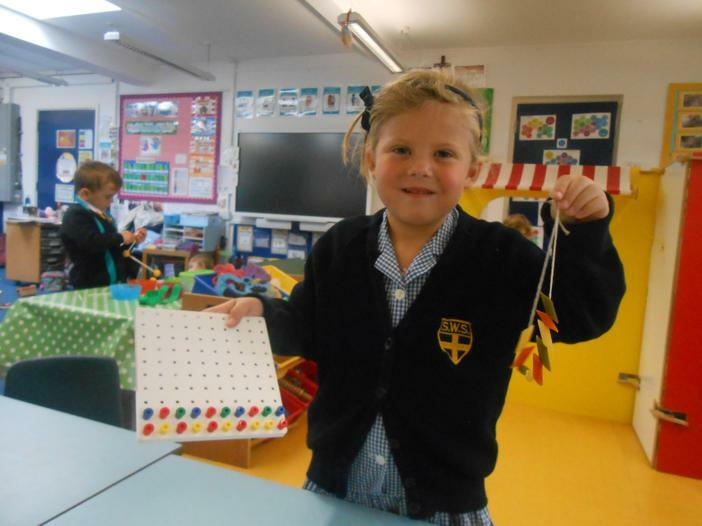 We have had lots of fun starting big school! 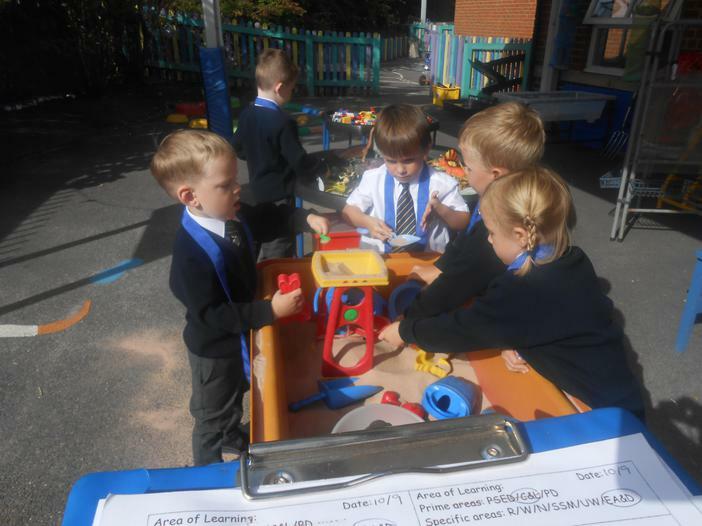 Getting to know our classroom, outdoor area, playground and the whole school. 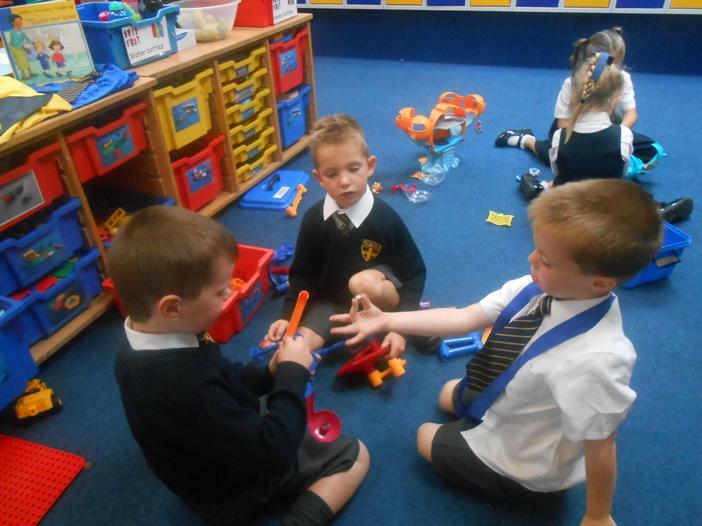 We have made friendships and got to know each other. 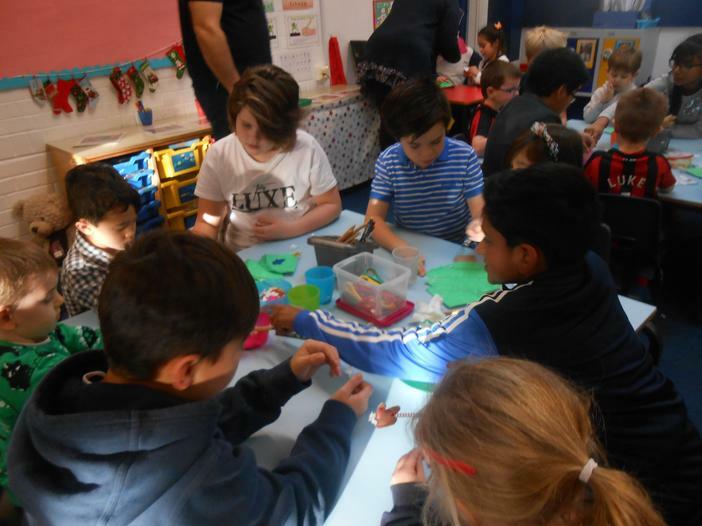 We are trying hard to learn all the rules and behaviour expectations at school and enjoying all the new experiences we are having together as a class and year group. 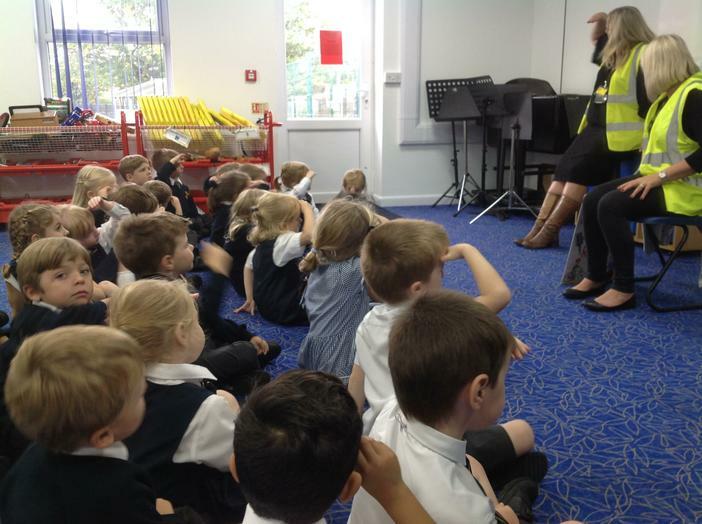 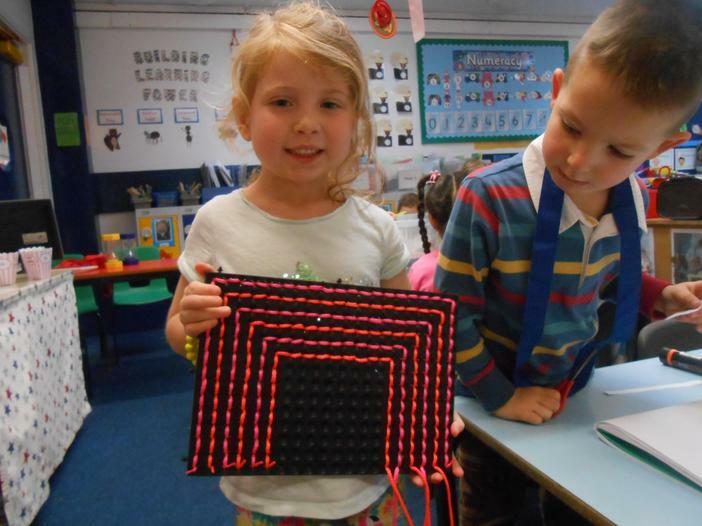 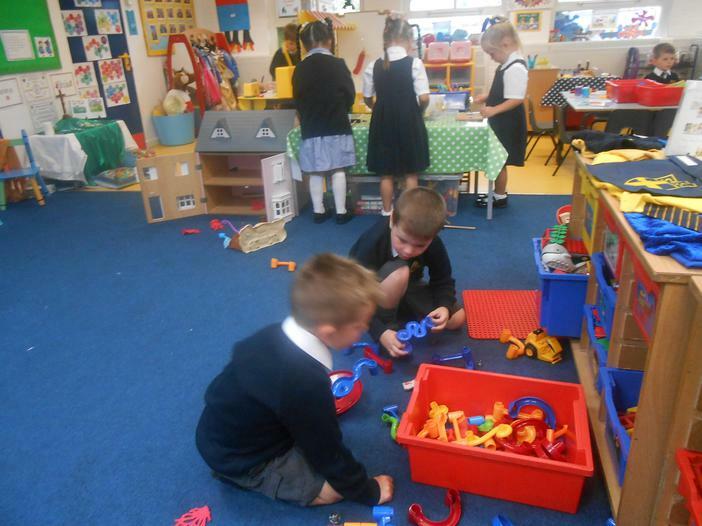 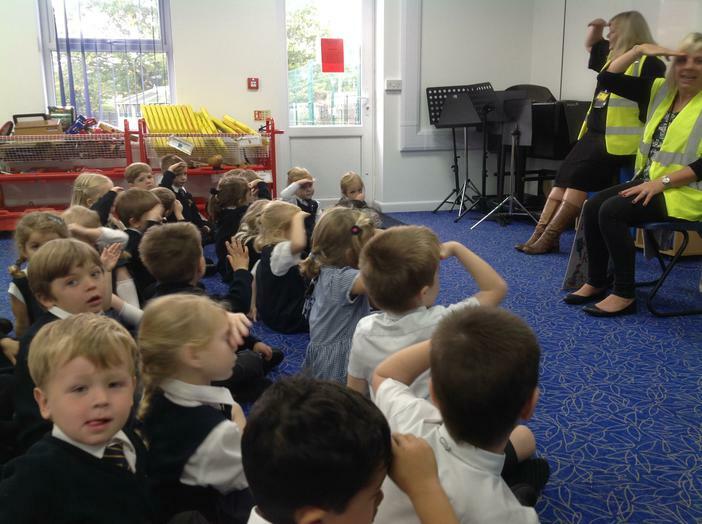 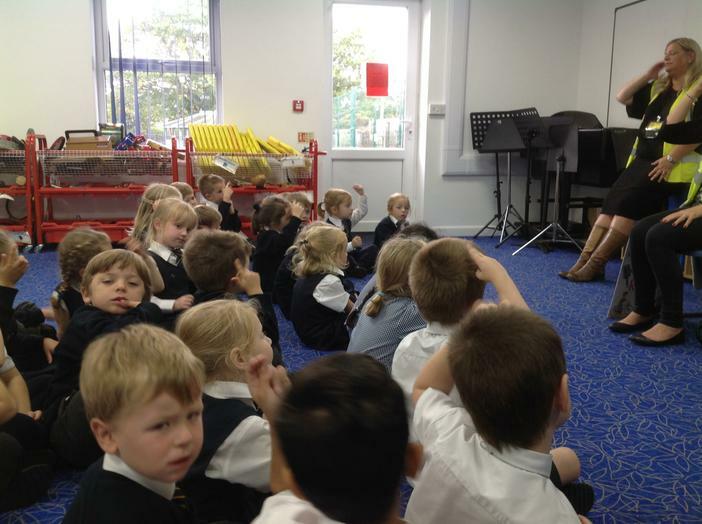 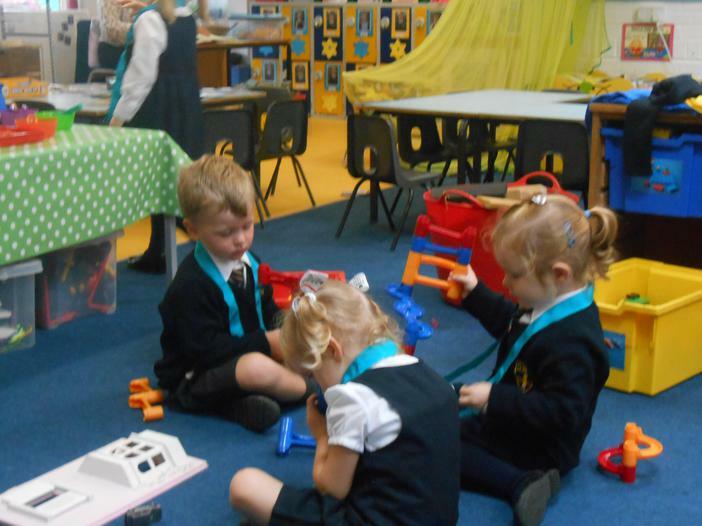 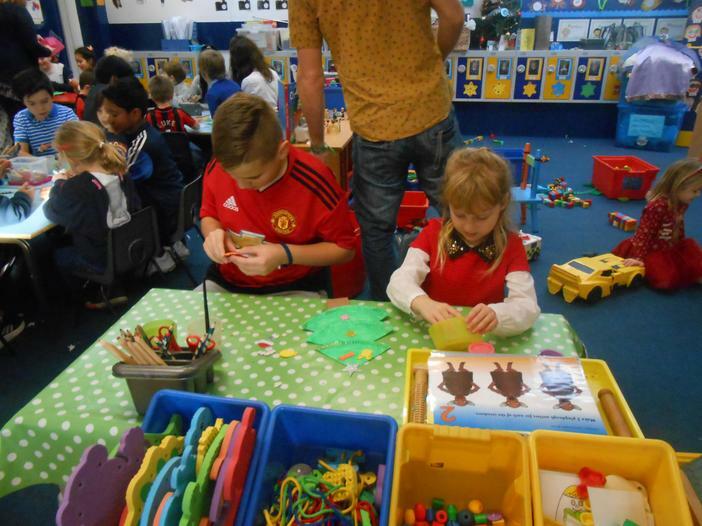 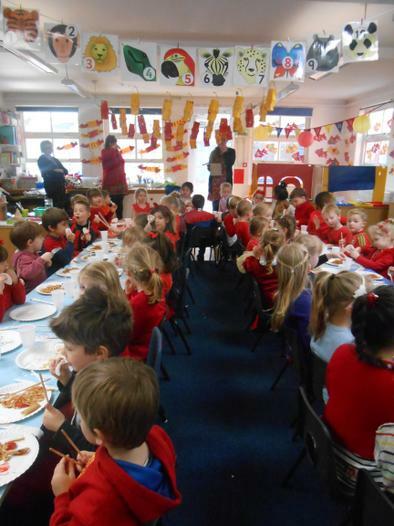 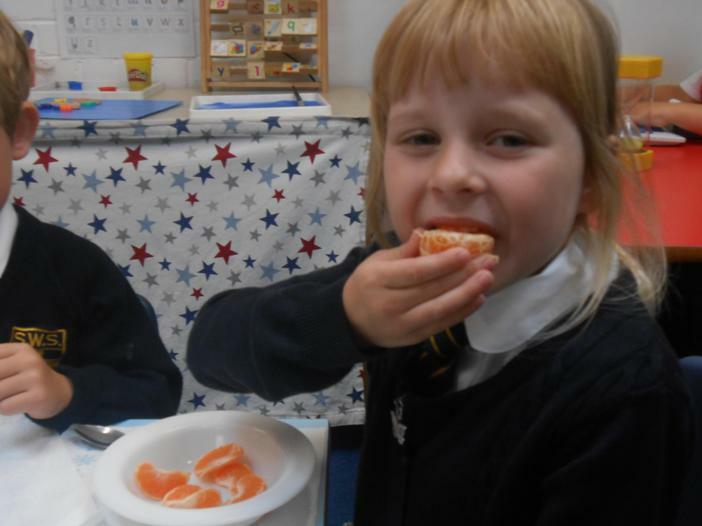 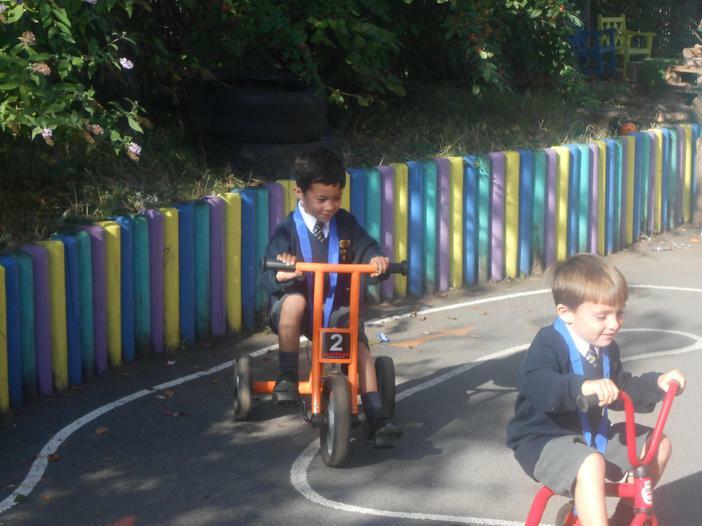 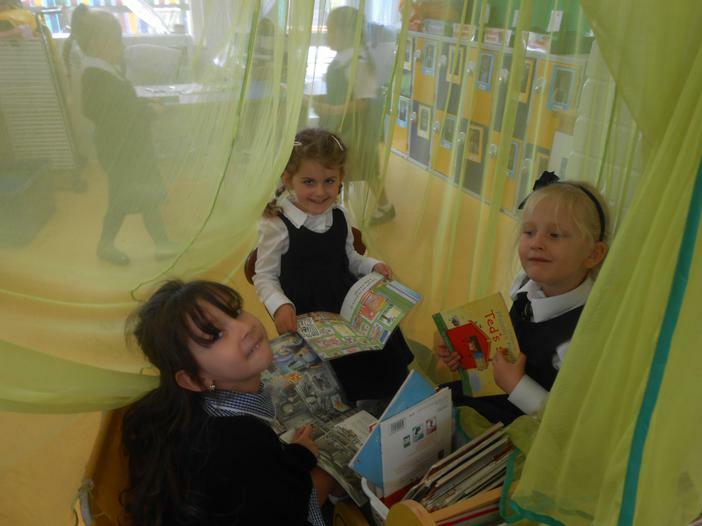 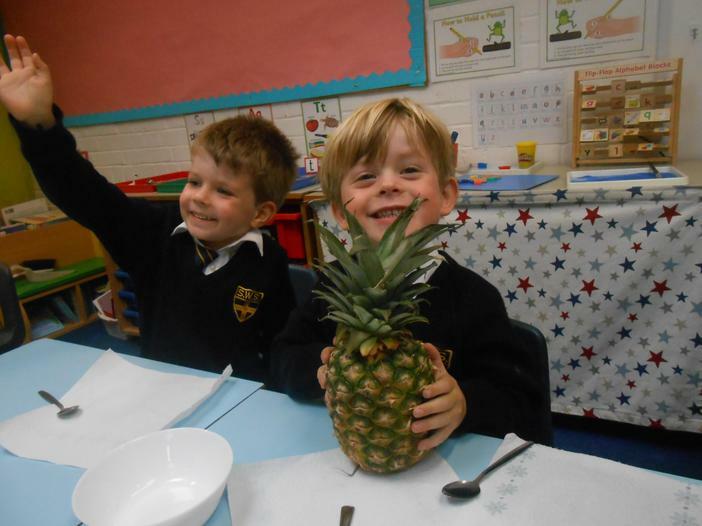 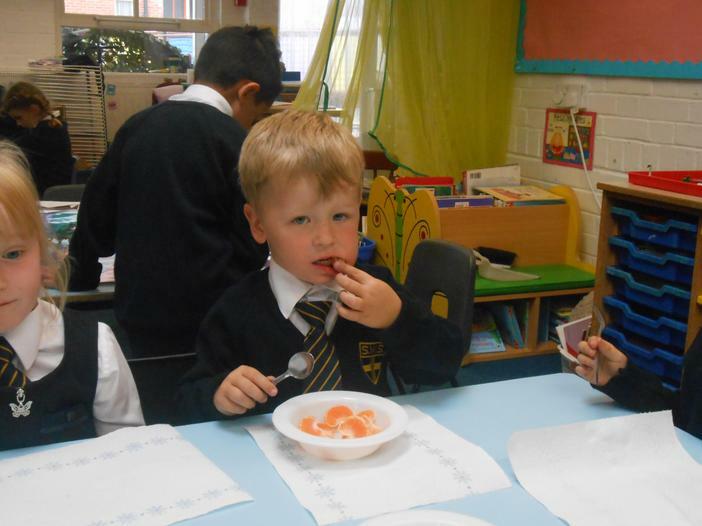 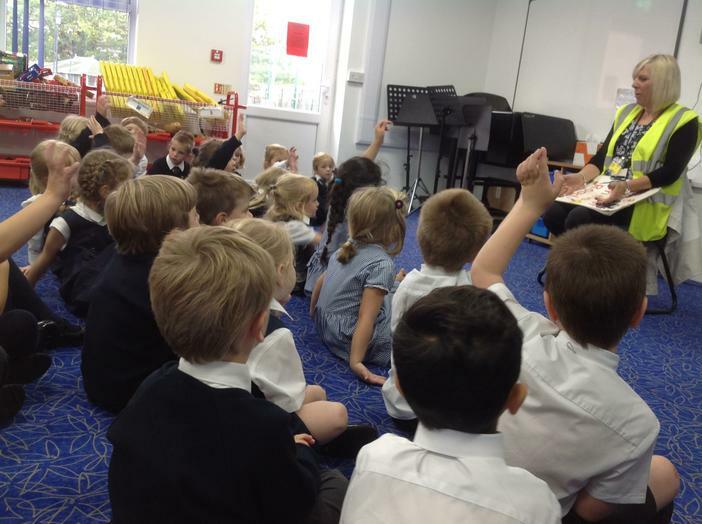 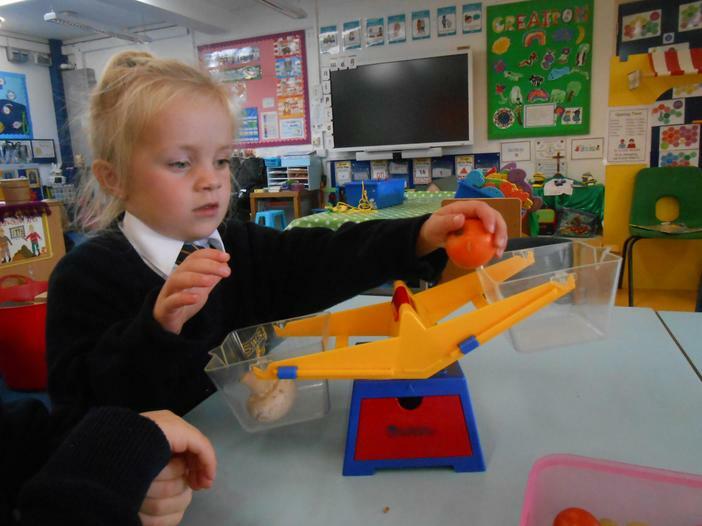 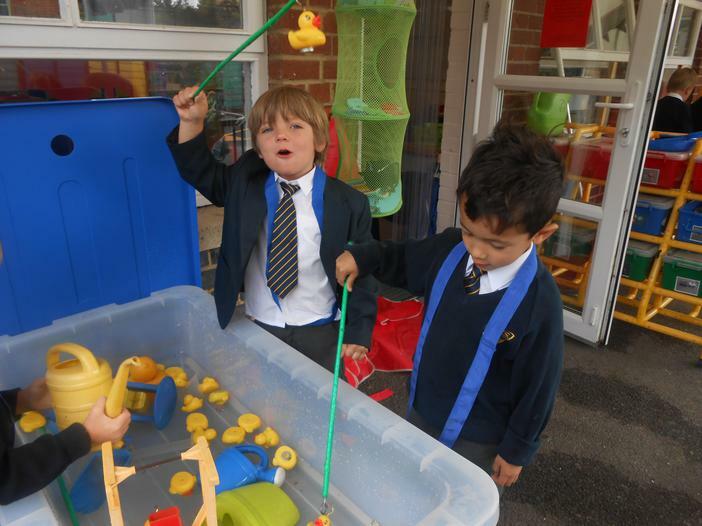 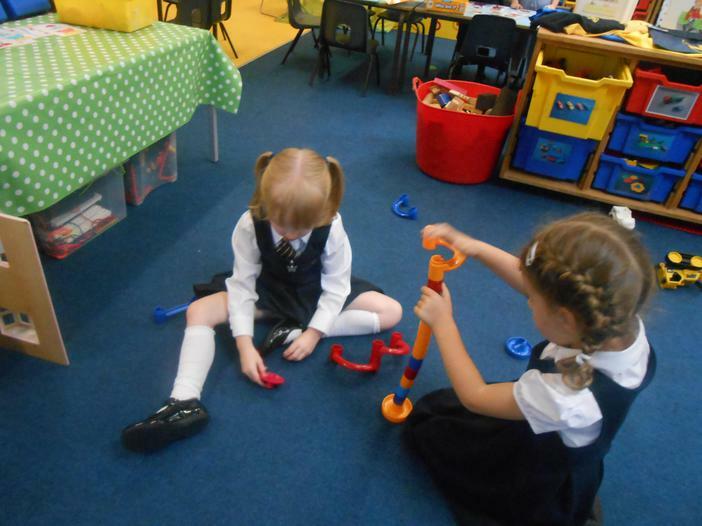 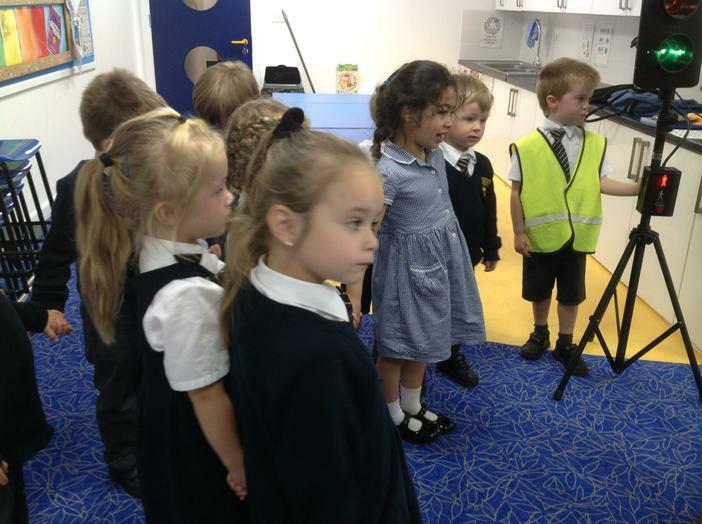 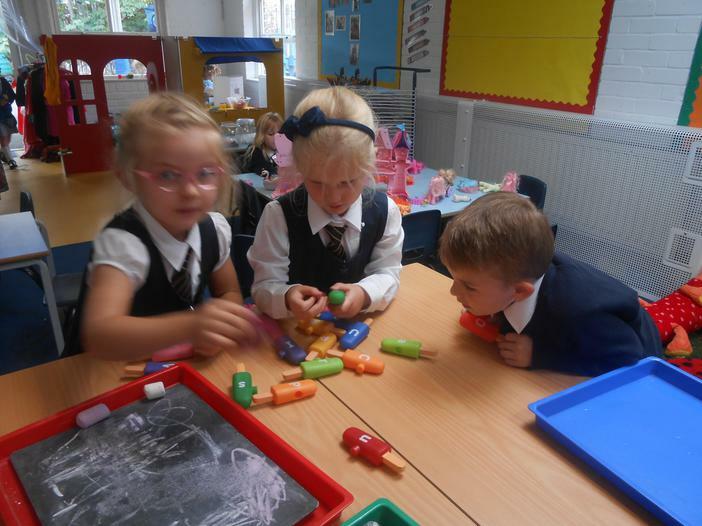 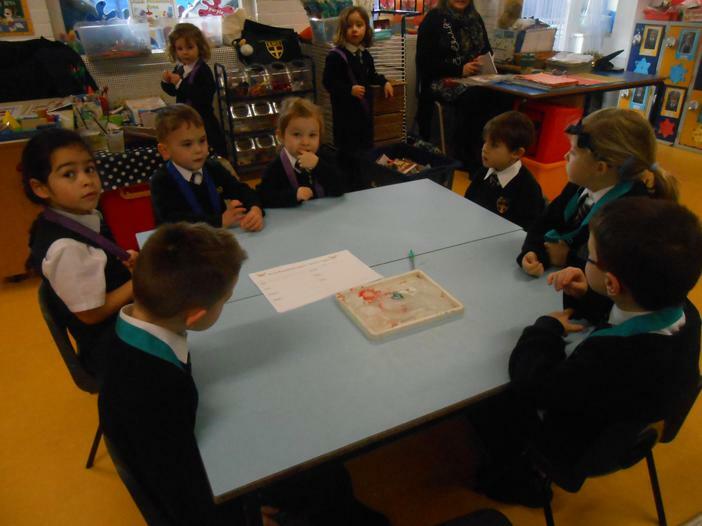 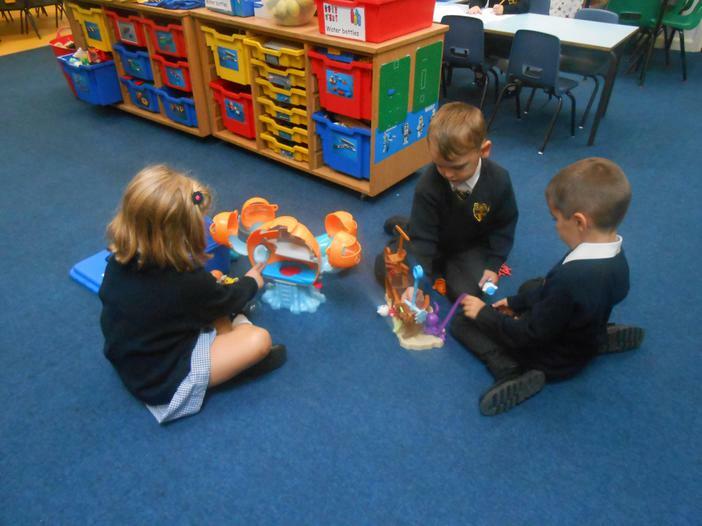 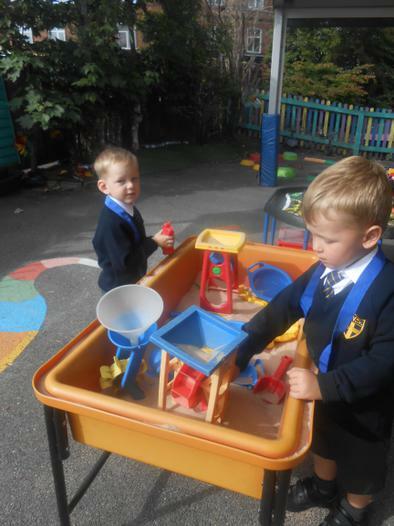 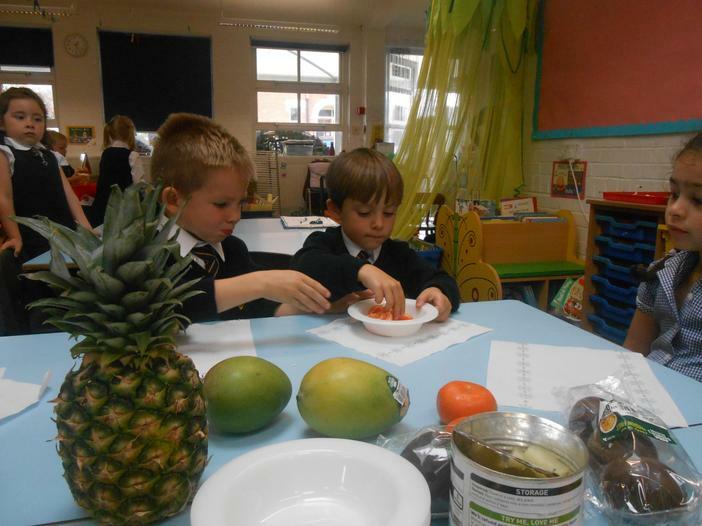 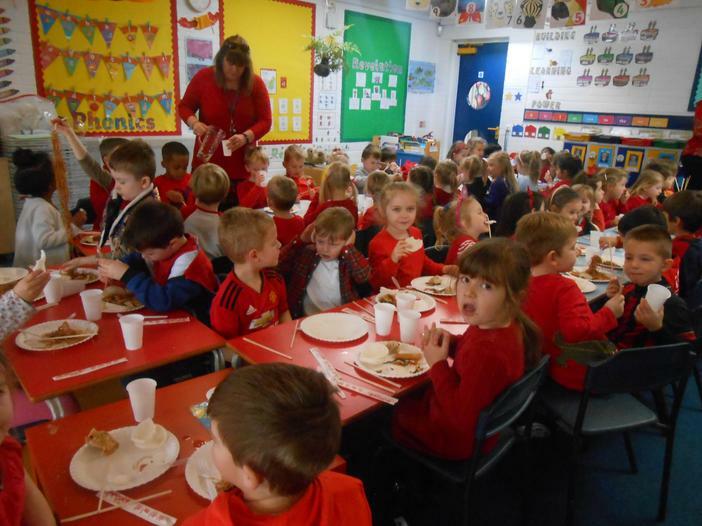 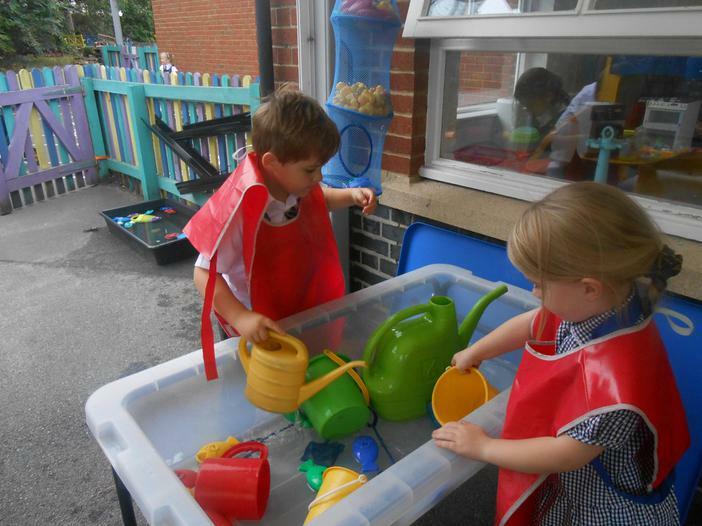 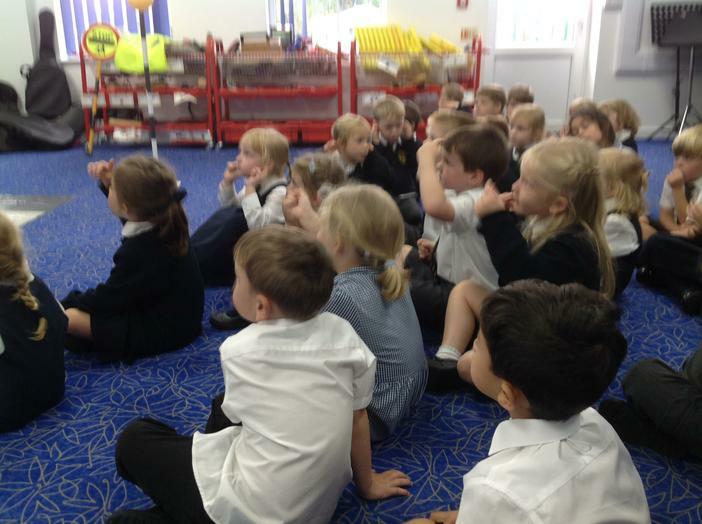 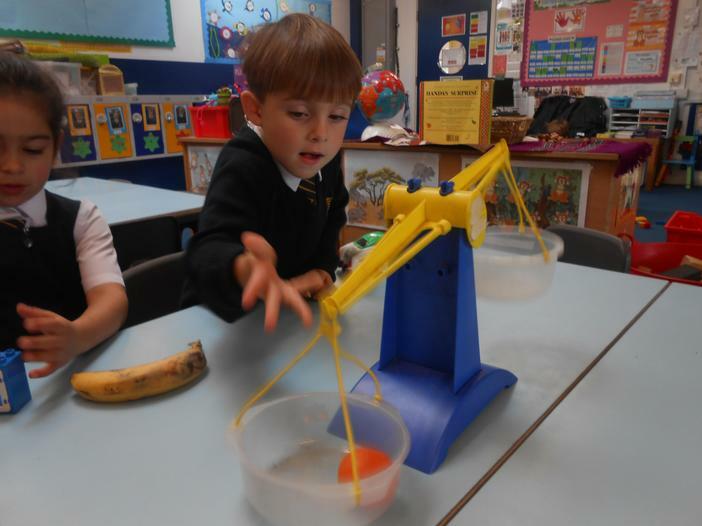 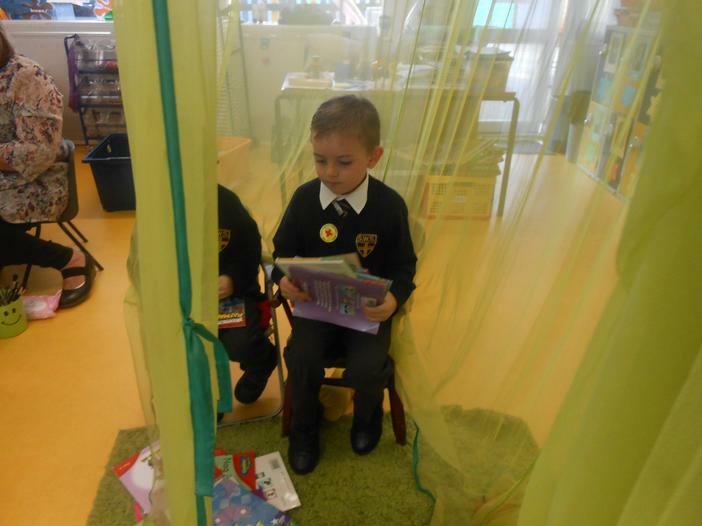 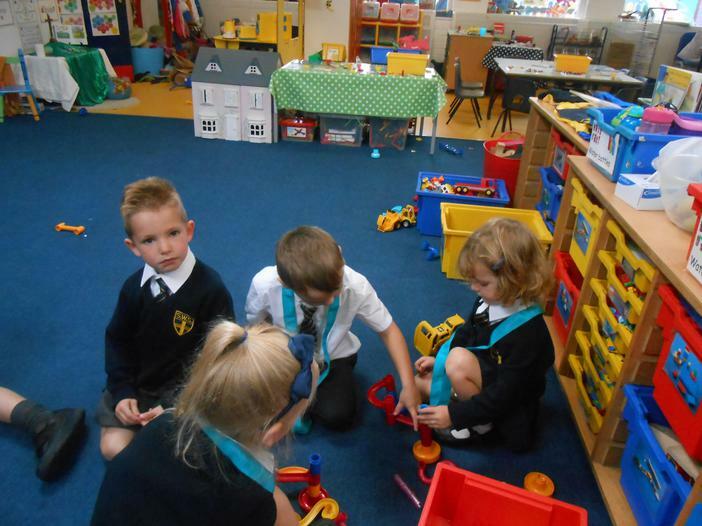 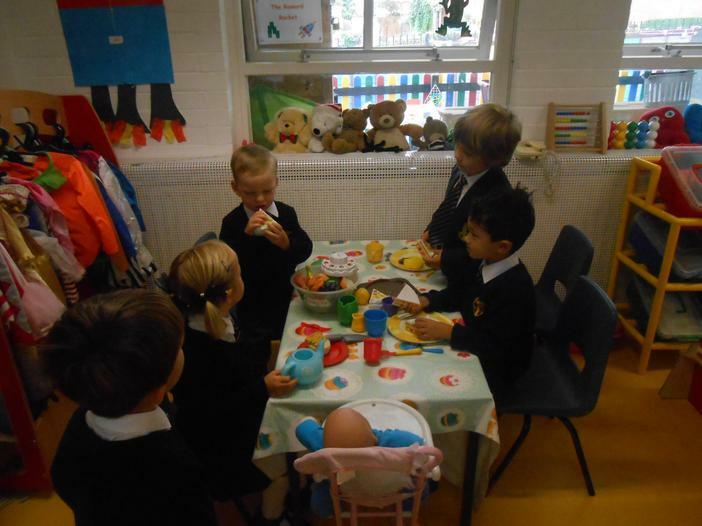 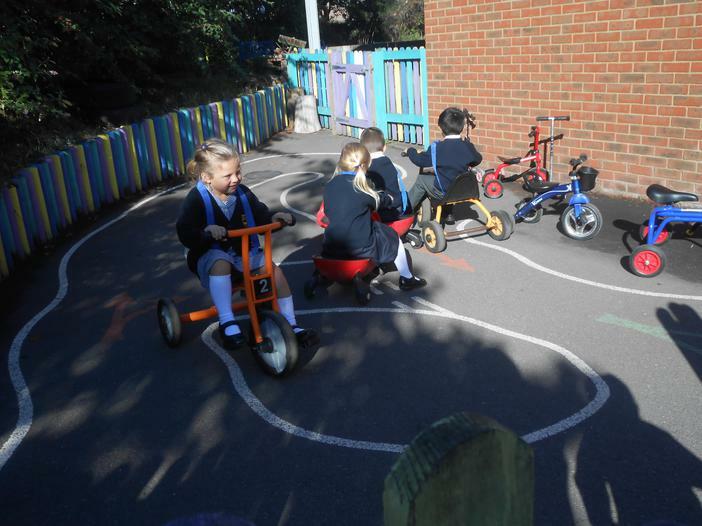 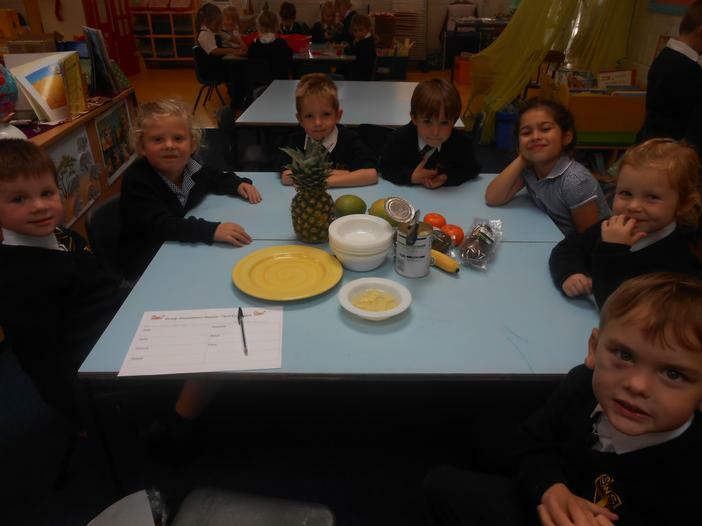 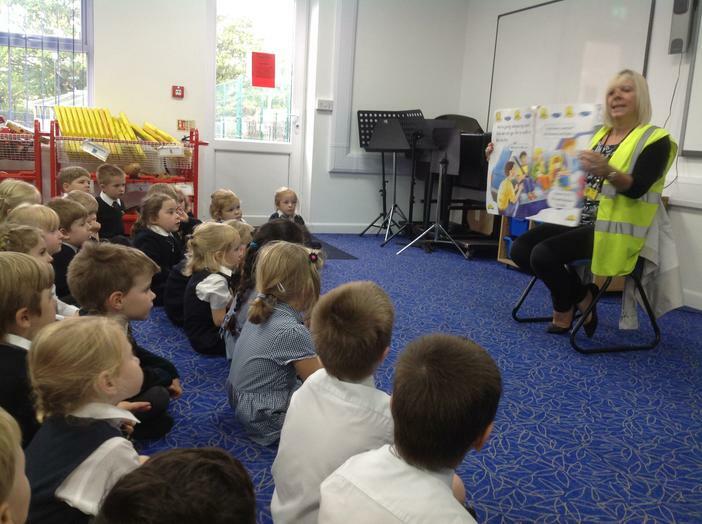 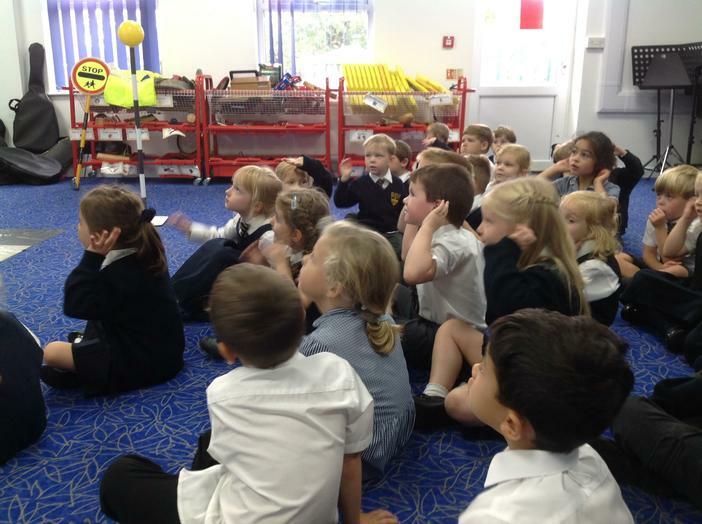 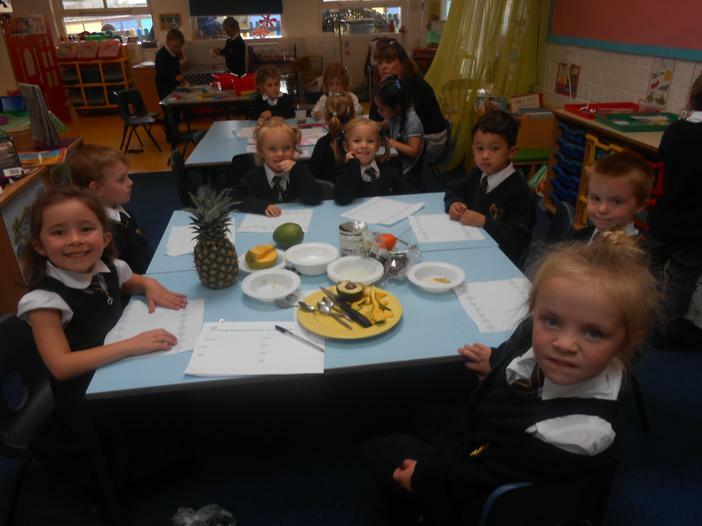 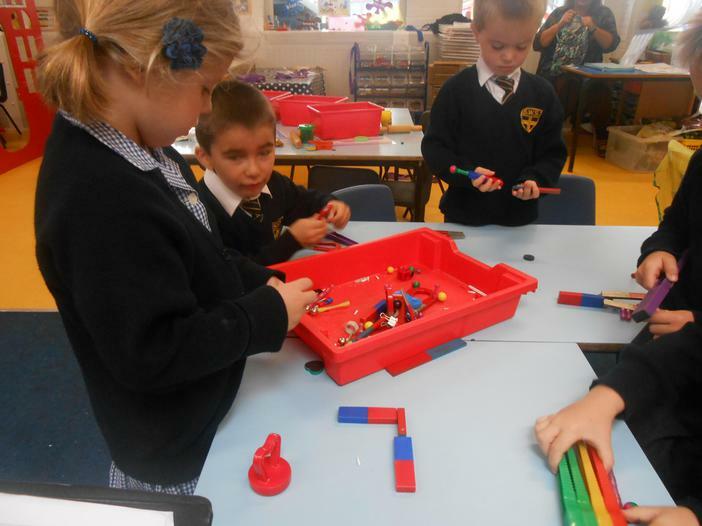 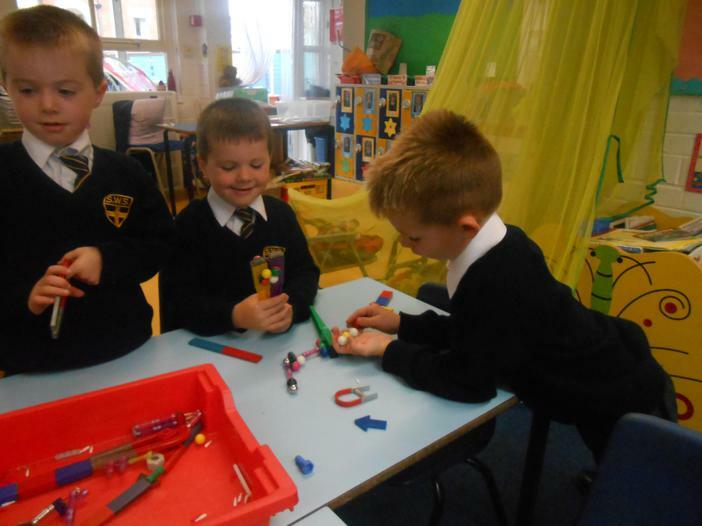 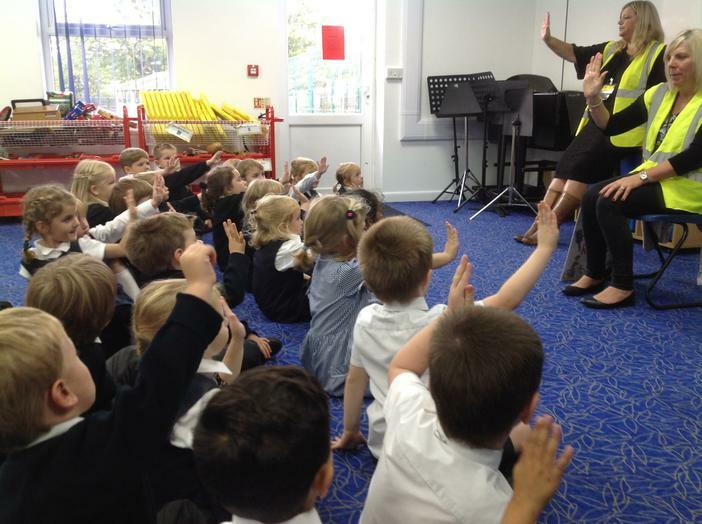 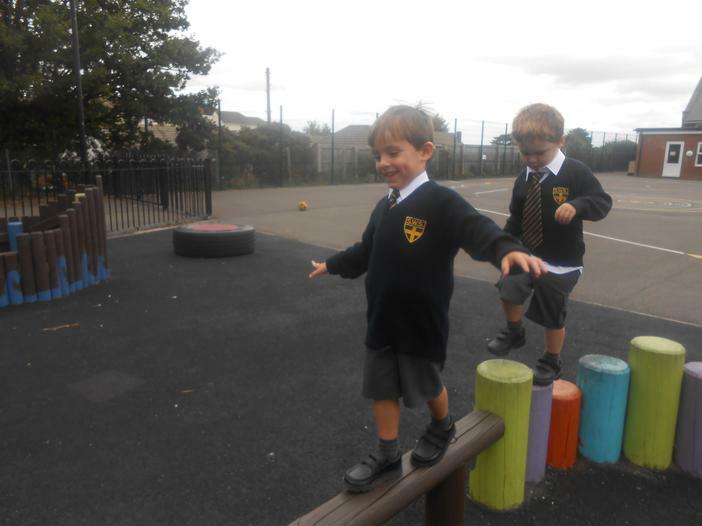 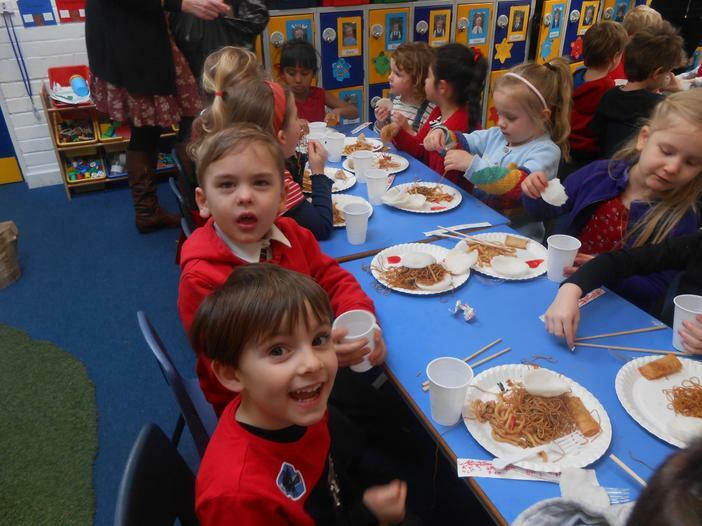 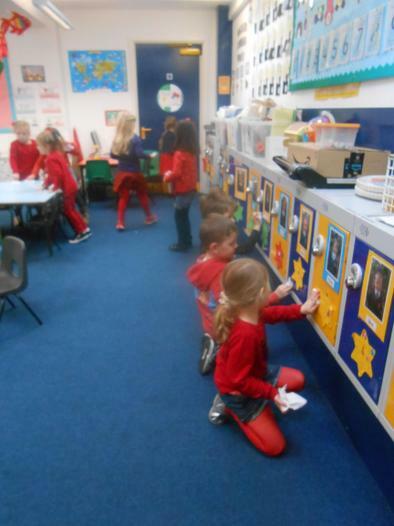 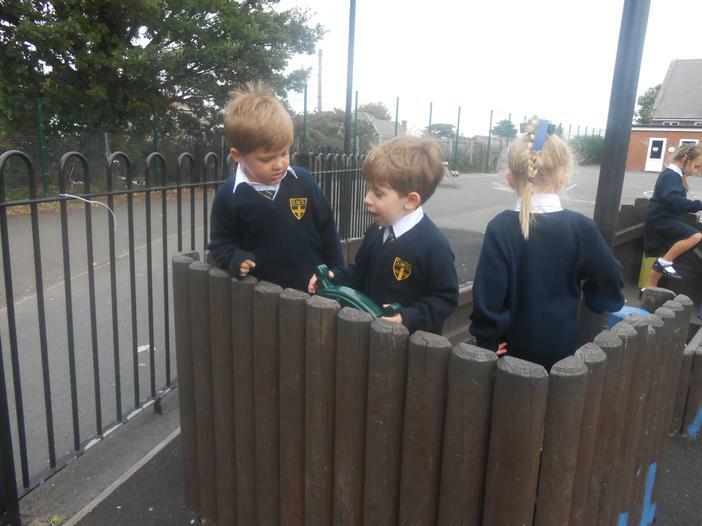 Please enjoy looking at the photos of us below enjoying our first weeks at school!